Andy had a birthday. Abby drew him a picture card. He got a fun new game too. Happy birthday, Andy! 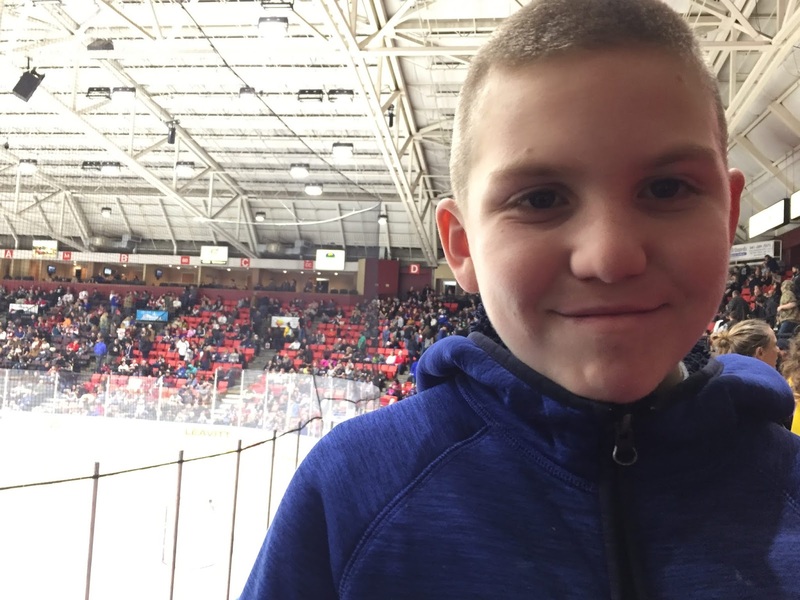 Vincent wrote a letter to an American’s Hockey player who wrote him back and invited him to a game and to a meet and greet at Chuck E. Cheeses. Vincent had a fun time! Sunday ties are awesome. Vincent’s been tying his own for almost a year now. This one is a little long on him, but he likes doesn’t like to tuck the short end. 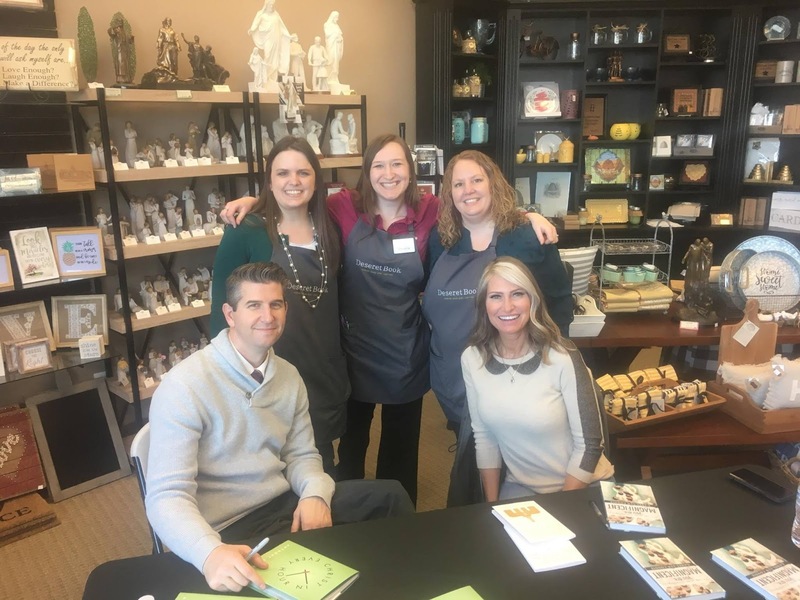 I had a very exciting month at work with THREE great authors who came to see us and did signings while they were in town for a youth and adult conference. Anthony Sweat and Ganel-Lyn Condie came one afternoon. Brad Wilcox came the next day between the youth and adult conferences. 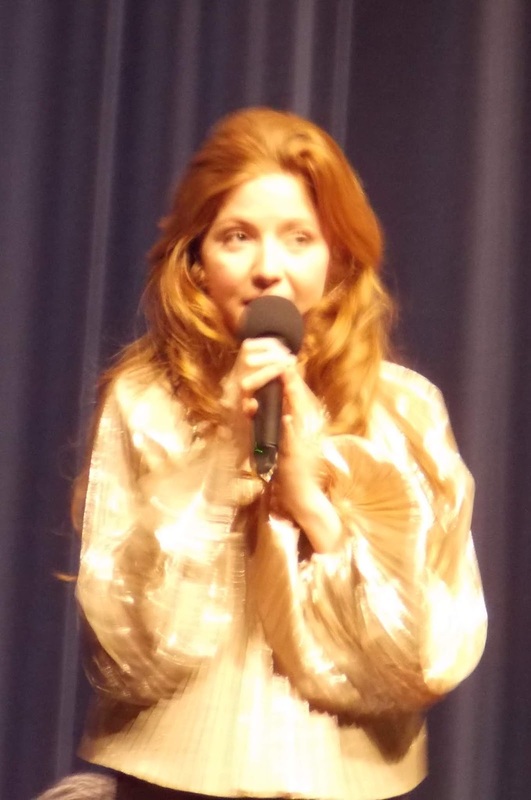 They were all so personable and friendly and just down-to-earth. It was really cool to hang out with them for a little while. 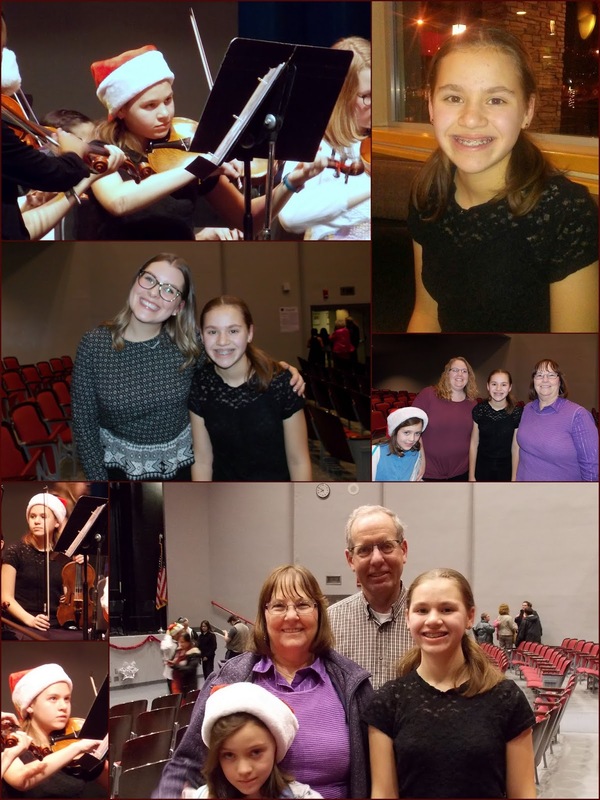 Olivia had a concert at the high school with her middle school orchestra and then we watched the fantastic high school orchestras. 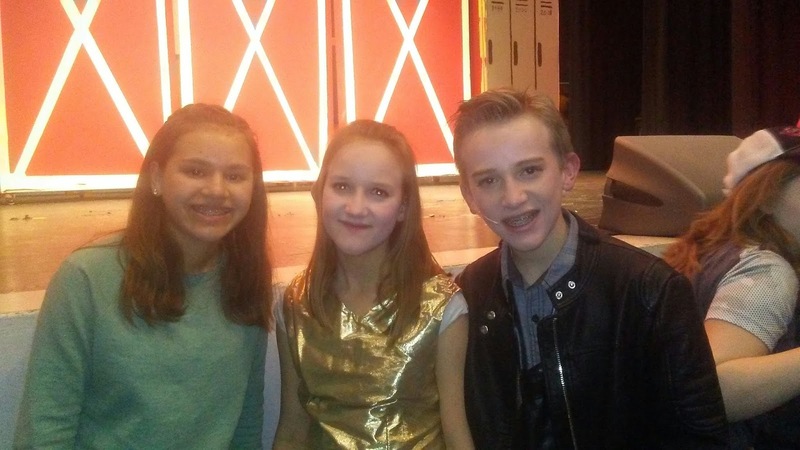 The middle school performed Footloose the musical and several of Olivia’s friends from both school and church were in the show. They did an amazing job! 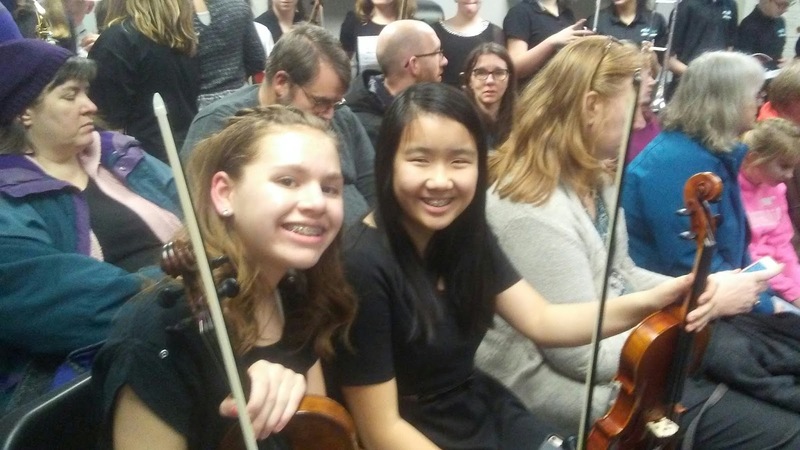 Olivia with her orchestra buddy. Abby has been loving activity days. They learned how to sew and cut out pajama pants one week and a few weeks later sewed them up, and finished up with a pajama party. She was very timid at first after hearing all the warnings about being careful around the sewing machine. She finally decided to be brave and try it. 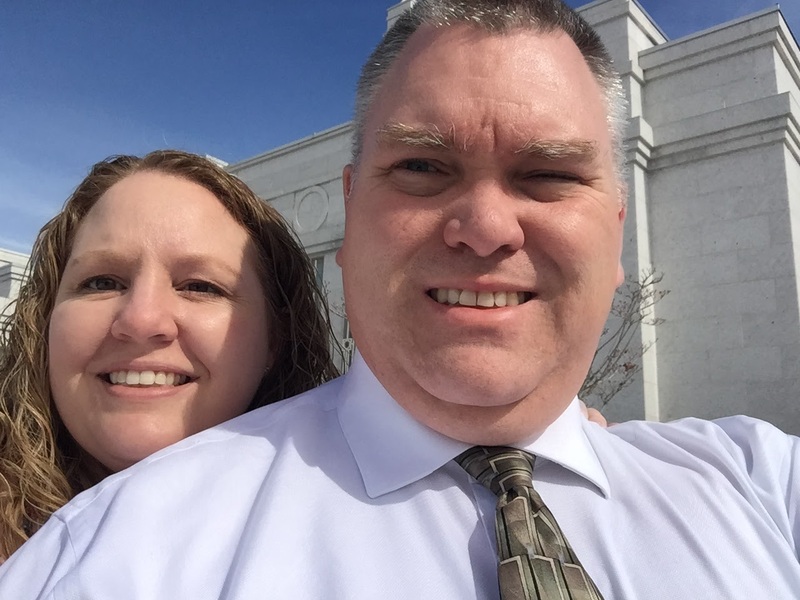 Our Temple was closed for a few weeks, so one Saturday I wasn’t scheduled to work Andy and I drove up to the Spokane Temple. 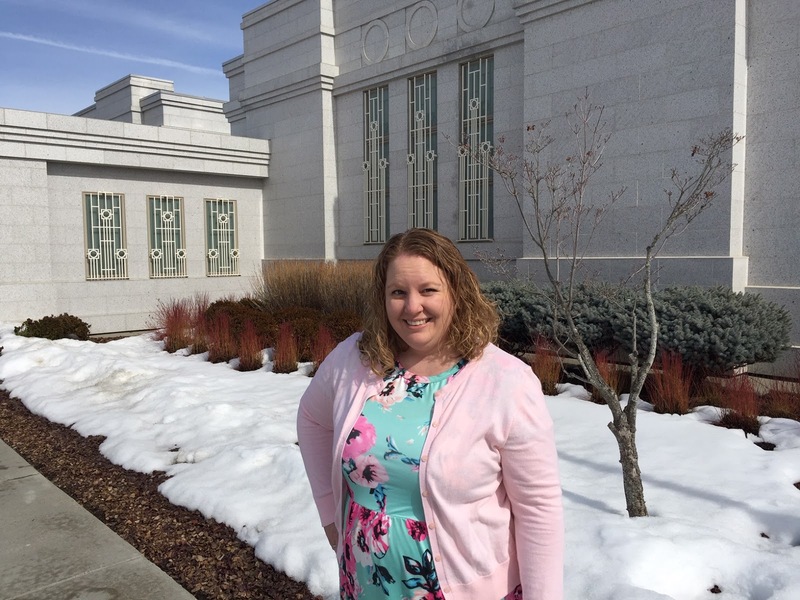 I don’t think I have there been since our Columbia River Temple was dedicated. 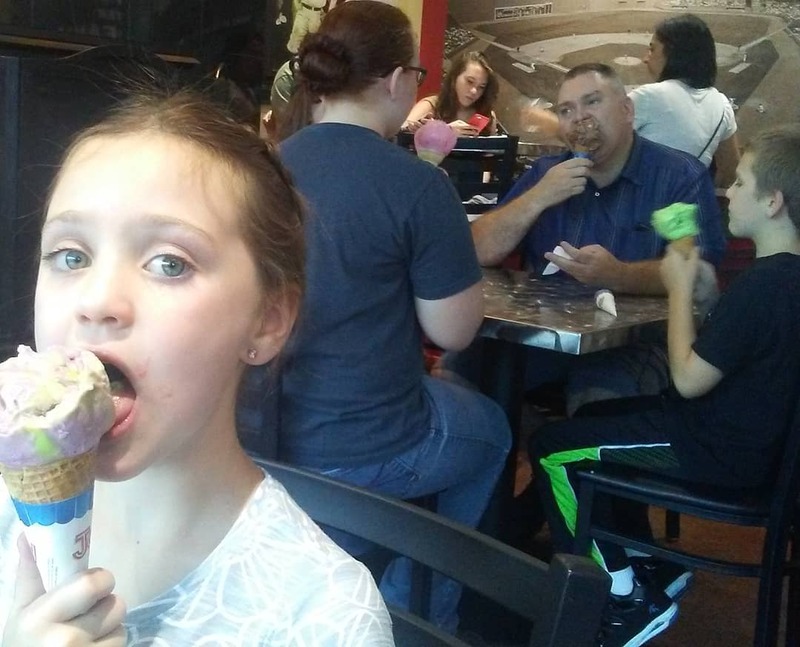 We went to a few fun stores (Railroad store and a Deseret Book-spied on the competition-lol) and went out to eat before heading home. 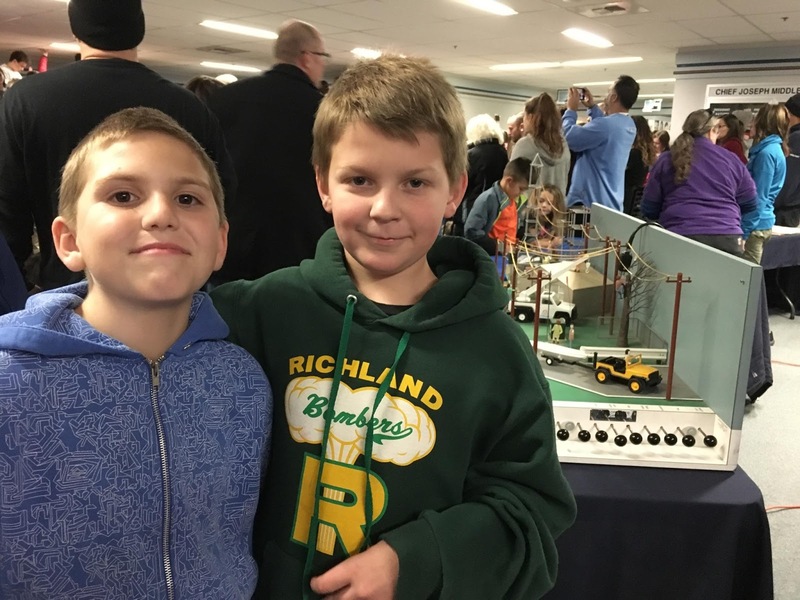 Our Elder’s Quorum hosted an adult unlimited pinewood derby. 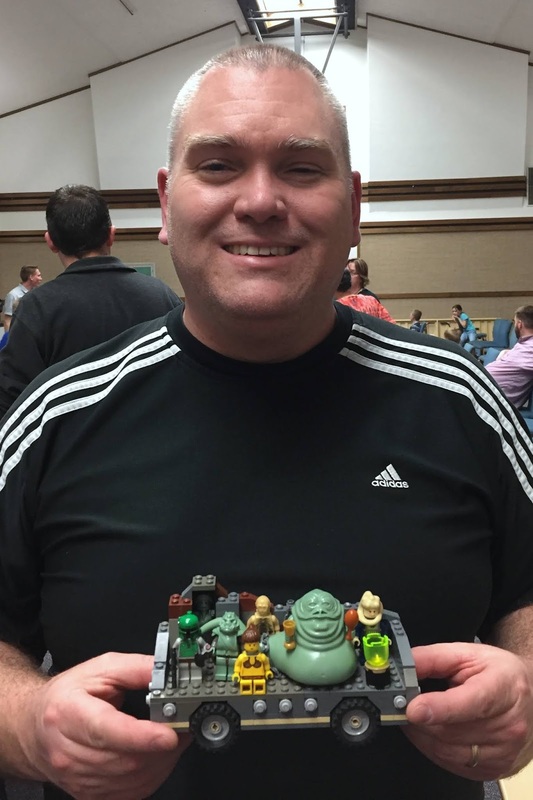 Andy made his out of Legos. It was the Jabbamobile. It didn’t win for speed, but it did win an award for looks. 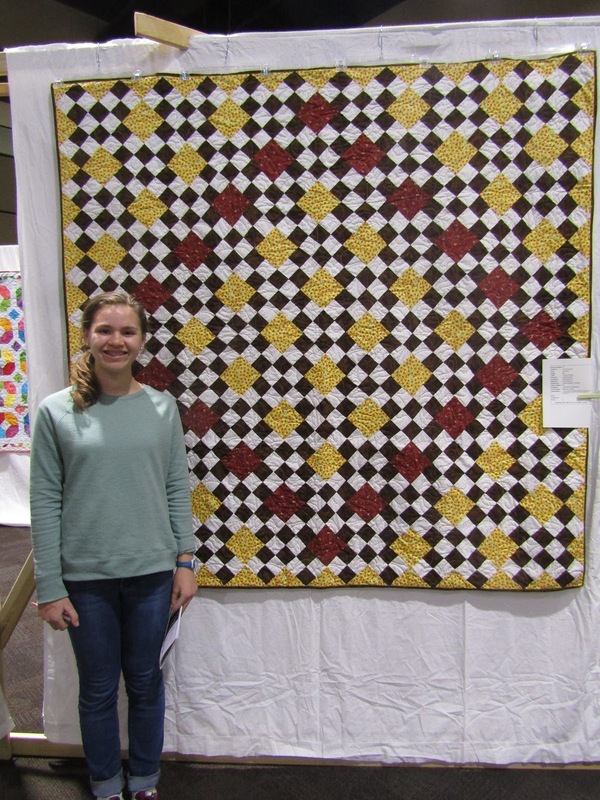 Elizabeth and Olivia had quilts in the Tri-City Quilter’s Guild Show. 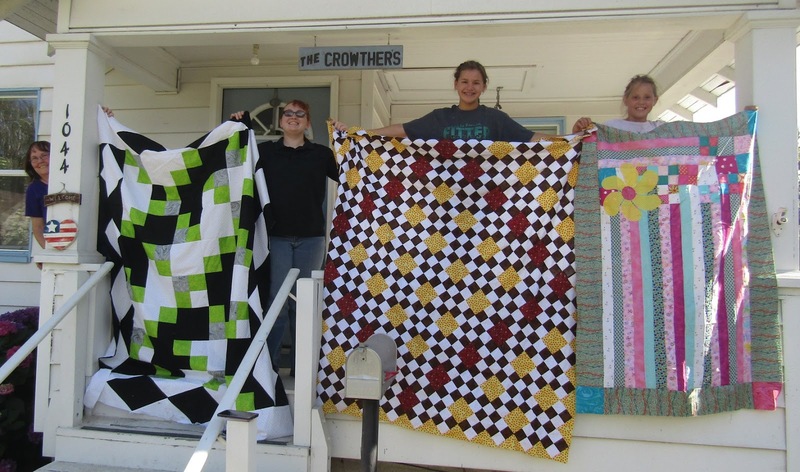 The quilts they made last summer at Grandma Quilt Camp were entered. They went to see them on Friday and Saturday. 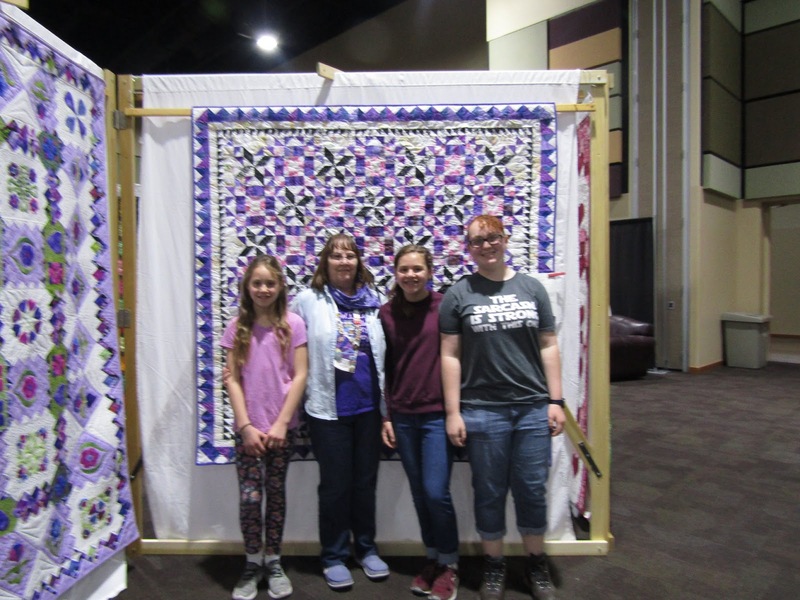 Saturday my brother’s daughter was able to meet them at the Quilt Show and they took a picture with Grandma Mary and the quilt she entered. What a great talent they are learning! 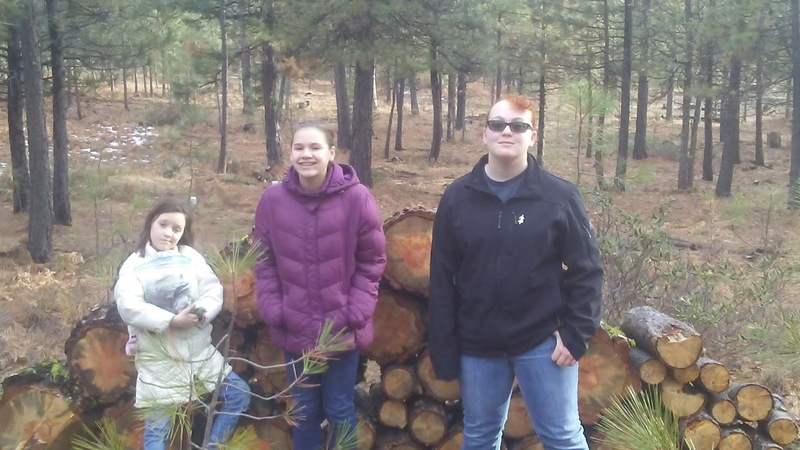 Picture of my girls and my niece. Busy, busy, as always. Time flies when you’re having fun they say. Vincent’s 11th birthday was the last day of January. He had his party that weekend. 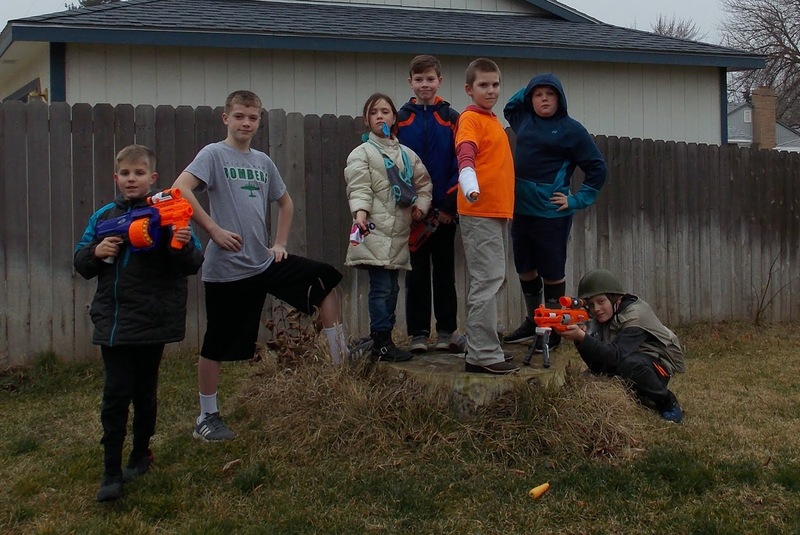 They played video games and had a nerf war and had cupcakes he decorated. Abby joined in the fun. I was at a funeral for a friend’s father during the first part of the party, but they all had a good time playing games and running around even though it was cold. 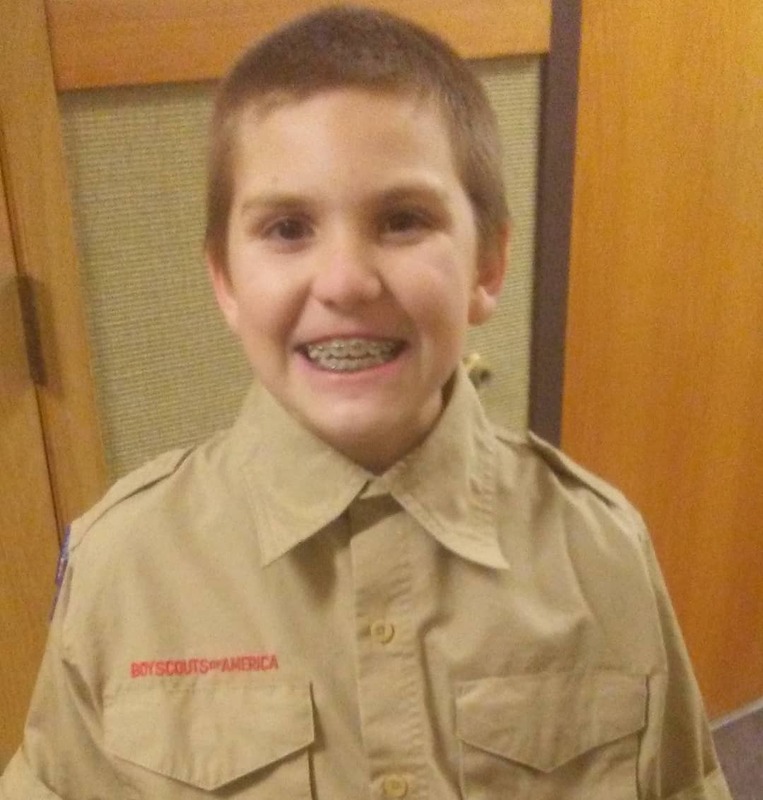 Vincent moved up to the eleven year old BOY SCOUTS. He was pretty excited about it! 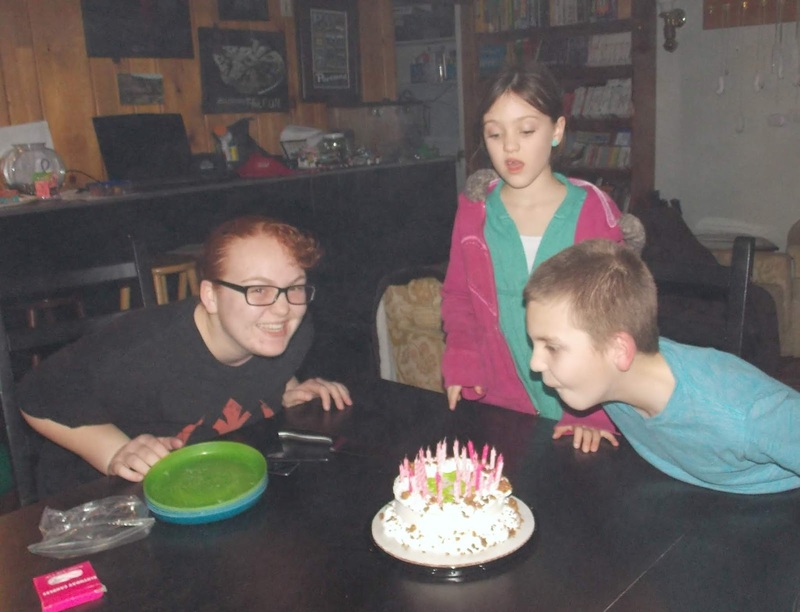 Elizabeth turned 16 the beginning of February. She texted me on her birthday asking about which day would be best for a group date she and some friends were planning. 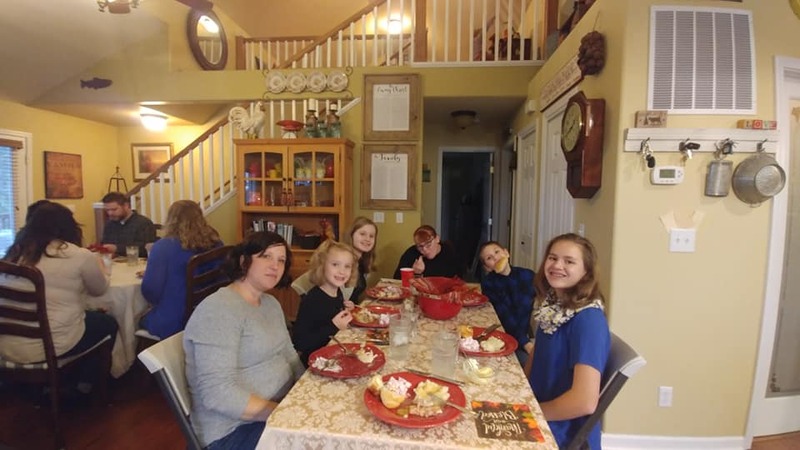 They planned it all out for a few weeks later and played video games, board games, had pizza and cookies and had a fun time together. Then they did it all again the next weekend at someone else’s house. It was snowy here since her birthday, so she hasn’t taken her driving test yet. 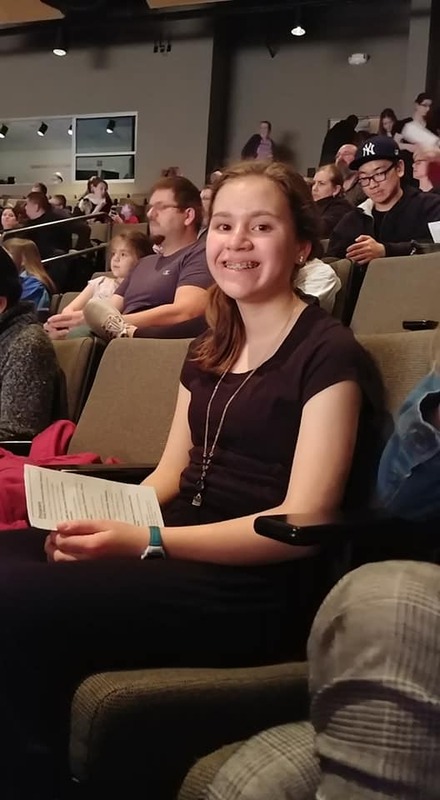 Olivia had a rehearsal for a Solo and Ensemble Festival that ended up being canceled due to the snow, but they played for families a few days ahead, so we were still able to see it. Olivia and her friend Katherine practicing their duet. 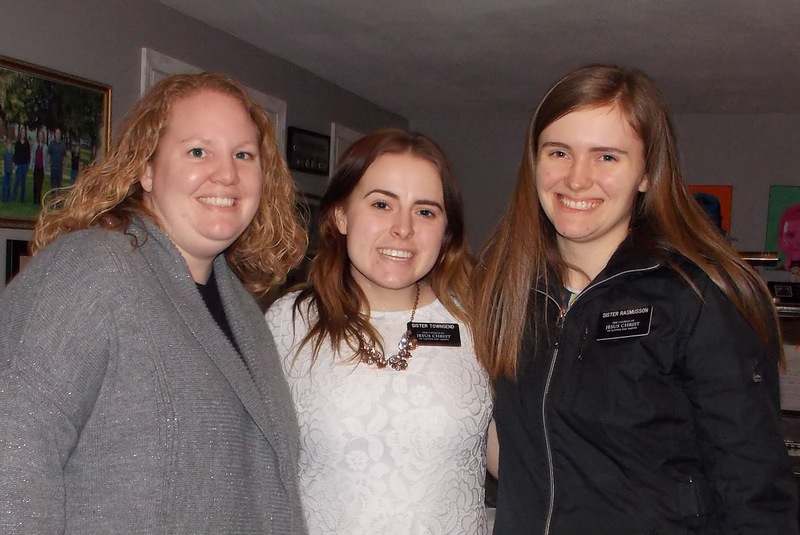 We said farewell to a favorite sister missionary when she came by for a visit. Her companion gets to stay here to train a new companion. 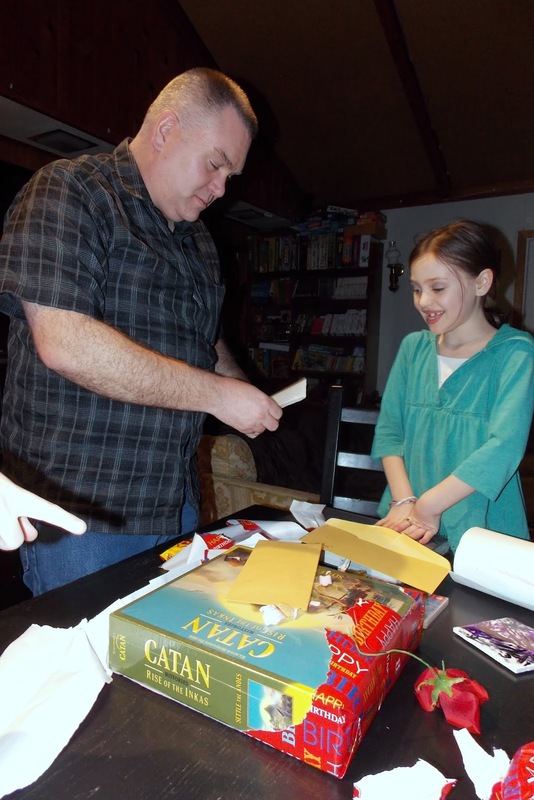 We played some fun games at game night. 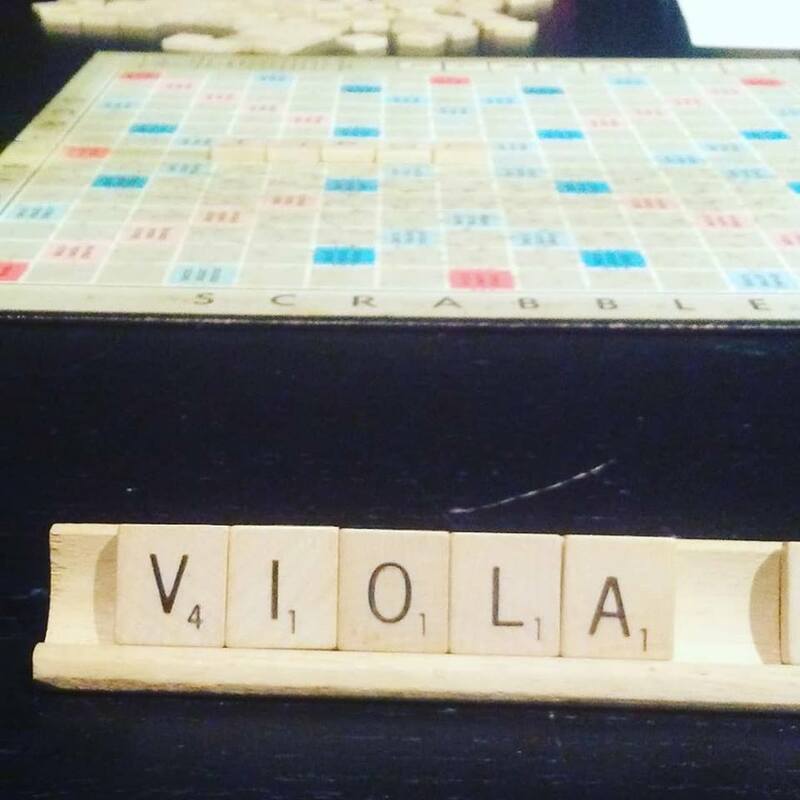 We even broke out my Grandma Zora’s Scrabble set one night. I was lucky and won this time (rare). 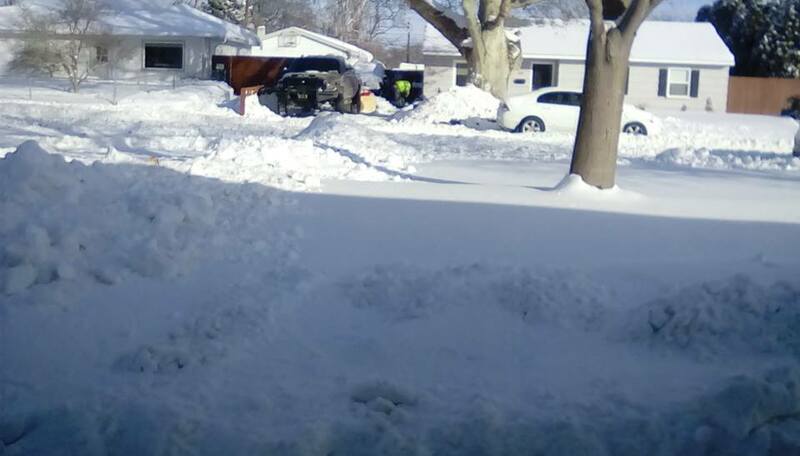 We had a lot of snow for our area, especially so late in the season, and had some snow days. While Elizabeth was home she worked on her painting for Andy’s parents. They requested sepia tones and Elizabeth delivered. 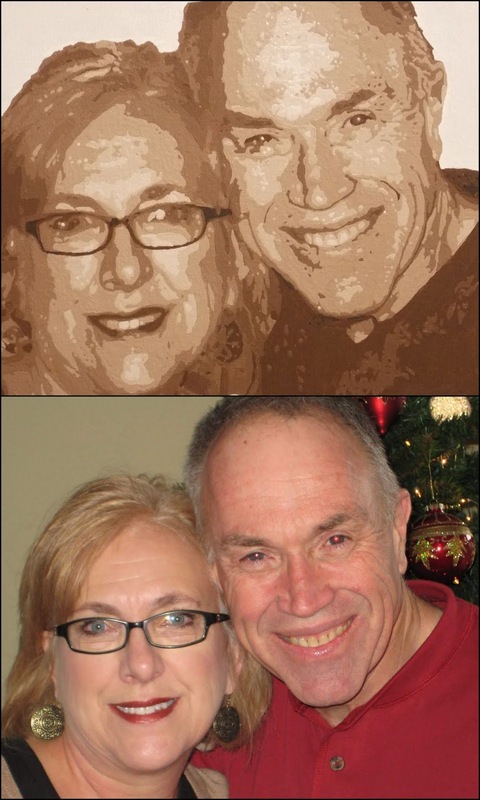 I put the painting next to the original picture for reference. Did I mention that it snowed here? It was a LOT! My littler car has been snowed into the driveway for a month. Things are finally starting to melt, but everything just shut down here for weeks. We had five snow days in a row and then another round of snow the next week that canceled another day for our school and two more for the neighboring towns. One of those weekends was a TEN day weekend with the snow days and President’s Day. Kind of crazy. Here’s our front yard. 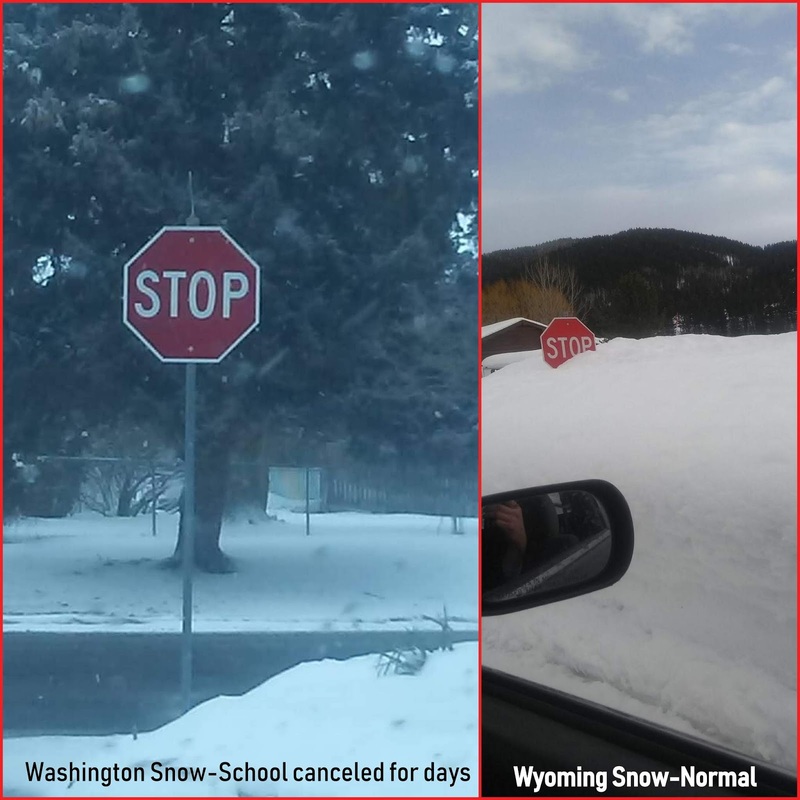 I posted a picture of one of the afternoons it started snowing online and my brother and sister in law sent me a picture of their snow in Wyoming and said my teacher brother had only missed one school day due to avalanche warnings in the canyon he drives through to get to the school. I was only mildly jealous. Glad it’s all starting to melt and I’m so ready for SPRING! Our winter break was extra long this year because our district went to school through Friday, December 21st before starting it. We had two full weeks off still and the kids didn’t have to go back until January 7th. While we had some time together we made a trip up to Andy’s parent’s house in the mountains. 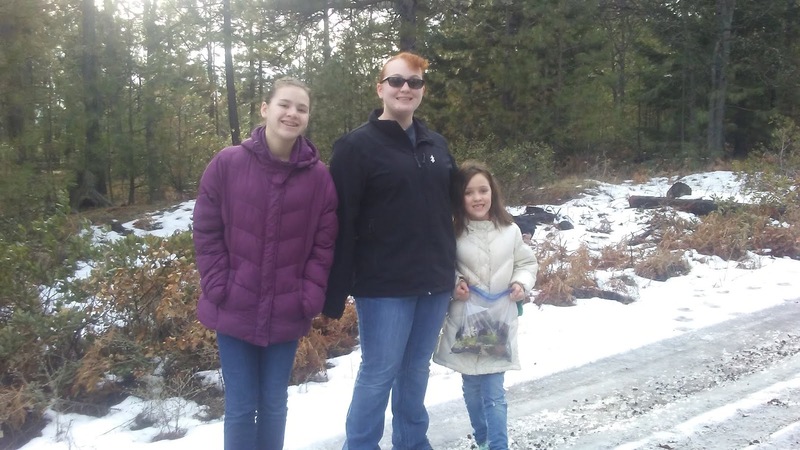 By then most of the snow they had was melted, but the girls still went on a picture walk with me and tried to skate on the hill of ice. 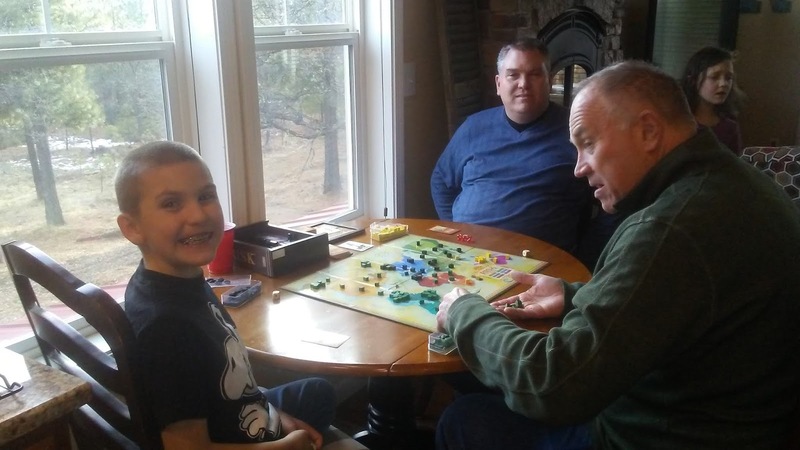 Andy played Risk with Vincent and his dad while we were walking. Then he played with Abby too. And then they were on a Risk kick and wanted to play every day. Luckily, Andy was home and took the week off of work so he was available to play. Vincent loves it when he gets gifts that involve him building things. This one was one of his Christmas gifts. I was very busy working most of the month. We are only closed on Sundays, but I worked all but five of the days we were open in January. It was kind of exhausting, but I still love my job. 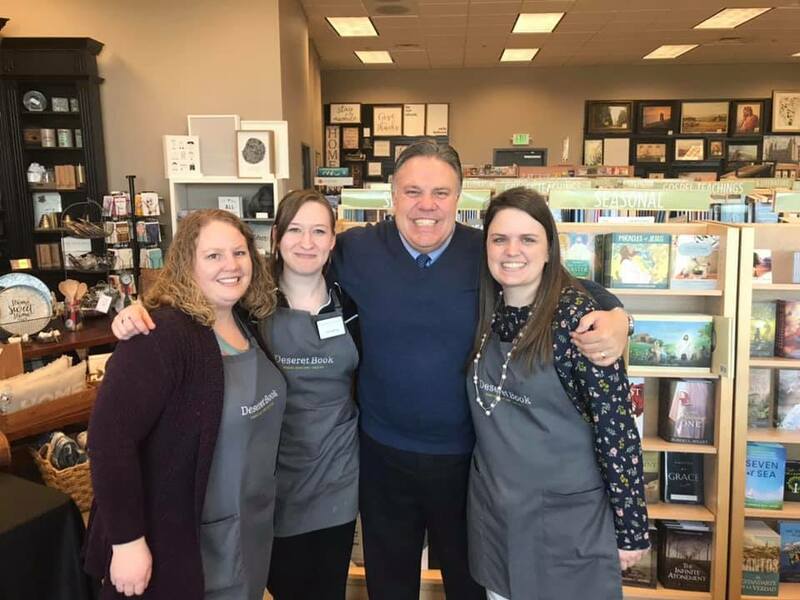 I was also asked to be the manager of the clothing side and the social media for both sides here and two other bookstores they own. Now it’s a little more balanced with the bookstore manager and I and she’s not quite as overwhelmed with all of it while she is finishing her master’s degree. Abby turned EIGHT this month. Time flies! 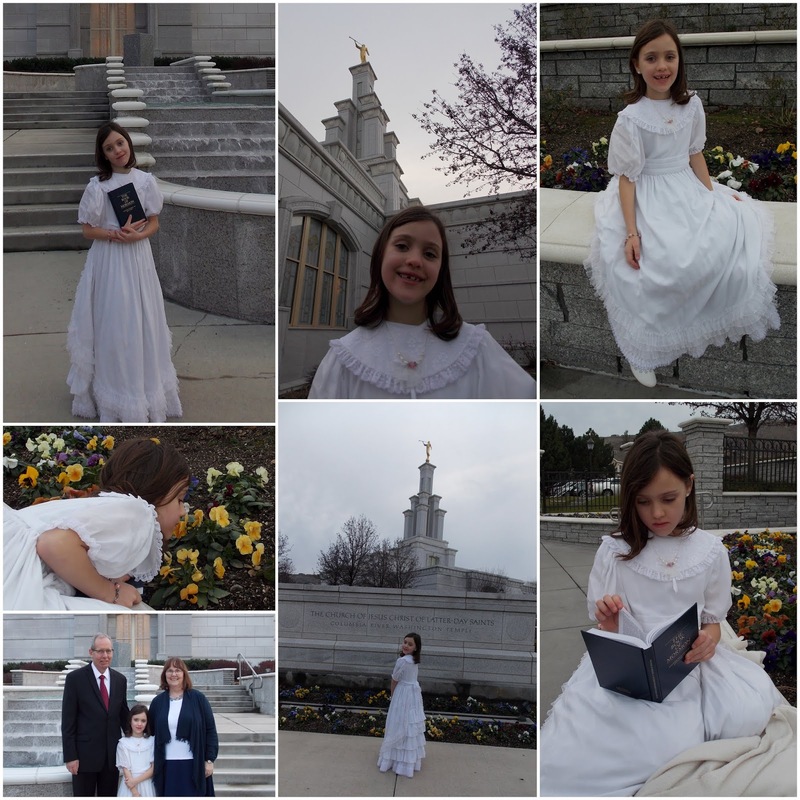 I met my parents at the temple one day to take pictures of her in the dress I wore when I was eight and was baptized. 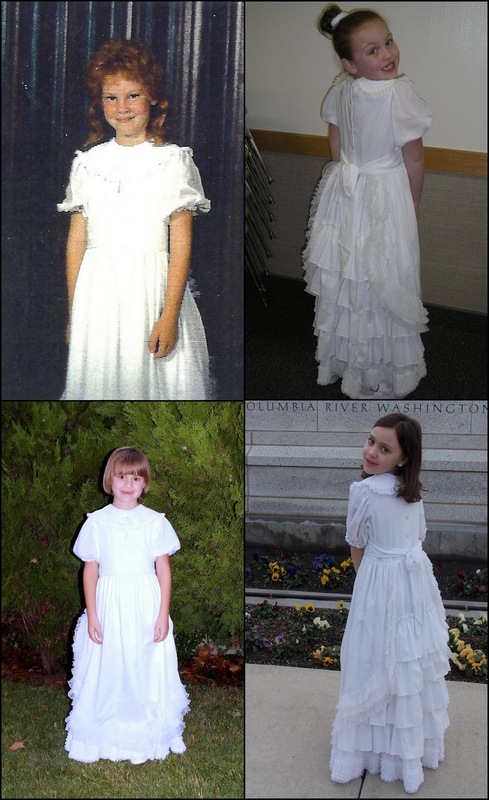 My mom bought it for me and then my sister wore it, Elizabeth and Olivia wore it, and my niece wore it too. Now Abby has as well. It’s a great tradition and so pretty! 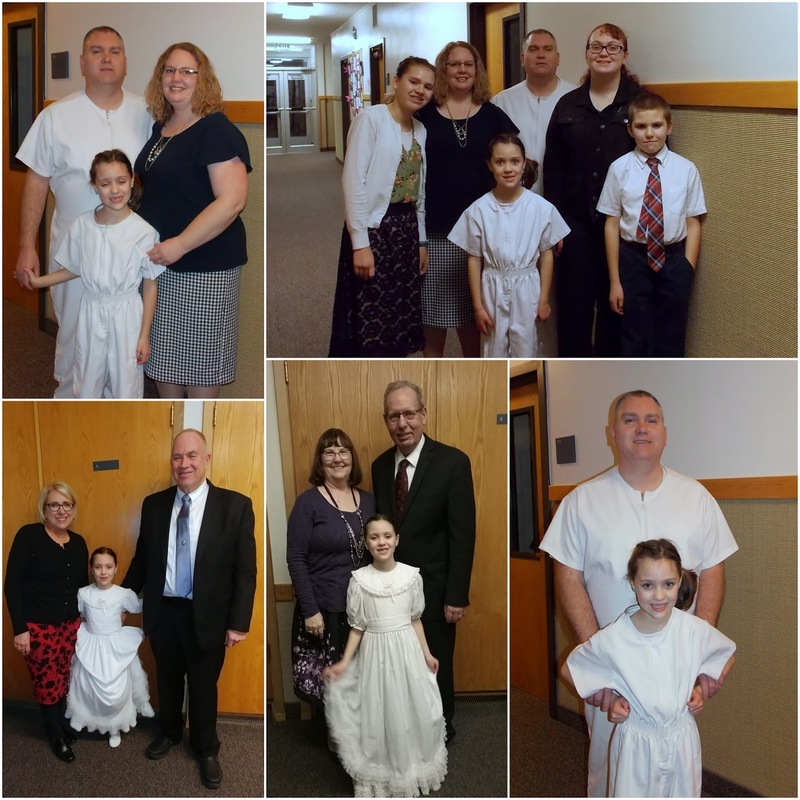 Abby asked to be baptized on her birthday. 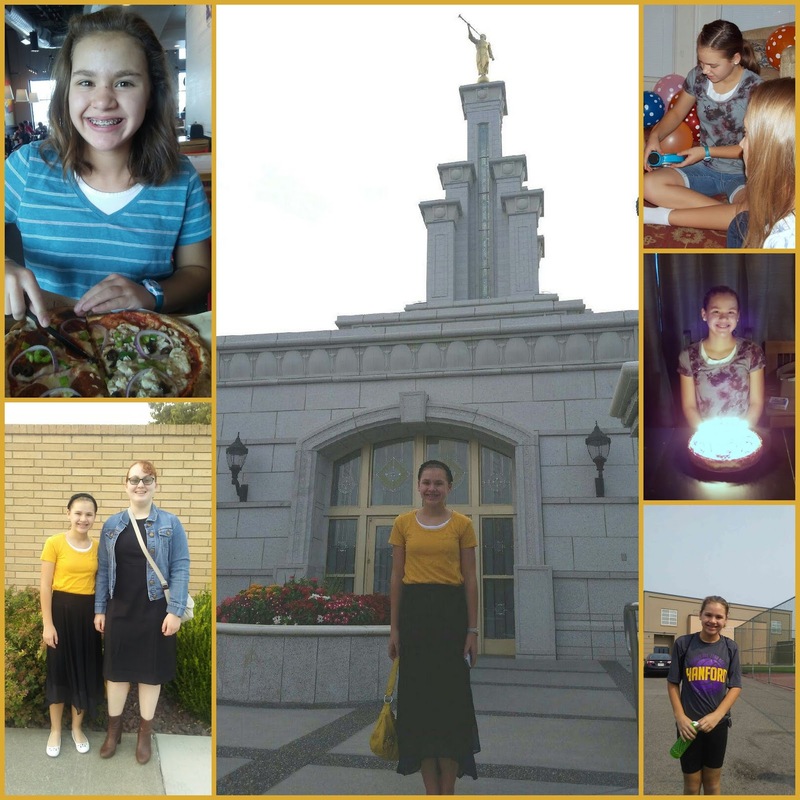 I’m grateful for her decision to be baptized as a member of The Church of Jesus Christ of Latter-Day Saints and her faith in Christ. The following day we had a few friends over to paint birdhouse and little jewelry boxes with Abby for her birthday party and to have some cake. It was casual and fun. Abby and I decorated the ‘8’ cake with M&M’s like a picture we found online. 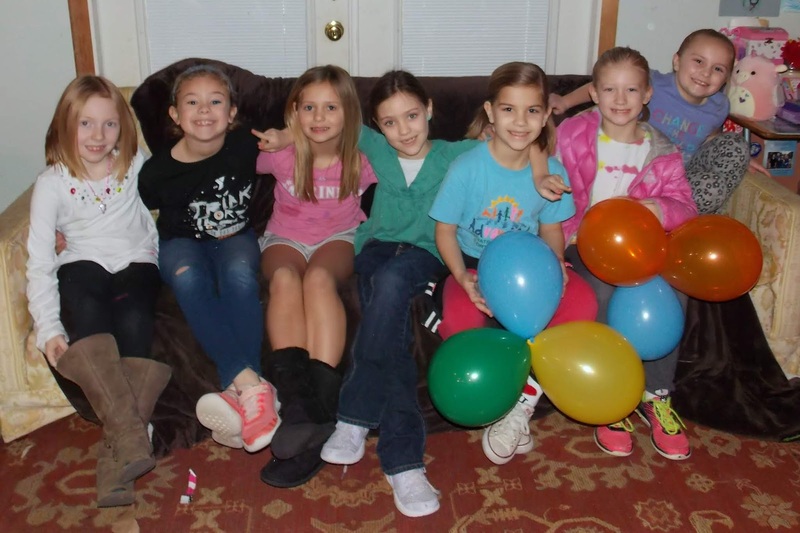 Abby and her buddies at the end of the party. Gotta have good friends. The following week was Vincent’s 11th birthday. 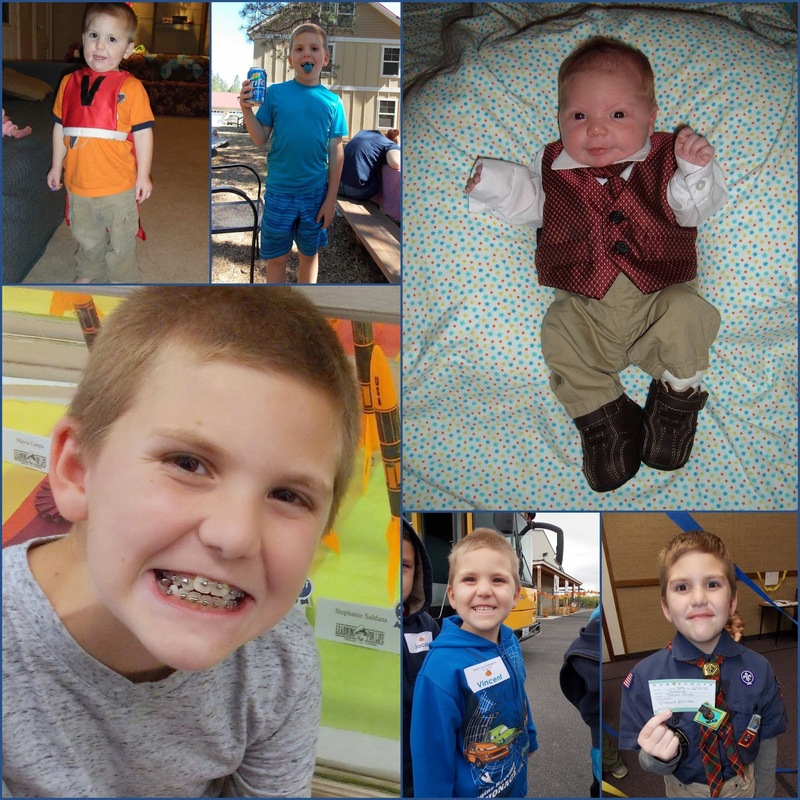 He is learning and growing too and enjoys games and reading and building things. Olivia wasn’t totally forgotten this month. 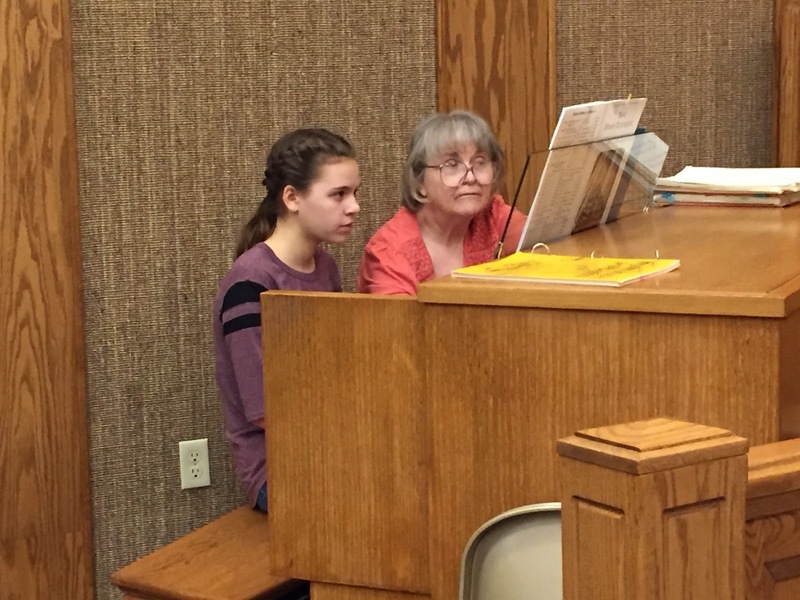 She started organ lessons with her piano teacher. We ordered the special organ shoes and a few organ music books and she had her first lesson. It’s been a great start to the year. Anyway, we started the season with an orchestra concert at the middle school. Andy was out of town for work. Grandpa Paul and Grandma Mary joined Abby and I to watch the concert. It was mostly holiday songs and it was a lot of fun. 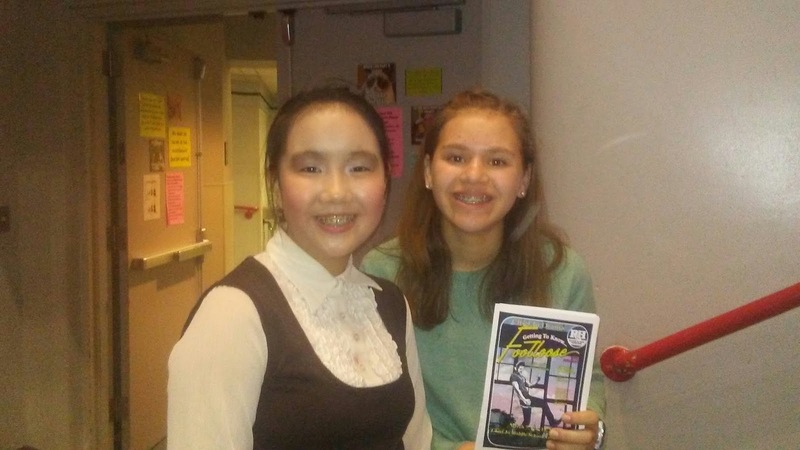 Olivia really likes her new orchestra teacher (new teacher for each year of middle school isn’t great, but the current one is the best one she’s had in middle school, so that’s good.) She did a wonderful job! Videos here here here and here. I sent the links to her teacher who played them for the class the next day. Apparently, the cellos were annoyed they weren’t in the video much. Sorry. Your parents are welcome to send links and take video too. It’s too hard to video the whole orchestra. 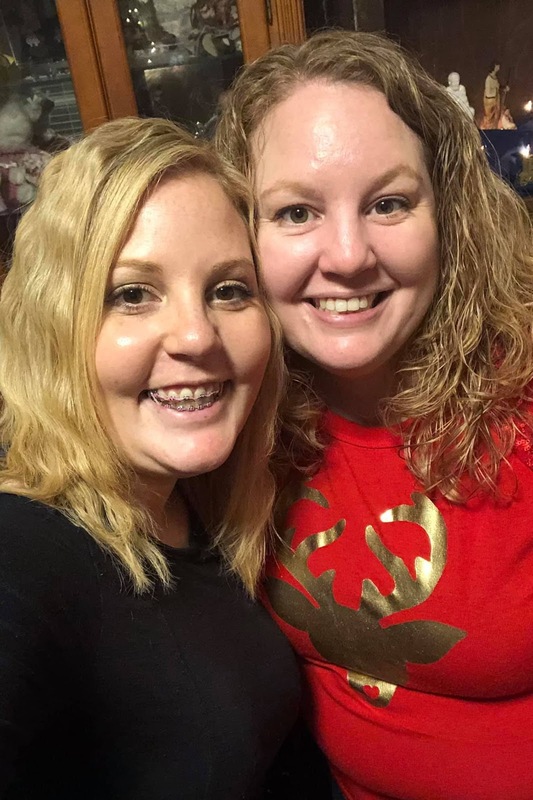 We had our Ward Christmas Party. The young women were in charge this year. They arranged some musical performances by members of our ward. Andy and Vincent were asked to dress up as shepherds and sing a part. Olivia accompanied them on the piano. Video here. Then Olivia was part of a musical number on violin. Video here. 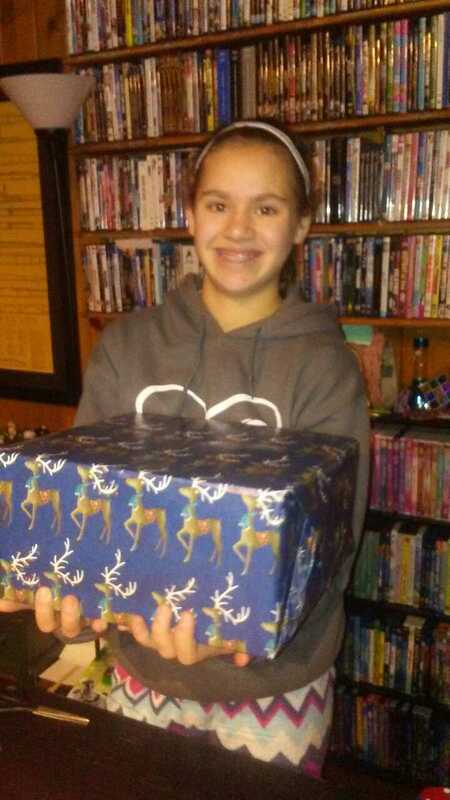 Olivia offered to wrap our presents again this year. It’s the best. I offered her services to others who felt overwhelmed with it this year, but then Olivia got a little cold and was too busy to arrange it. 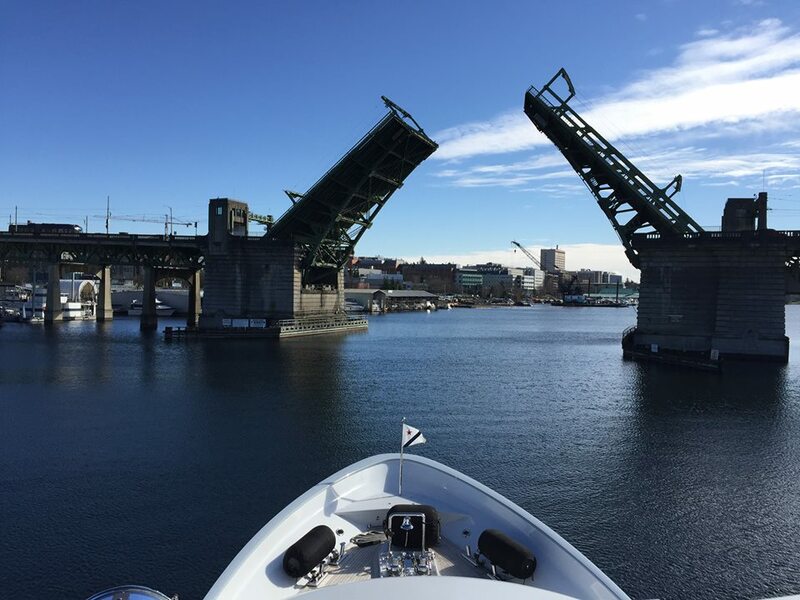 We had some lovely sunny days in December. 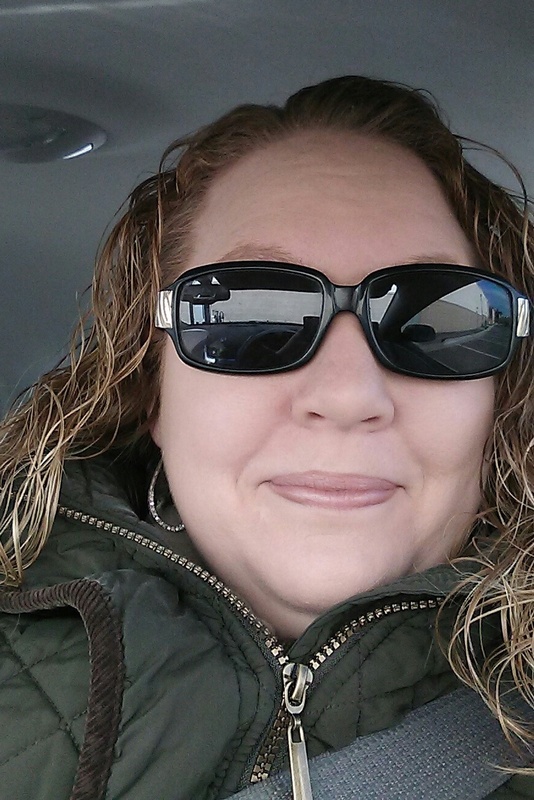 I love being able to wear sunglasses along with my coat in the winter. 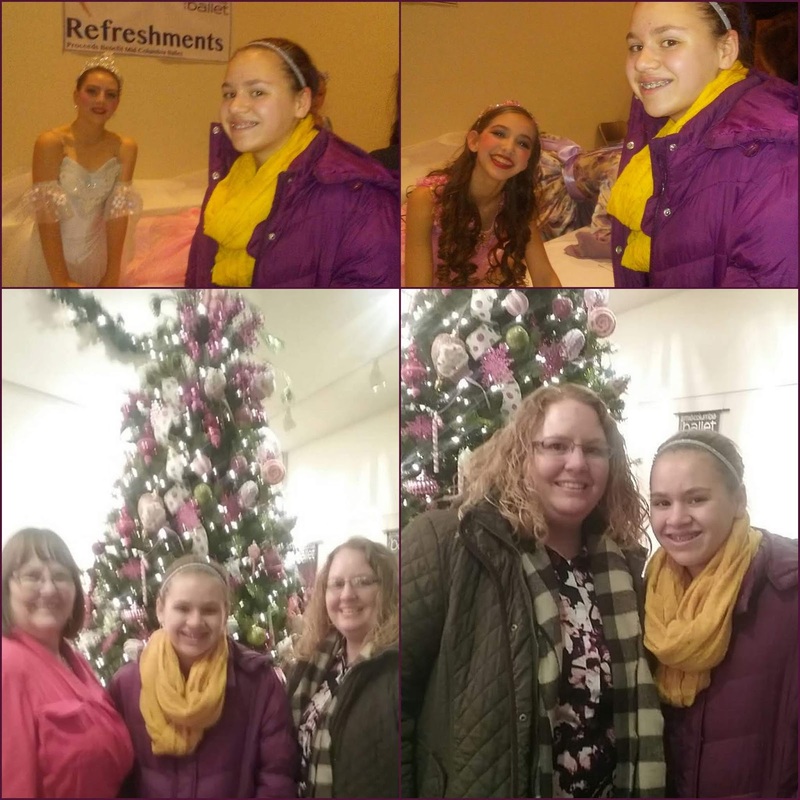 Grandma Mary, Olivia, and I went to the Nutcracker Ballet this year. Some of Olivia’s friends were in it. One of them even played the Clara part! It was fun to go and get their autographs after the show. 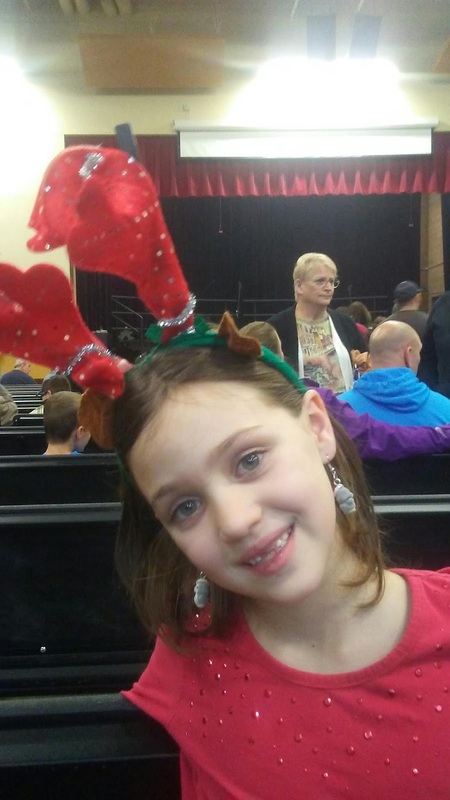 Abby showed off some of her singing and dancing skills at a second grade play as part of the chorus. Vincent played marimbas at the same concert, but I didn’t catch him before running older girls to mutual. 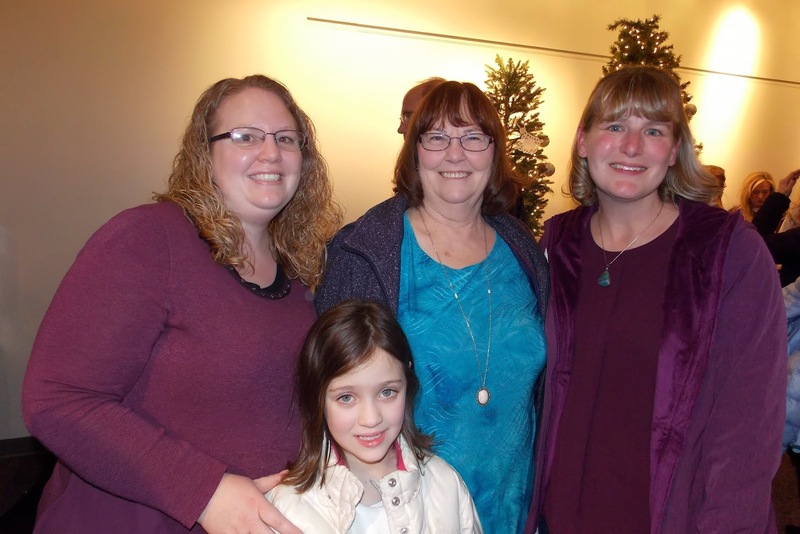 Another December weekend was the concert that Fountain Books hosted with Lexi Walker. It was so great! I don’t have the official photographer pictures of us with her yet… BUT here’s a few I took. Lexi on stage. She is only 16, but has SO much energy! She had a little three-person orchestra and a drummer and a pianist (who composed most of her album and many others) on stage with her. 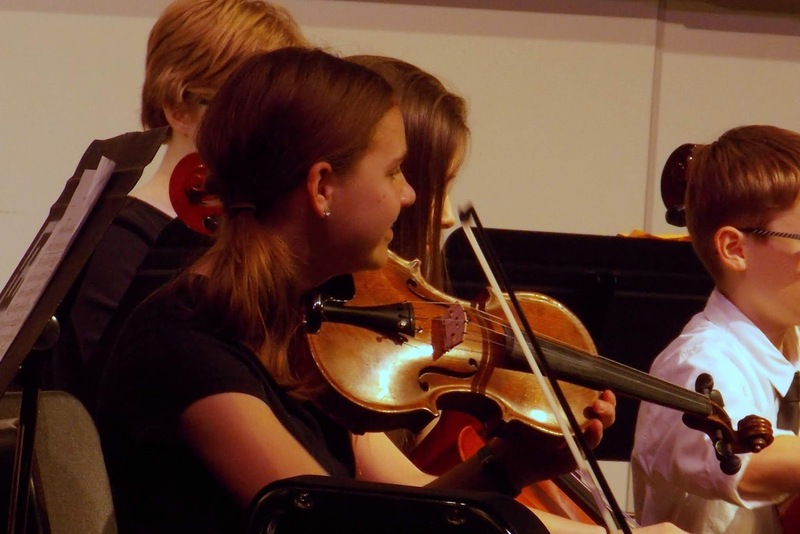 The orchestra was made up of local musicians, one of which was the judge for Olivia’s Solo and Ensemble Festival last spring. 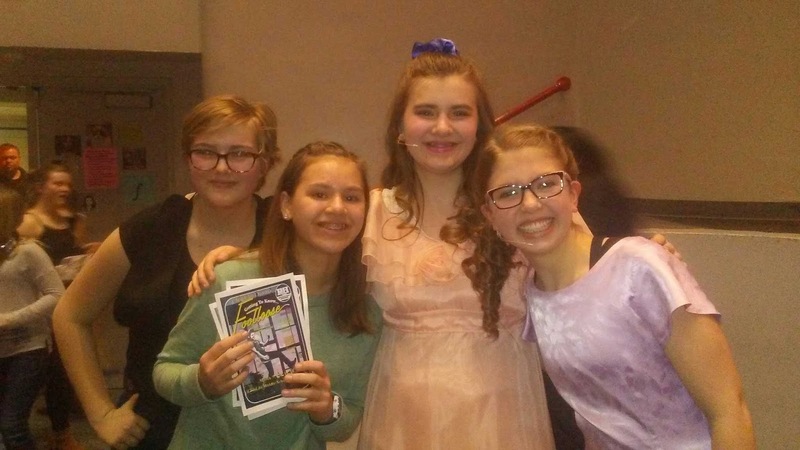 I decided that it would be fun to take Abby to this concert because she wants to be an opera singer (among about eight other careers.) 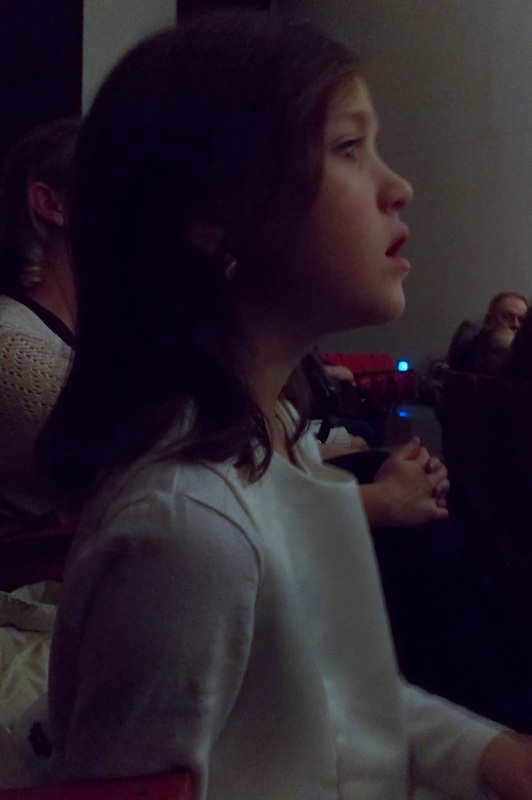 She loved going to the fancy VIP dinner and meeting Lexi and taking a picture with her, but didn’t love the listening and sitting still and not complaining part of the concert… She got better when Lexi sang “Let it Go” from Frozen with Alex Boye which was Lexi’s breakout YouTube video. Check that out here. I invited our neighbor to join my mom and Abby and I at that concert. 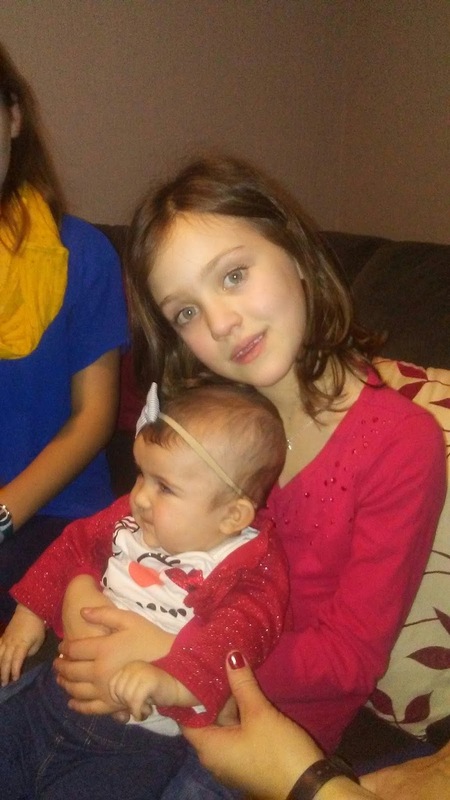 She is one of Abby’s best friends. 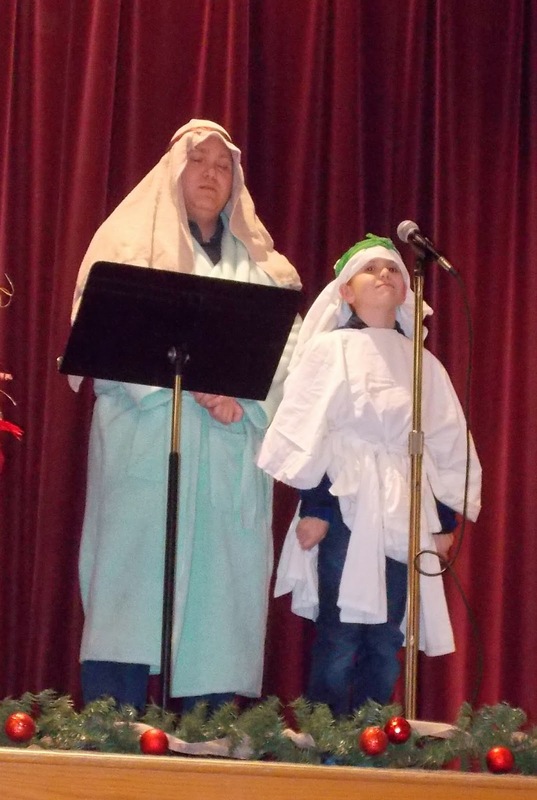 Our friend Nathan was part of a cast of a Reader’s Theater “A Christmas Carol”. Andy had a meeting, so I took Vincent and Abby with me to watch. They had Santa visiting in the foyer and a few crafts set up too. 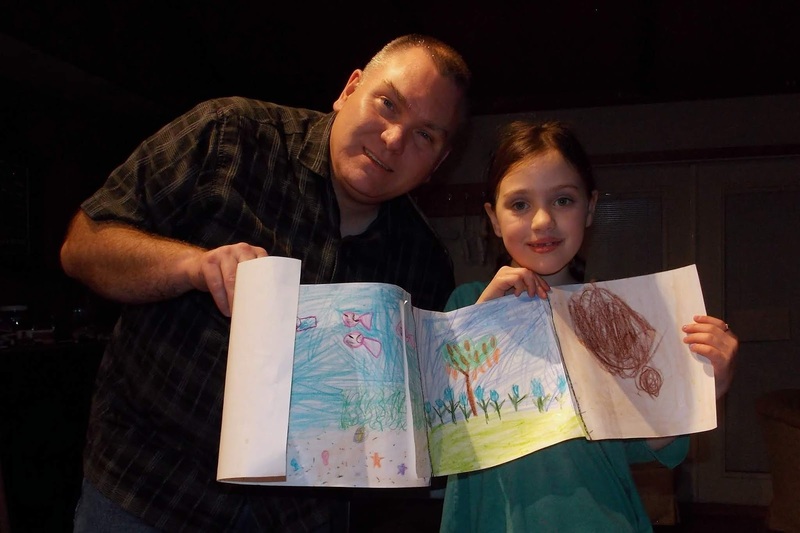 Vincent and Abby did a great job watching the play, maybe because they didn’t know the story and had to pay attention? 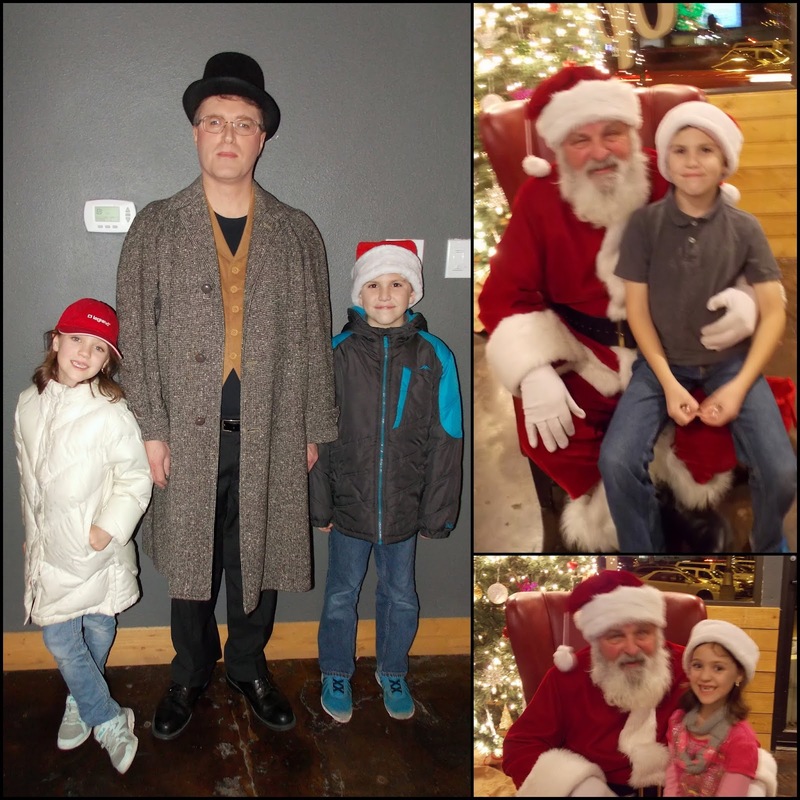 Anyway, Nathan was Bob Cratchit in the play and it was fun to watch. 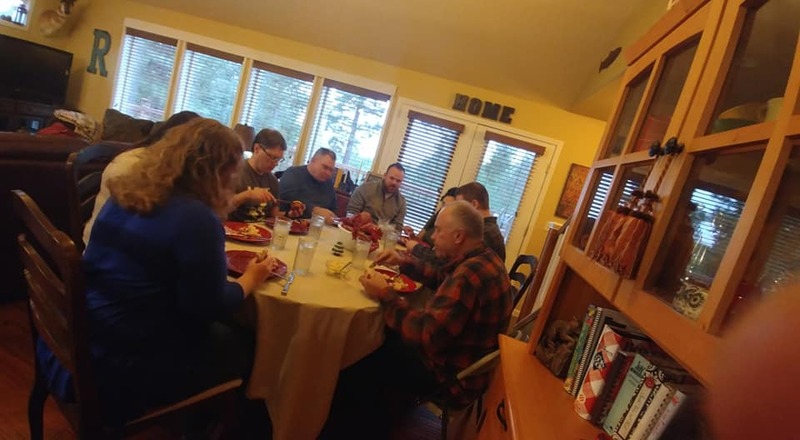 We gathered with the Crowther cousins at my brother’s house for a soup and rolls dinner and a gift exchange on the Eve of Christmas Eve. We were too busy visiting to take pictures…. Christmas Eve (after work), we went to Andy’s sister’s house for dessert and gift exchange and visiting. Abby and Vincent both held their baby cousin and I even got a picture of it this time. We did the nativity puppets my mom made us for Christmas one year and went home to be ready for Santa to come. And Santa did come! The kids liked their gifts and had a little time to play with them before we headed over to Walla Walla to have dinner with my parents and visit. My sister came over with her two boys for part of Christmas Day too. 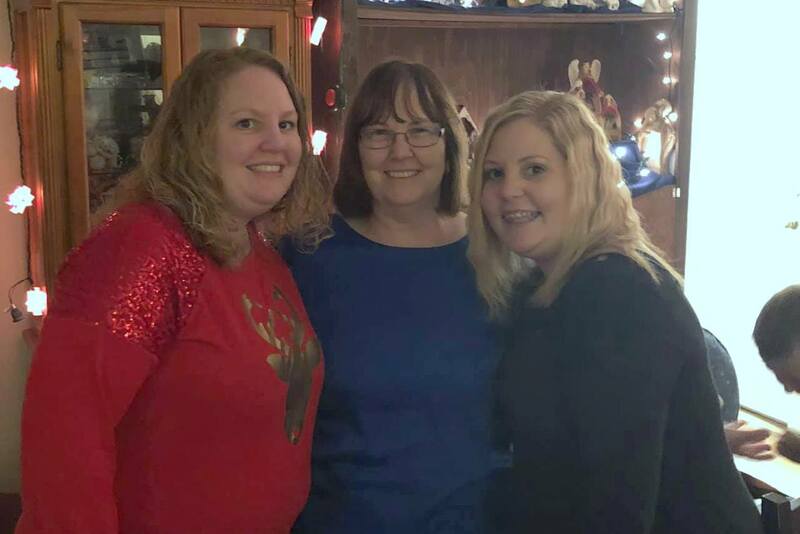 Me and my mom and sister. 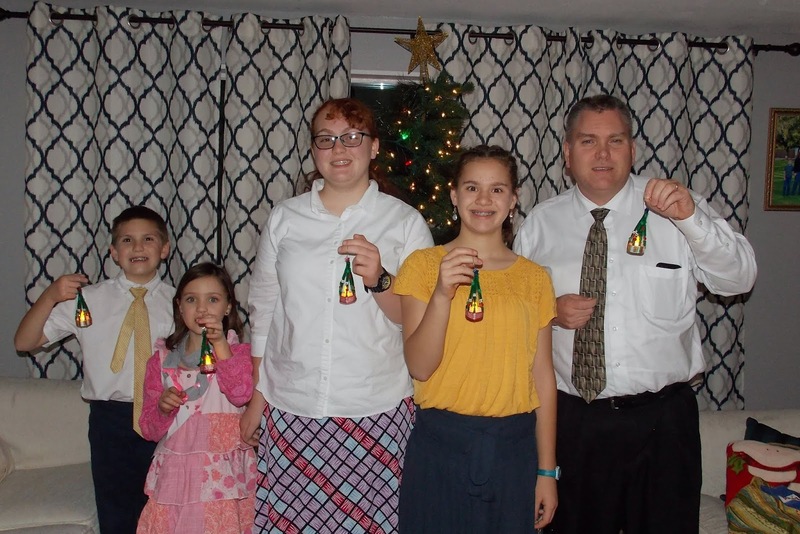 The day after Christmas we arranged a time to go to the Temple to do some baptisms for family names with my parents and two of my brothers and their sons (Elizabeth wasn’t feeling well, so I saved some names for her to do this month.) It was extra awesome because one of my nephews was able to baptize his brothers in the ordinance. 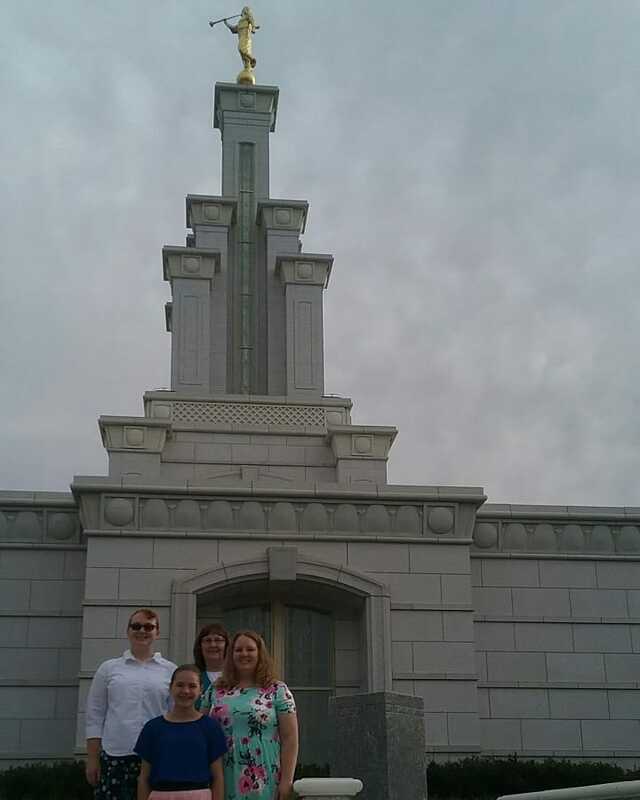 Time spent in the temple can’t be beat! 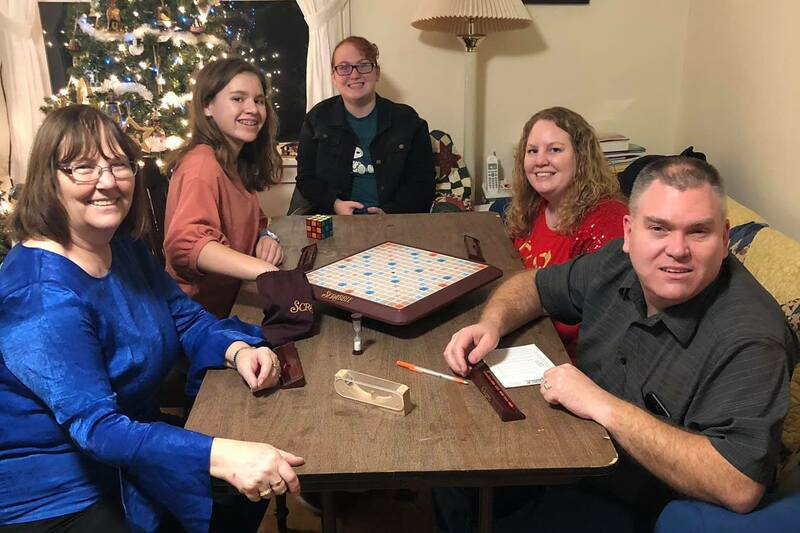 We spent a low key New Year’s Eve relaxing and playing games with friends. 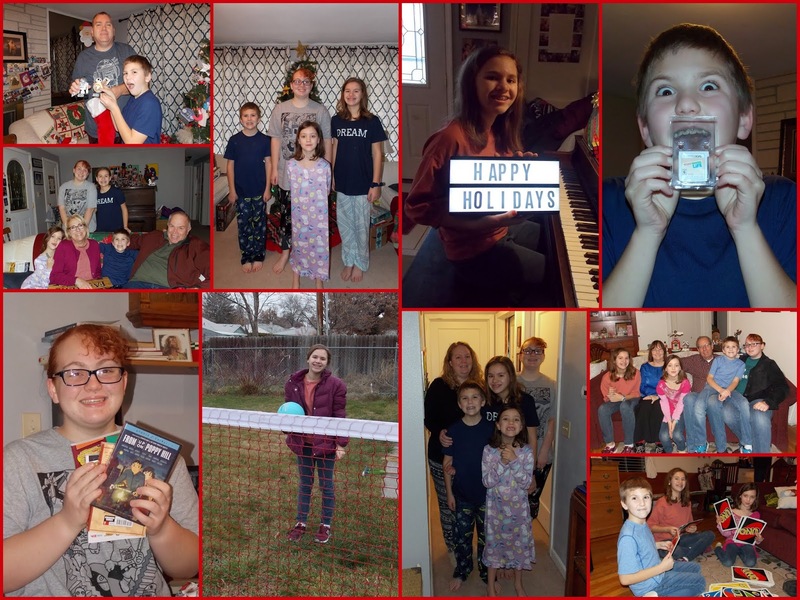 I’ve worked quite a bit this month, so it was lucky that Andy was able to take the week of Christmas off to hang out with the kids while they were home during Winter Break. I’m so grateful for scriptures and all that they teach me. I accepted a challenge from a friend this year to read the Bible by the end of the year and just finished. 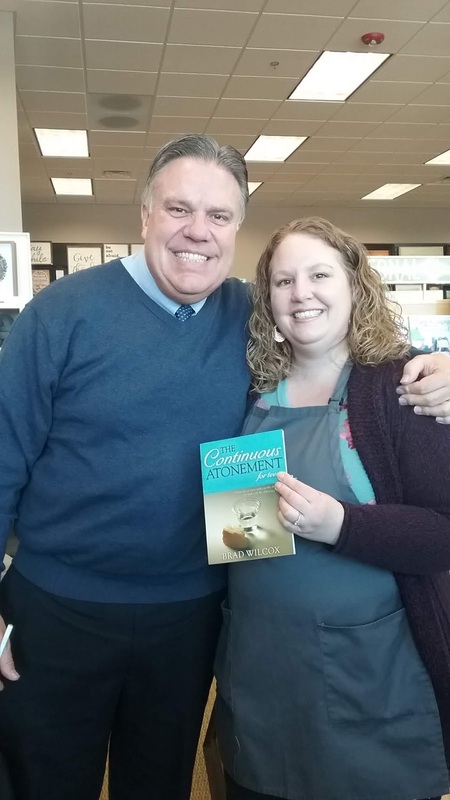 It was good to remember all of the things that were told to people all throughout time to bless and benefit them and to help them to return to live with Heavenly Father again. I think it’s easy for us to say, “Why didn’t they just listen to Moses? All they had to do was keep the commandments and they wouldn’t have had to wander the desert for 40 years!” But it’s harder for us to examine ourselves and whether we are doing all that we need to do to not be ‘wandering in the desert’. I was surprised nearly daily how the Old and New Testament reading I did was often about the same things. Scriptures are for us to read and to learn from. This year I’ve also finished reading Doctrine and Covenants, Pearl of Great Prices, and The Book of Mormon with Andy and The Book of Mormon by myself as urged to by our living prophet today, Russell M. Nelson, in October. So many truths and experiences are included there that are written for us and apply to our day and the challenges we are faced with. As I read and marked the names of the Savior in my own study, I realized just how often His name is used in The Book of Mormon. The whole book is truly another testament of Jesus Christ. 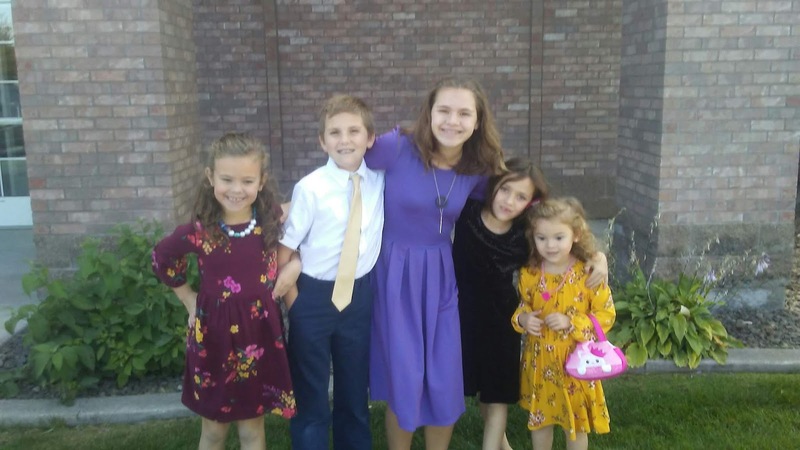 Through the scriptures I can better see how Heavenly Father sees us as His children and how to better parent my children. I can feel when He sends prophets to speak in His name to plead with the people to repent and turn to God and to partake in His blessings and find myself pleading with them too. I feel as though I have learned quite a bit more by immersing myself in the words of God more this year and found ways that I can improve my own life and strive to become more like the Savior. I’m exited about the changes to church curriculum this year and the goals I have made. We have had a lovely holiday season so far and have plans with family to enjoy the rest of the season. We had a wonderful Sacrament Meeting this morning where Abby (our youngest) was asked to speak about the Christmas Story. She was listed as a youth speaker on the program. Link to the video is here. 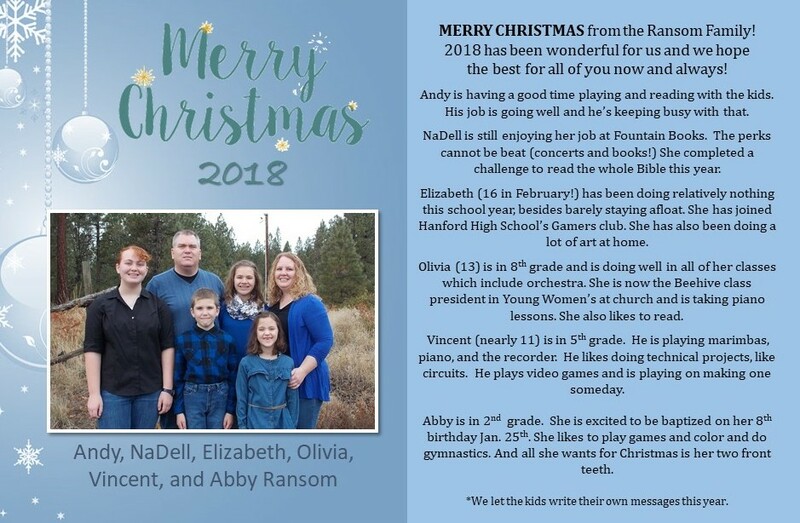 Abby wrote the talk and Andy typed it up. 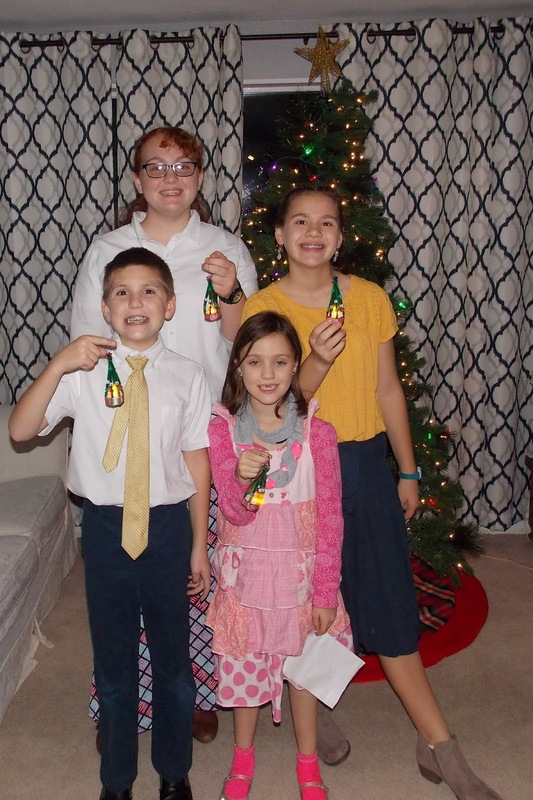 We videoed the last practice reading at home before church. The story of Christmas starts when an angel came to Mary and said she would have a baby who would be the Son of God. Joseph was a carpenter and he was going to get married to Mary, but when he found out she was going to have a baby he changed his mind, but an angel came to him in a dream and told him Mary’s baby would be the Son of God, and that Joseph should marry her. The angel also told Joseph to name the baby Jesus. It was almost time for the baby to come, but Mary and Joseph had to travel to Bethlehem to pay taxes because Joseph’s family came from there. When they got there Jesus was born. He was born in a stable because all the inns were full. Shepherds were watching their sheep when an angel came to them and told them Jesus was born and that they should go to Bethlehem to see Him. Wise Men saw a new star and they knew it was a sign that the Son of God had been born. They traveled to see Jesus so they could give him gifts and worship him. This is what Christmas means to me. Christmas is when we celebrate the birthday of Jesus. It’s like His party, but we don’t need an invitation. We don’t give Jesus presents like we give presents to our friends and family, but we give to Jesus when we keep His commandments. Jesus gives us presents. He gave us a world to live on. He gave us a way to come back and live with Him again. He forgives our mistakes when we repent, the same way as our friends forgive us when we say ‘sorry’ to them. Christmas makes me happy not just because I get presents, but it reminds me that Heavenly Father and Jesus are there to help and protect us, and the Holy Ghost is there to help us make good choices. Vincent and Abby had a lovely time performing several piano pieces at Ribbon Fest today. Vincent earned 11 ribbons and Abby got 8 ribbons. I even got a picture of them with their teacher from our ward, Audrey Clark. She is so patient with them and encourages them so much. Abby just started lessons this fall with her (after some summer lessons with a college age girl we know). Vincent has been doing lessons for about three years. 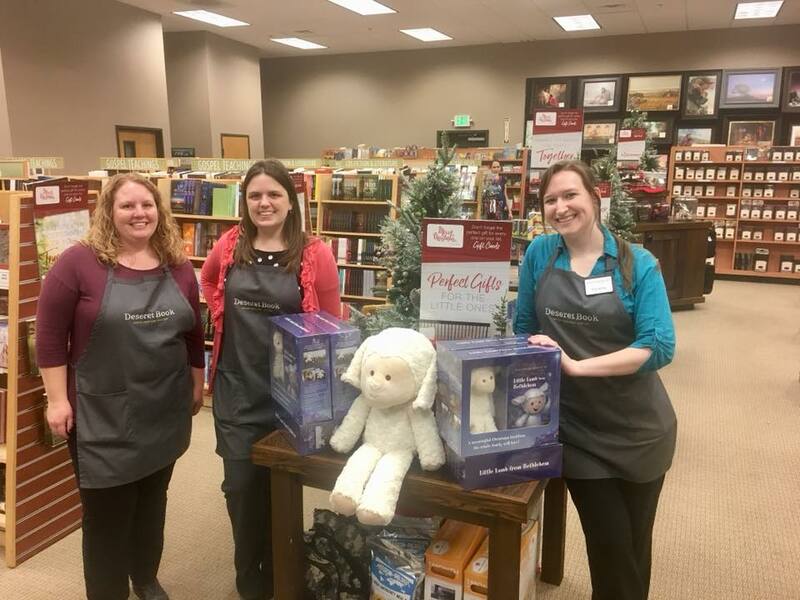 We hosted a Nativity Sneak Peek at work early in November. The owner, Ben, wanted a picture of the three of us (our seasonal gal had the night off). It’s so much fun to work at Fountain Books. I absolutely love it (I mean, I’d still rather hang out at home in pajamas and read, but if I need to have a job, this is my dream job!) My co-workers are great and we all get along so well. Even on my days off, I end up doing work related things…. like within one week, I helped set up the book fair at the middle school on a Friday, worked Saturday, worked Monday and Tuesday, and then on my day off that week (Wednesday), hung out at the middle school from 8am-7pm so the chairperson could have the day off and to help cover the parent-teacher conference time that evening, and then back to work Thursday, help take down the book fair Friday and then close at work. It was a crazy week, but I love books. Also, bonus, I was able to compile some pretty great lines from the middle school students. 2. “Why are the little things back there? I can’t see them (ie: play with them and possibly ‘accidentally’ put them in pockets). Answer: You can see them. If you need to see anything closer, I can show it to you…. -We put the small trinkets up on a counter behind a table with one of the book fair helpers there to assist with bigger items on the table. It’s been MUCH nicer the last few years. 6. “Can I take pictures of the books I want to show my mom?” Answered by librarian: Sure. Then she took pictures and was leaving. The librarian told it would cost her $1 a picture due to copyright laws. The girl was about ready to delete them all before the librarian told her she was joking. 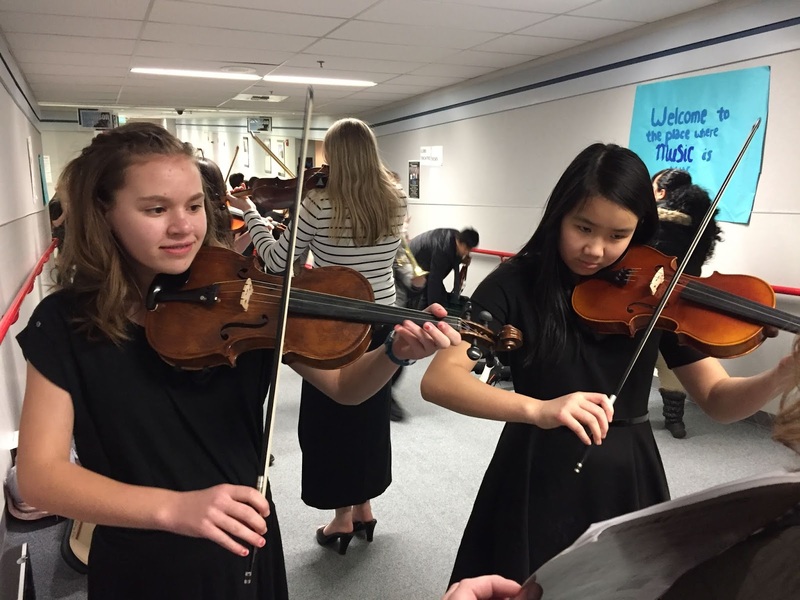 Olivia was one of the middle schoolers invited to join a CBMEA (Columbia Basin Music Educator’s Association) Honor Orchestra composed of mostly 7th and 8th grade students from Richland and Kennewick. CBMEA invited Kirk Moss (famous composer and conductor) to arrange three pieces for the kids to learn and he came to teach and conduct them Friday afternoon and most of Saturday. I love these extra opportunities for her to learn! She also got nearly straight A’s this quarter, so she got her dinner reward with Andy and I and our buddy Nathan too. Olivia asked if she could cut Abby’s hair so it was all one length and I said yes. Now Abby’s bangs are officially grown out. I love her little haircut. Vincent played Ultimate Ball after school through the intermurals his PE teacher sets up. 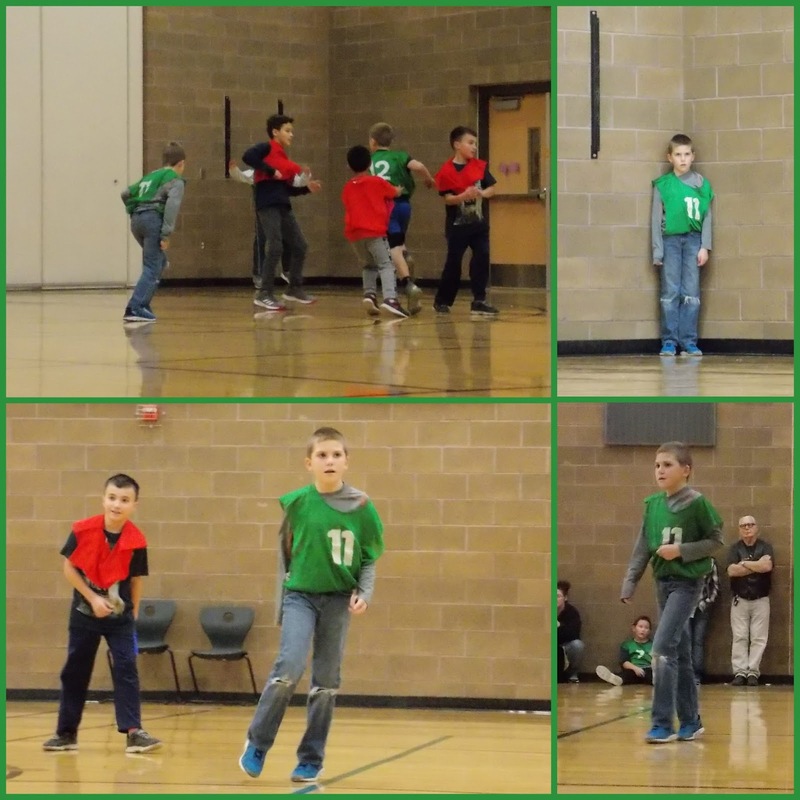 It’s a made up game that mixes a little football, a little basketball, and some other fun things. The kids love it. 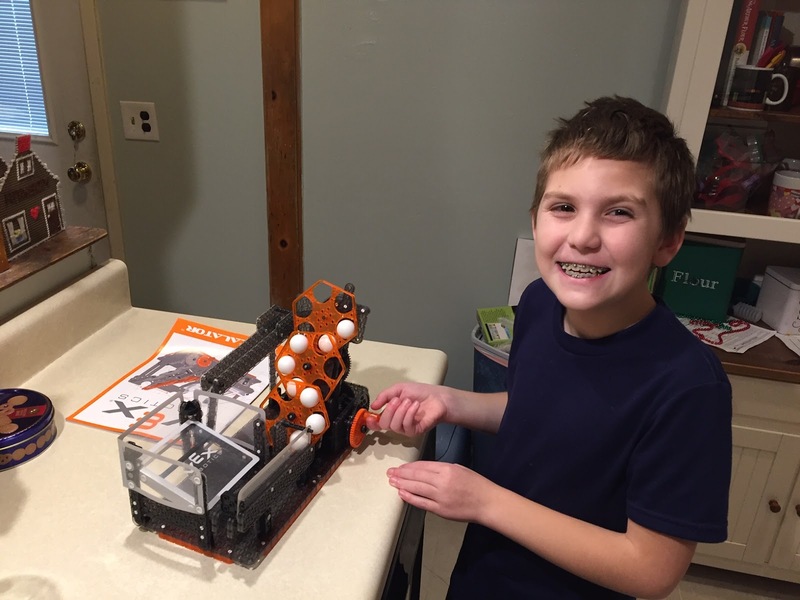 Vincent skipped a piano lesson one week and went to a science night at the middle school with his piano teacher and her grandson who is his friend. She even sent me pictures. They had a fun time together exploring. Jason Lee had a bazaar again this year. 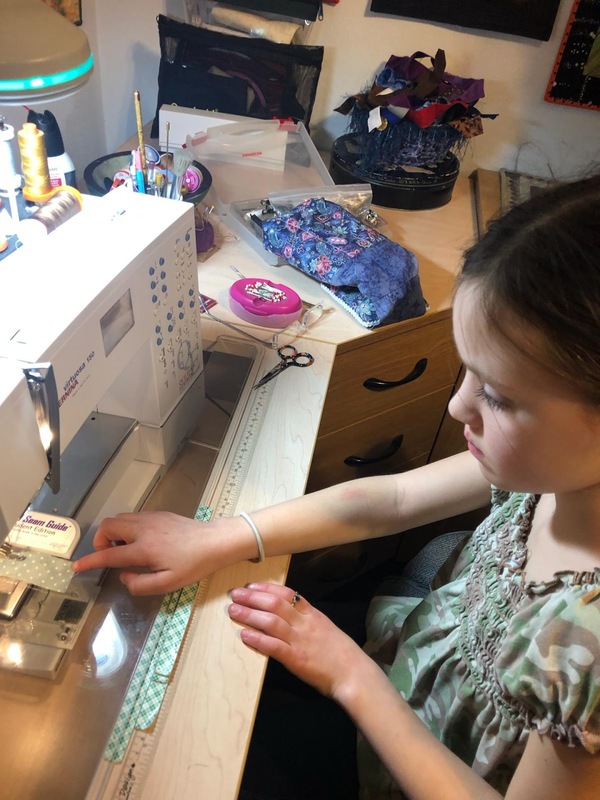 Shirley got a booth and Olivia asked her if she could use a corner of it for her jewelry she made. She loves to make stamped necklaces and bought a bunch of supplies for it herself. She sold a few at the bazaar and enjoyed hanging out with Grandma Shirley and Grandpa George for the day. No picture of this one, but at church Olivia usually sits at one end of our pew with Vincent and Abby on either side of her and they share a hymnbook and really sing out during the songs. I love hearing them praise in song. One day in particular, the song was, “There is Sunshine in My Soul”. Apparently, they really like that song. Me too! Abby was obsessed with calendars for a big portion of November. She wanted to make us calendars. Unfortunately, she didn’t realize that the months don’t all start on Mondays… And the squares are way too small for us to use. I actually have a giant desk calendar that I attach to my fridge to keep track of everything going on with us. I thought her motivation and persistence was excellent though. She’s learning a lot in second grade. Thanksgiving was spent up at Andy’s parent’s place with two of his sisters and their families. 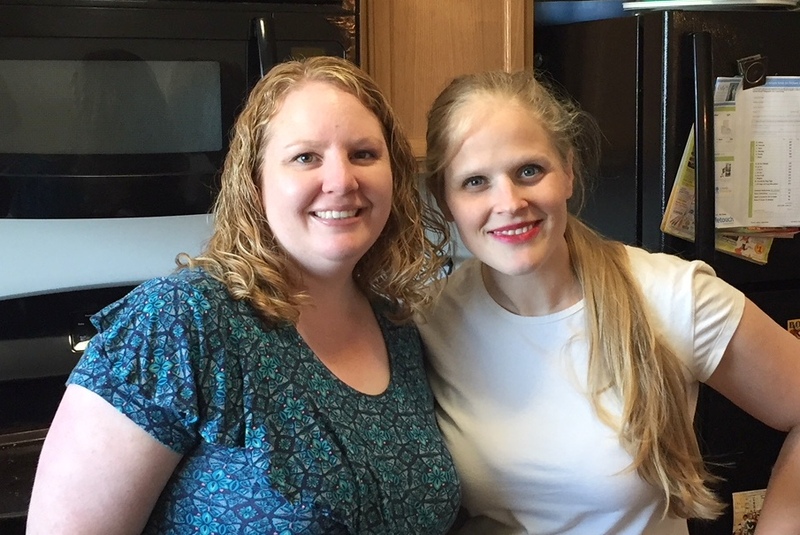 One sister moved across the country a week later, so we wanted to spend more time with them. Dinner was excellent as always and we had a good time visiting. 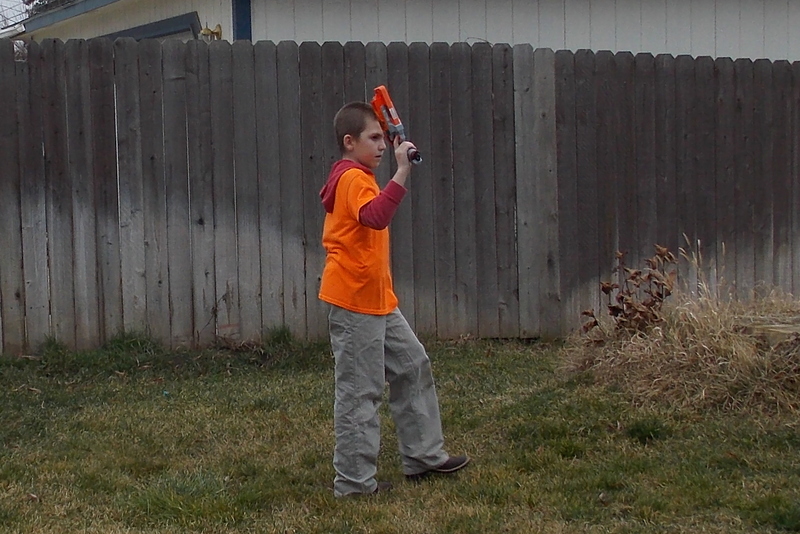 Nathan came with us for Thanksgiving and is headed to visit his family in Idaho/Utah for Christmas. The tree was decorated after church on the Sunday after Thanksgiving. Olivia is usually the ringmaster who wants to help get everything out and set up. She gets so excited about holidays. Grandma Mary made fun little light up tree ornaments for everyone this year with their initials on them with beads. Very inventive. I love Christmas and the holiday season (even though I work more and sometimes even at my store we get some characters as customers…we also have great moments with sweet customers who find just the right gift for someone and who come back and tell us they loved our last suggestion and want something else for that person. It’s the best!) I love that we can remember the Savior more and focus more on others and things that they might like. I like giving surprises for gifts and spending time with my family. Also, I love sweets and turkey and all the music in concerts and on the radio and all of the fun that comes with the season. 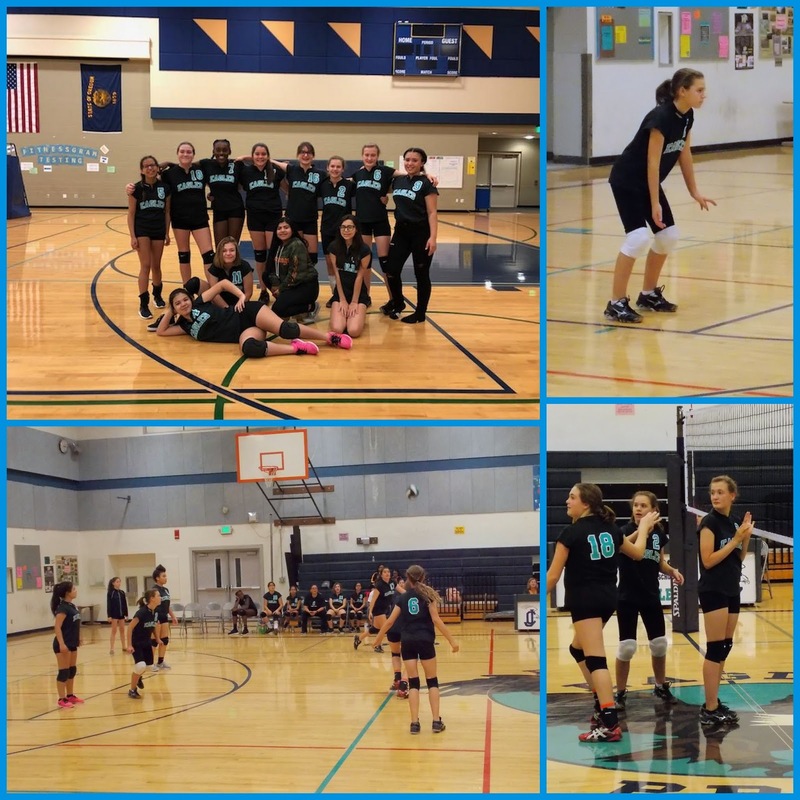 Olivia finished up her volleyball season this month. They played hard and got better with each game they played. She is a go-getter. But volleyball, zero hour orchestra, advanced classes, and church activities make this girl kind of exhausted. 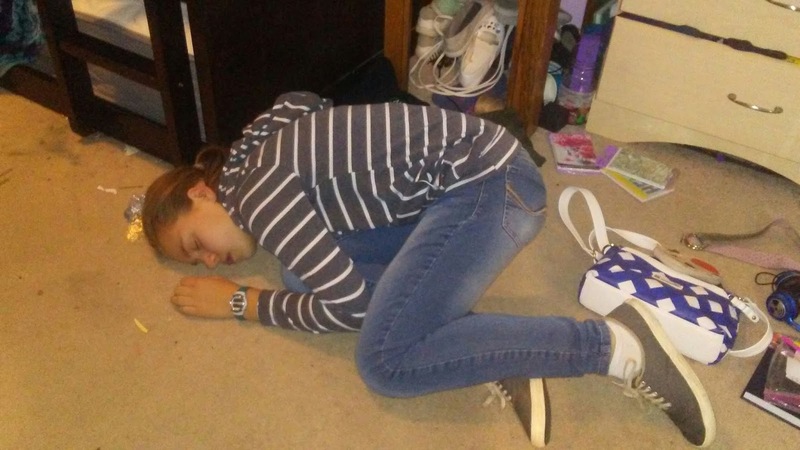 One day after practice she came home to start some chores and a few minutes later I found her in her room asleep in a heap. 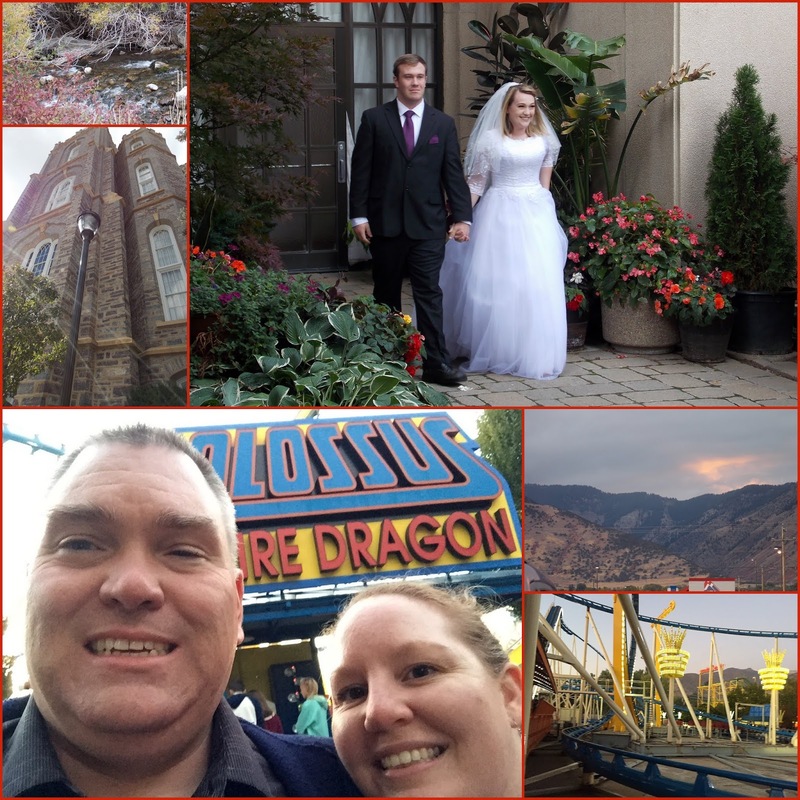 Andy and I were able to go to my cousin’s daughter’s wedding in Logan, Utah this month. I dropped the kids off at Grandpa and Grandma Ransom’s and then came home and we drove to Boise one night and then to Ogden the next day. We visited Andy’s sister for a few minutes before going to Lagoon to ride the fun rides. 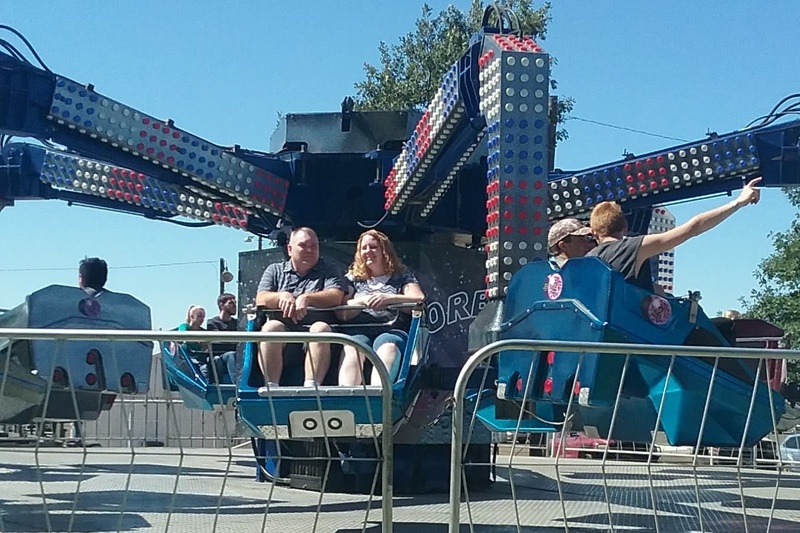 We drove past the amusement park in the summer and the kids all said it looked too scary, so we decided to go without them. I hadn’t ever been and Andy hadn’t been for close to 20 years. It was so fun! The wedding was Saturday and it was beautiful. We had a great trip and it was fun to spend time together. 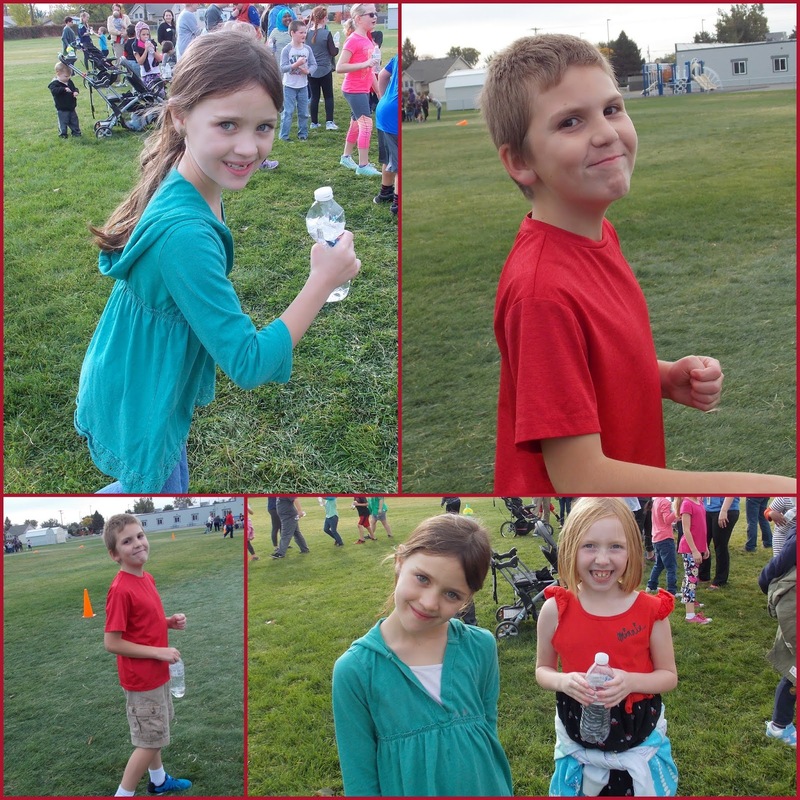 Vincent and Abby had a jog-a-thon at the elementary school. They had fun. 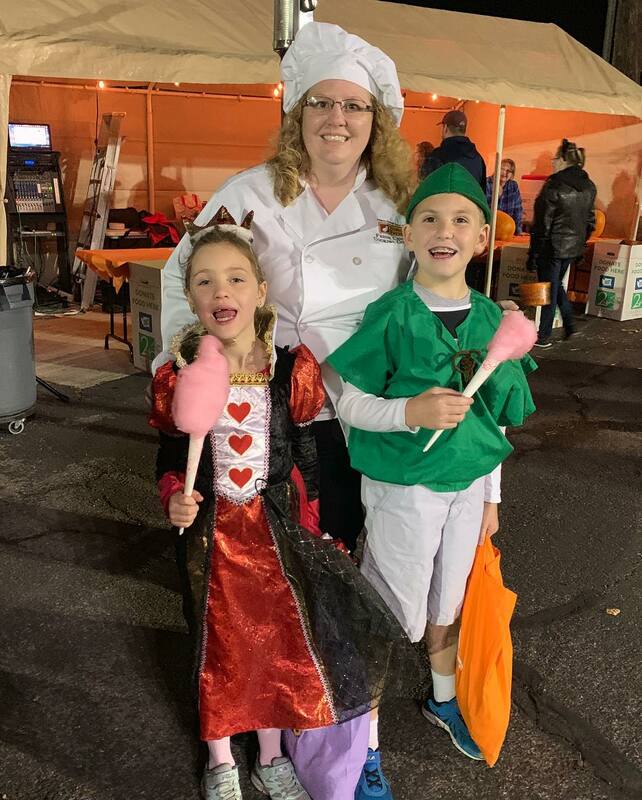 Open house/family night/book fair/trick-or-treating was the next week at the elementary school. 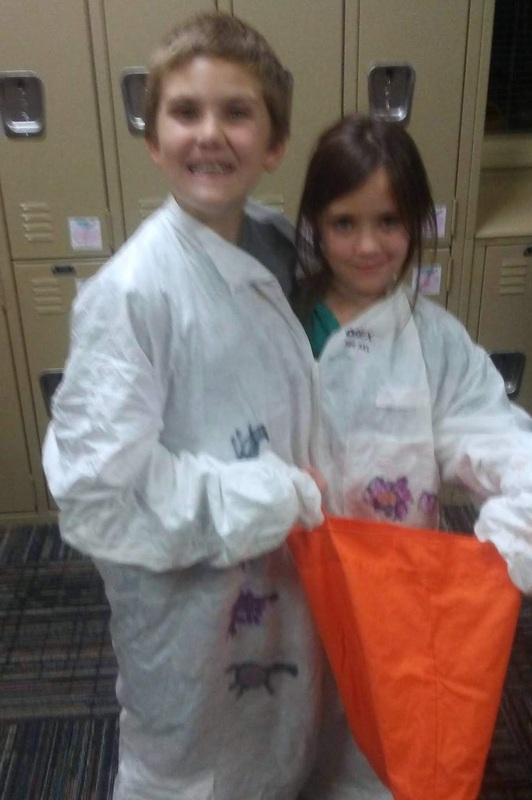 Vincent and Abby wore a safety suit that Vincent got at a safety expo a few years ago. They said they were siamese twins. Our primary put on a ward carnival. 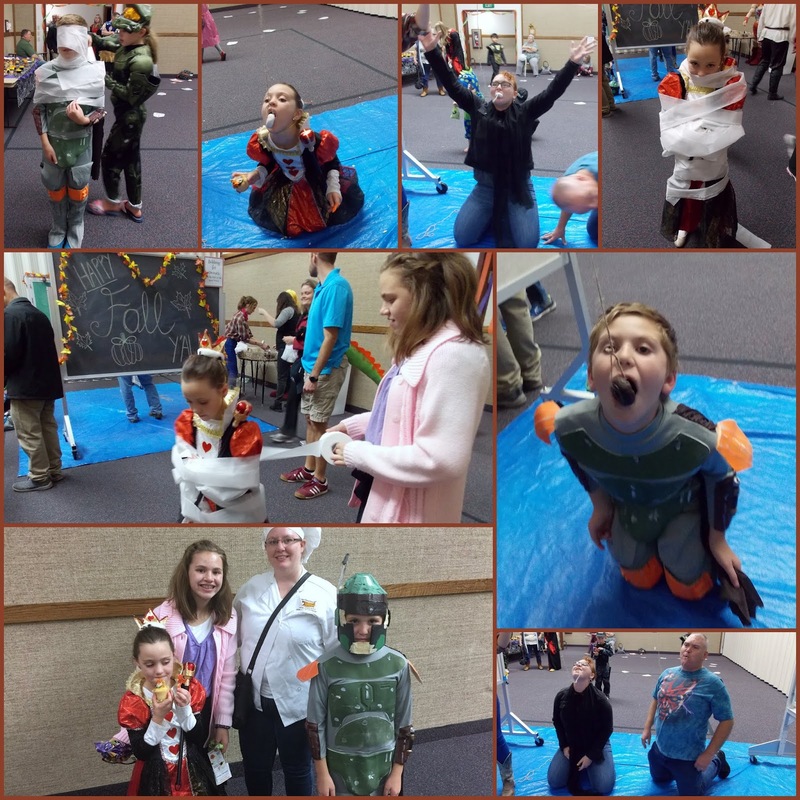 There were great games and treats and a lot of fun. (Me-Chef, Olivia-Librarian, Vincent-Bobba Fett, Abby-Queen of Hearts). 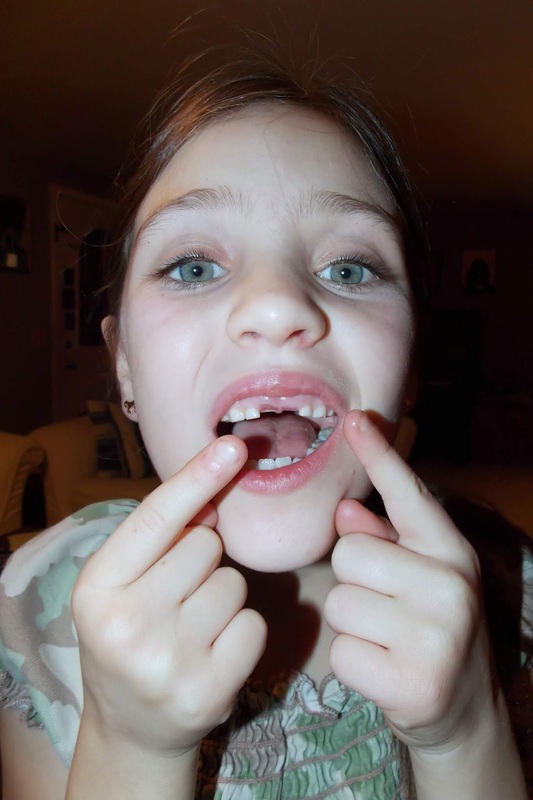 Abby lost her second front tooth. Maybe she’ll get them in for Christmas. lol. 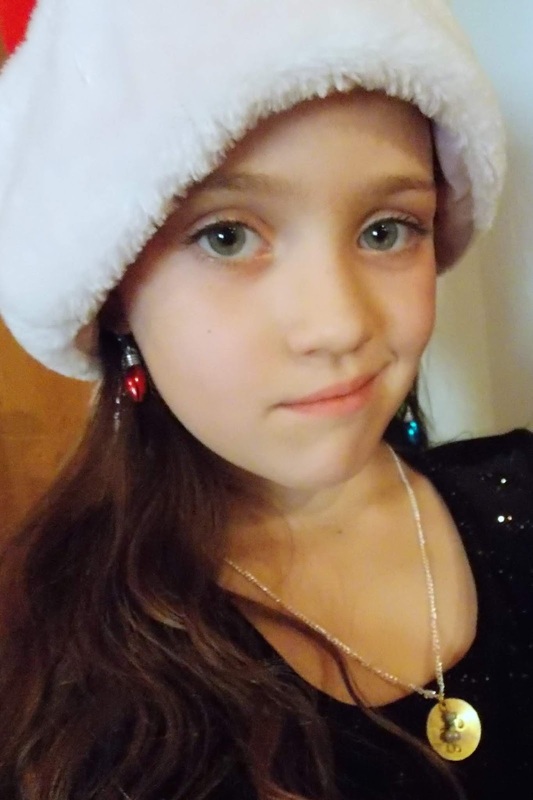 Olivia bought some jewelry making supplies and asked Abby to model them for her and she took pictures. She’s stamping letters on metal mostly. 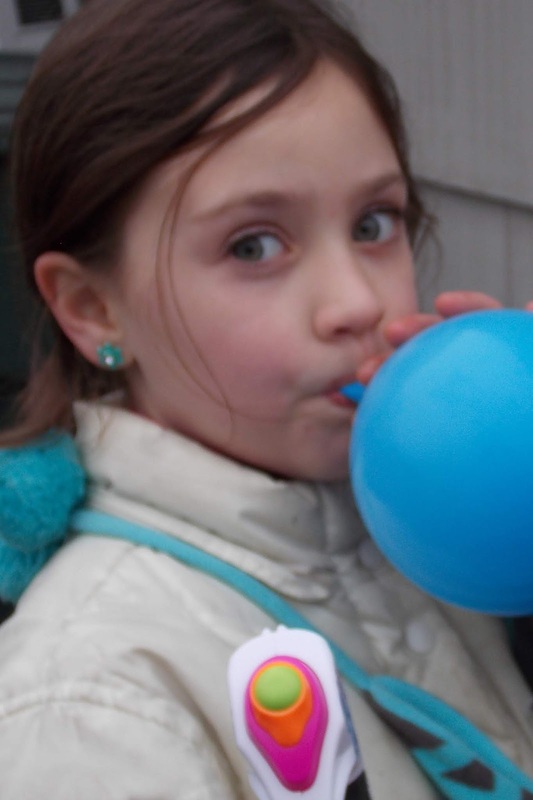 Abby’s little side smile here makes me imagine her when she’s about 15 instead of 7…. On the way home, Andy dropped Vincent, Abby, and I off a few blocks away at a trunk-or-treat a friend asked us to go to. We voted on which car’s decorations we liked most and they got cotton candy. Then we trick-or-treated all the way home. October may have 31 days, but somehow it always feels shorter. Love being able to spend time together though! 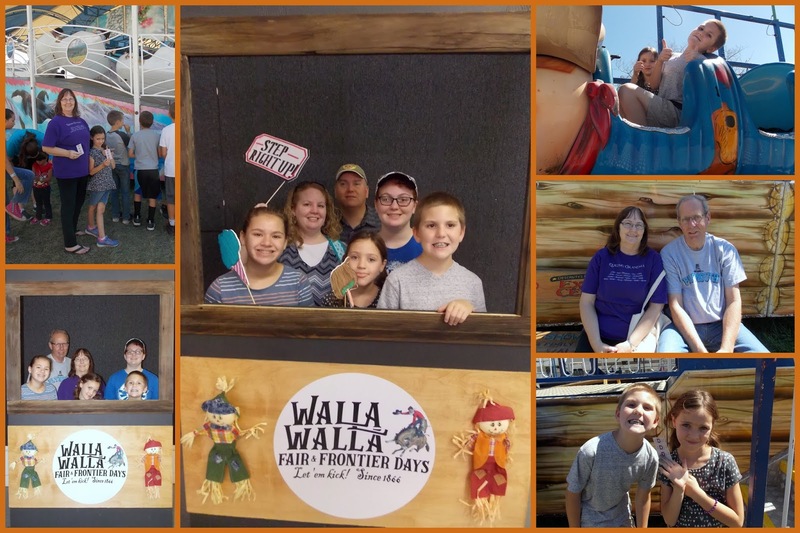 We started September off with a visit to Walla Walla Fair. All of our kids entered a few things in there and received free tickets. 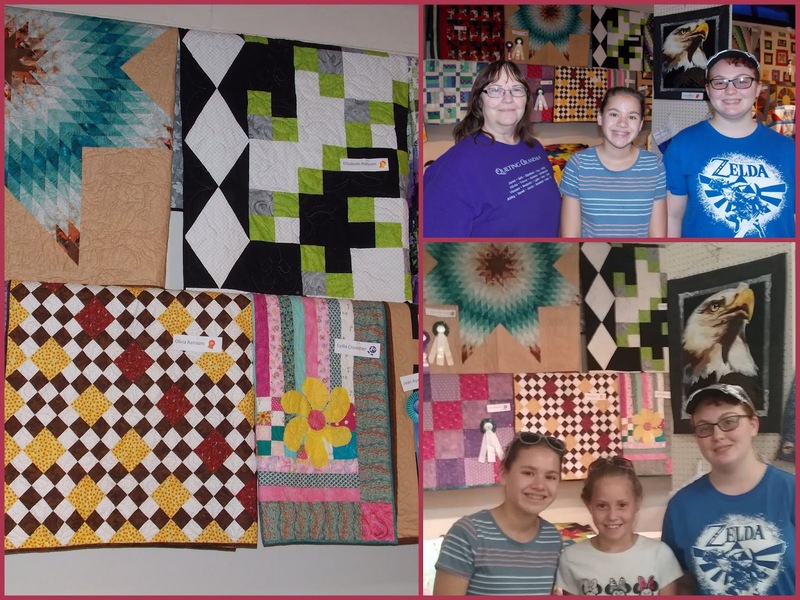 Elizabeth and Olivia’s summer quilts from Grandma Quilt Camp were entered along with their cousin Lydia’s quilt. Elizabeth’s is black, white, green. Olivia’s is red, yellow, white. Lydia’s is the striped one with the yellow flower. 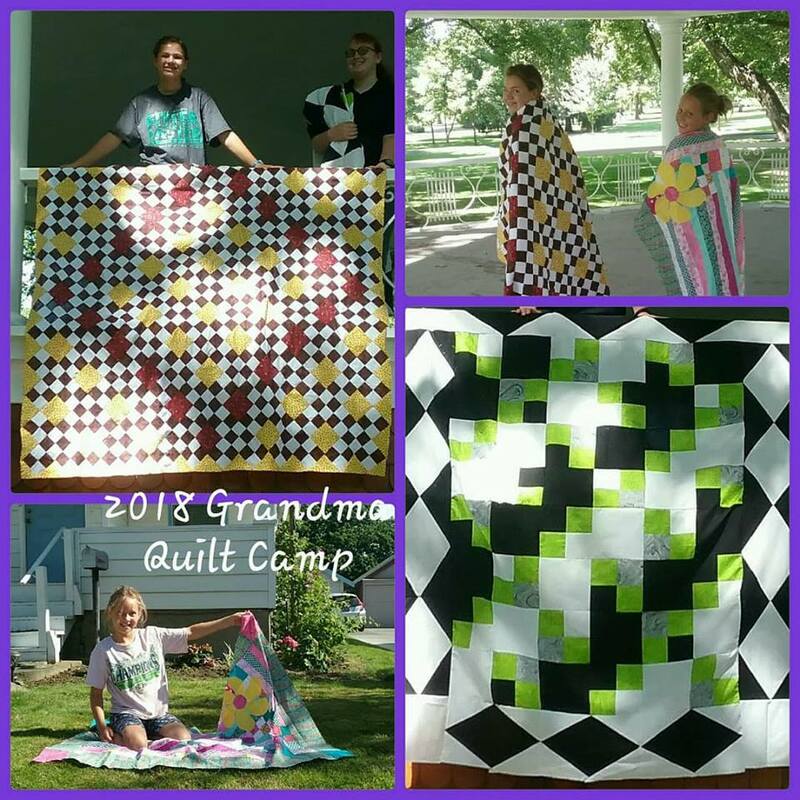 Thanks for helping them learn how to make beautiful quilts Grandma Mary! We wandered around to find everyone’s entries. 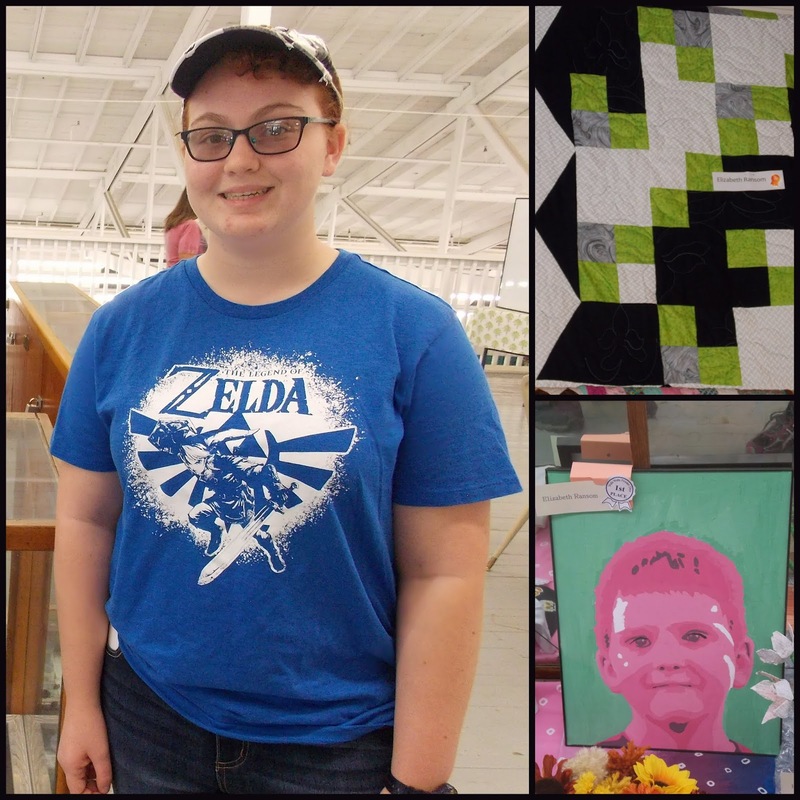 Elizabeth entered the quilt she made at Grandma Quilt Camp earlier this summer and a painting of Vincent she did for the Walla Walla Fair this year. 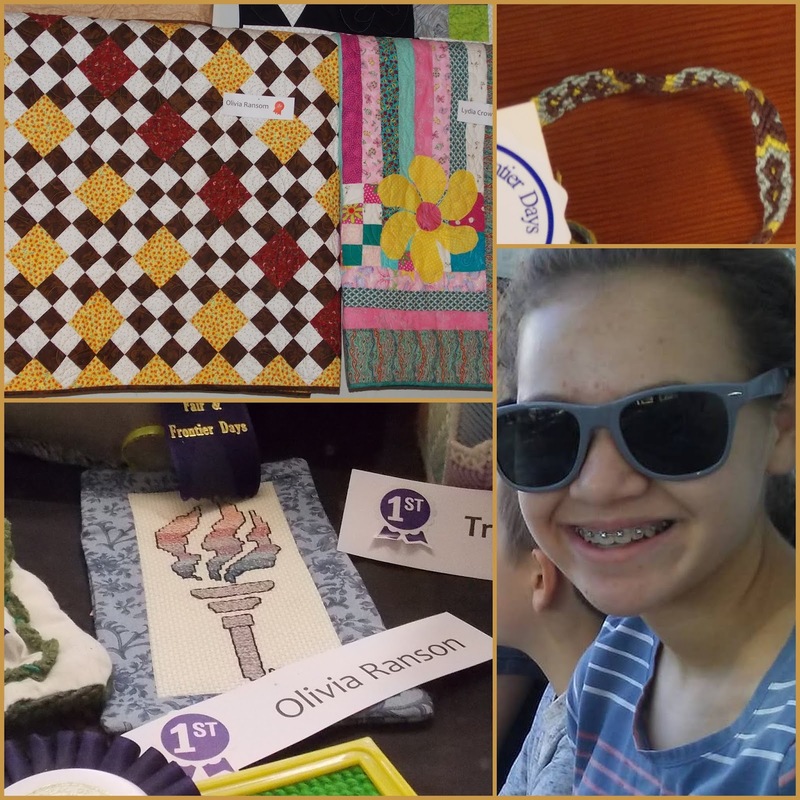 Olivia entered her Grandma Quilt Camp Quilt, a braided bracelet, and a cross-stitch for the fair. 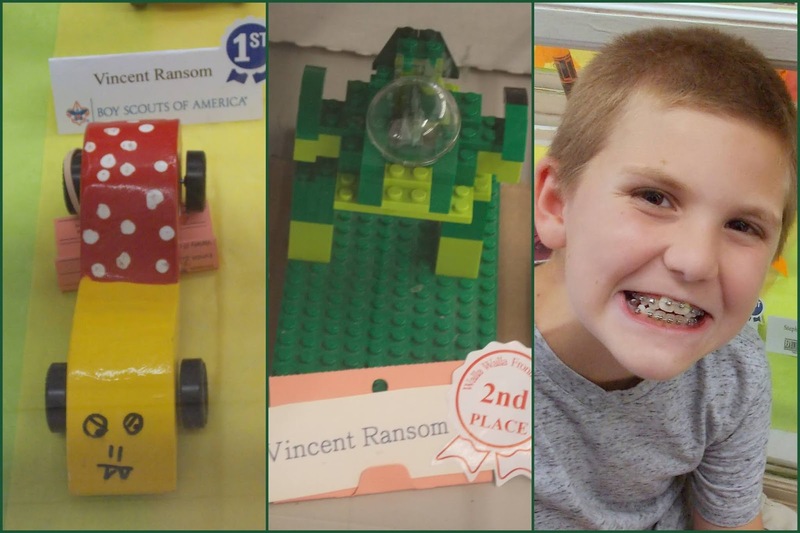 Vincent entered a pinewood derby car he made to look like a Bulborb from a Pikmin game and a Lego in the fair. 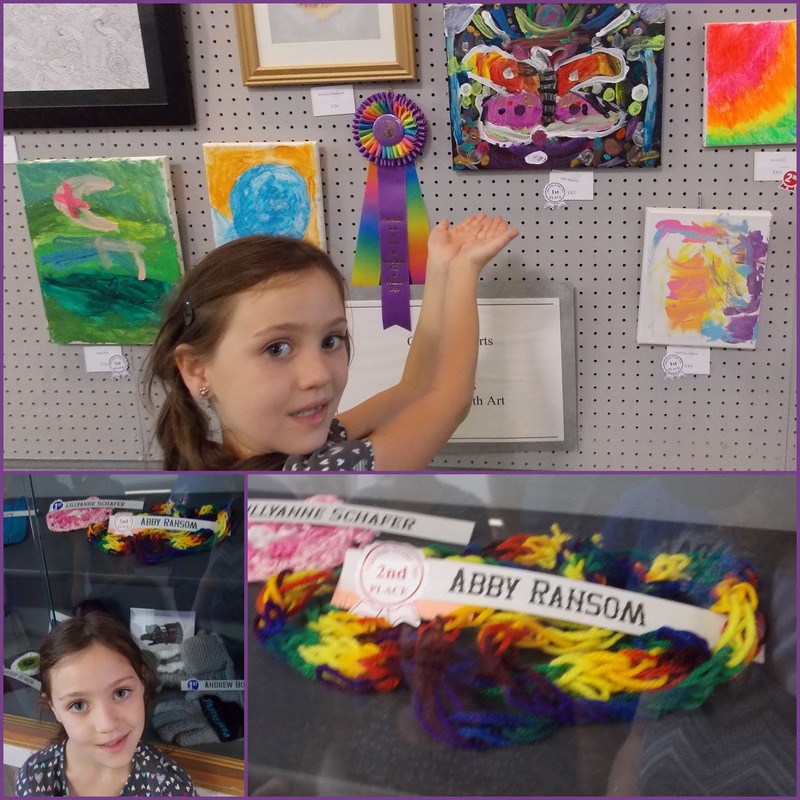 Abby entered a painting (Neon Butterflies) she did at Art Camp this summer and a string of finger-knitting for the fair. And then we went on a few rides. This one is my favorite. Elizabeth and Olivia opted to shop instead of ride rides. Vincent and Abby rode the kiddie coaster together and Abby rode the other ride with Grandma Mary (who liked rides as a kid, but hasn’t ridden many lately). They had a great time. Thanks for helping get the entries and forms where they needed to be MOM! 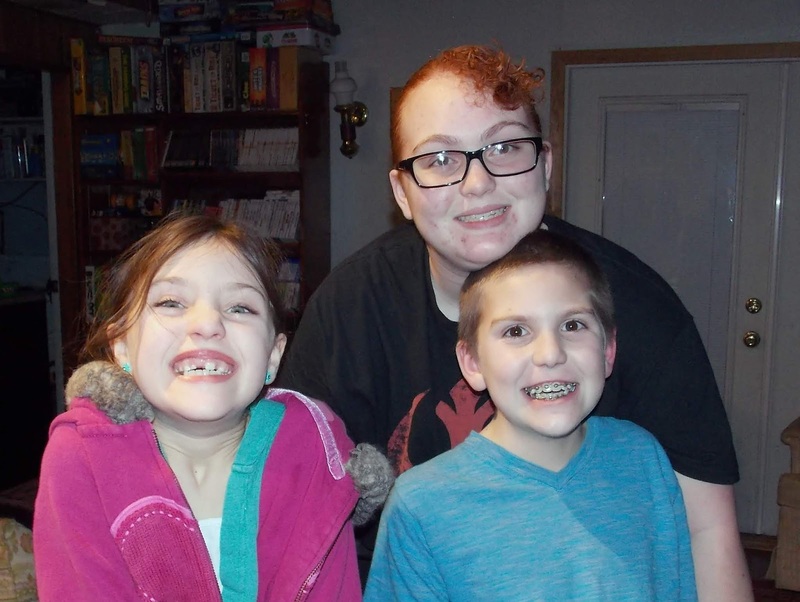 The kids loved having their things there and spending time with you and dad. 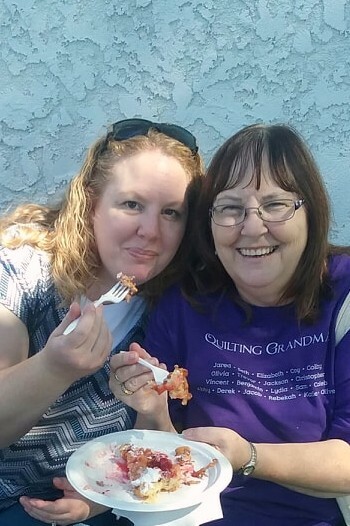 And I enjoyed our fair funnel cake too! 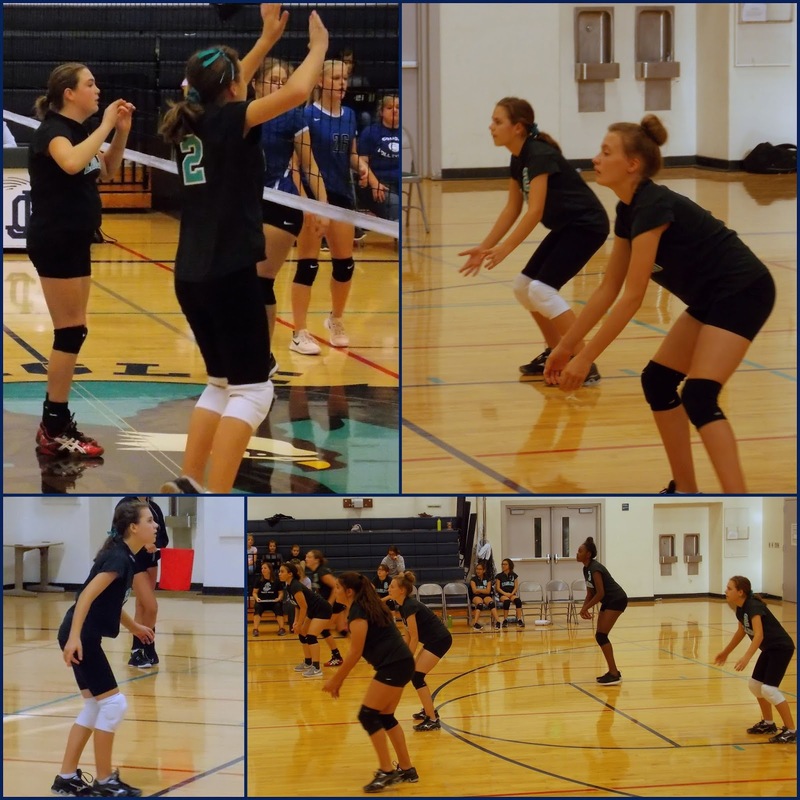 Olivia is loving volleyball season. She made the 8th grade A team (although honestly only 13 girls from each grade tried out, so they all made the A team. lol). They are learning and growing and improving each time they play. Olivia is hard on herself more than she needs to be and is working on her serve and trying to be more confident in her actions on the court. Her coach says she does better in practice than in the games because she gets nervous. She enjoys it all whether they win or lose! In this set of pictures Olivia was at the net and even jumped up to block a ball. She’s getting there! 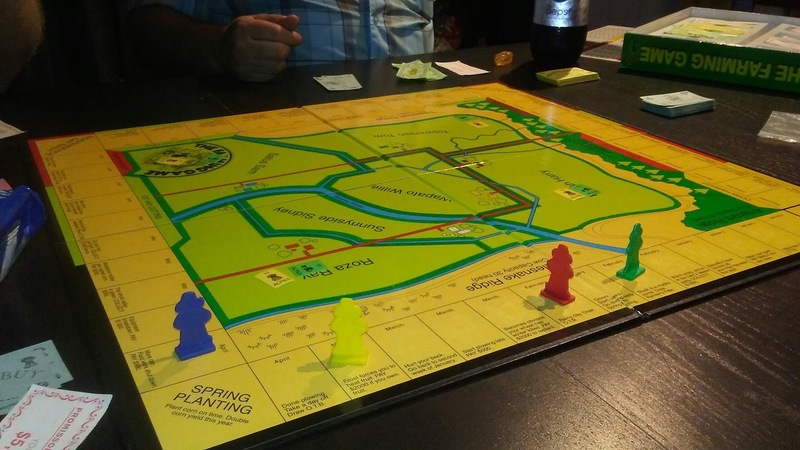 A few weeks ago we played Farming Game for game night. It started all empty like this, but ended with my spot full of crops and cows. I conquered the regulars! We had our official store Grand Opening mid September. Some people seemed to think we were closed the whole month… People get confused about things sometimes. 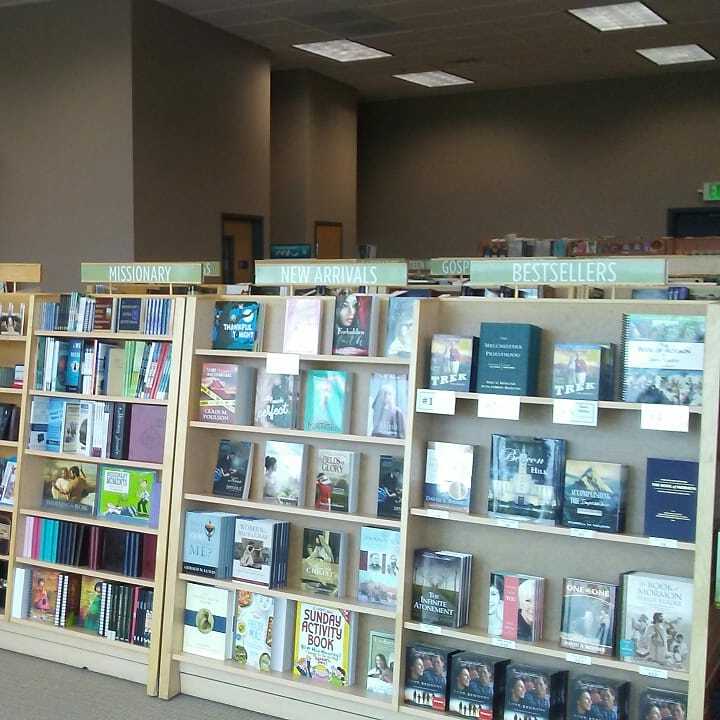 But then again, we also had people who came inside our store when two moving trucks were in front hauling bookshelves out wanting ‘just one thing’…. sorry. Much more settled after a few weeks. Boxes are all unpacked and everything has found a home! Not so fun: Going to get blood drawn and having them try five times and fail five times…. The next closest location was in Yakima (1 1/2 hours away), so we looked at schedules for the next week and picked my day off to have a little day date (drove the company car and used company gas and Andy was on the clock still), but that means it used up most of my day off that I usually catch up with things at home, run errands, REST, and help with school things, church things, etc. Anyway, I called the company to see if there was any way to get it done closer and they said that I couldn’t without paying for it and having the doctor verify it (and they didn’t have any appointments for another two months! ), so I called the Yakima location to see if we could make an appointment or if we just needed to walk in (walk in) and off we went to Yakima. I drank even more water over the weekend (I was floating) and traveled in the car with my sweatshirt and blanket (let’s be honest, I always travel with a car blanket). We got right in there. The phlebotomist lady looked at my paperwork and my giant bruise (see pic above) and started looking for a good vein option. She found one and had me go put my hand in warm running water and then took it from the back of my hand. First try. Hooray. 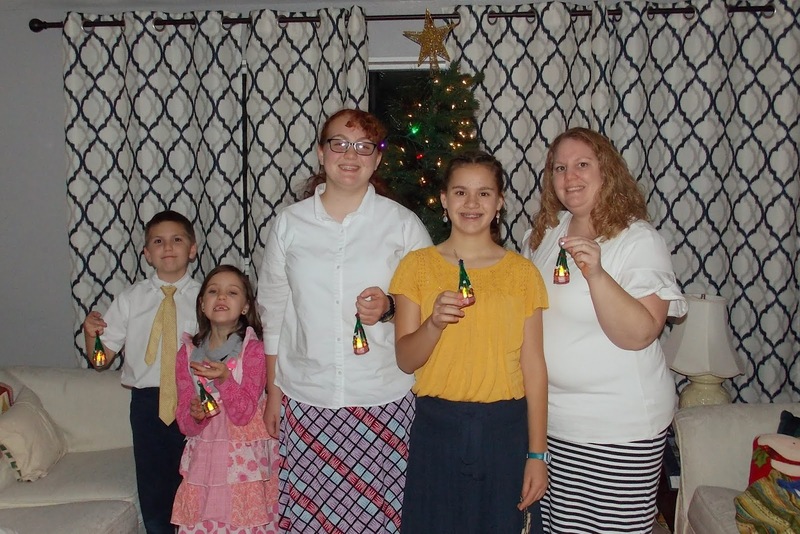 Our Young Women’s group had a special Mother-Daughter Temple Baptism night in September. I invited Grandma Mary to come too. We looked for family names, but have trouble finding any that are legit. Others found some though and it was a great night. 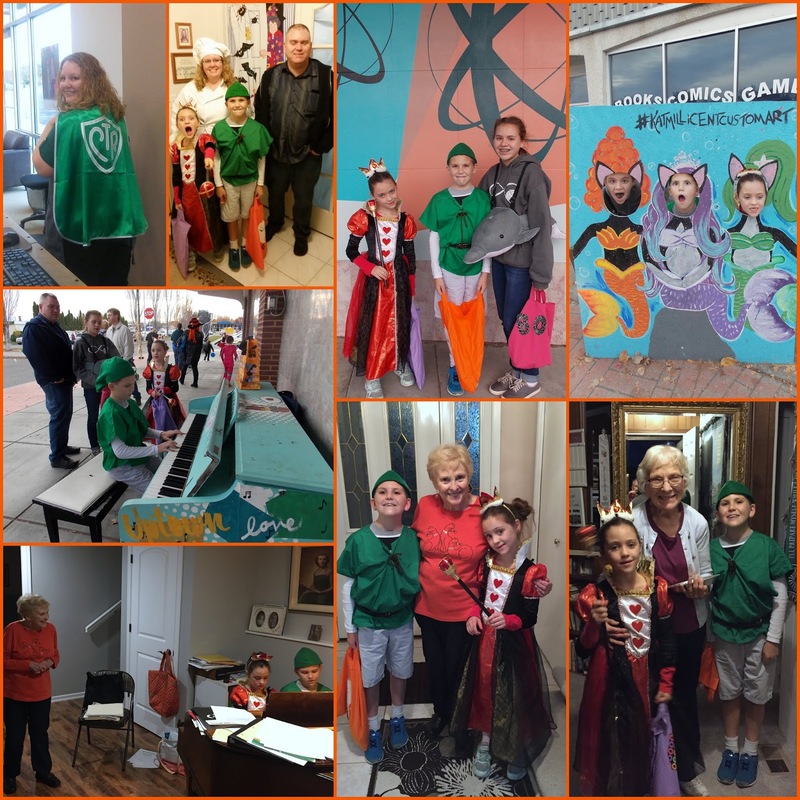 Everyone participated and it was really special. We ended up with not quite enough men to help, so I called Andy at the start to come over. We seem to always hit the jackpot with great neighbors. 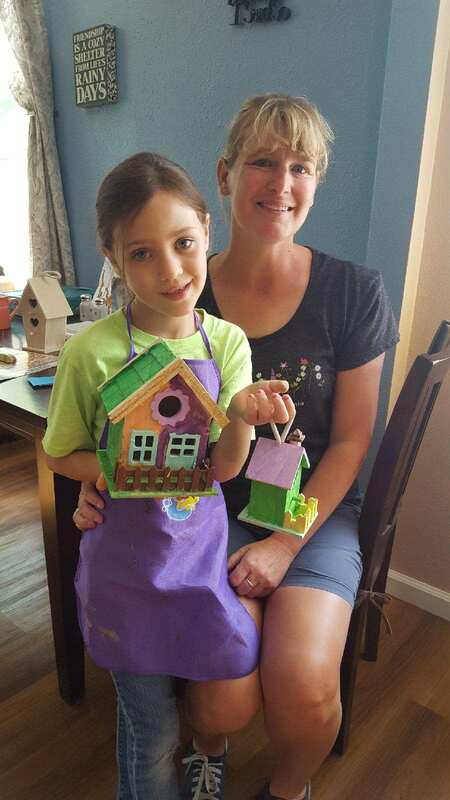 Our next door neighbor, Kelly, texted yesterday to see if Abby would be able to come over and paint birdhouses with her this morning. They bond over rock collections and all kinds of other things too. It’s the best to have so many people involved and excited to be friends with my kids. 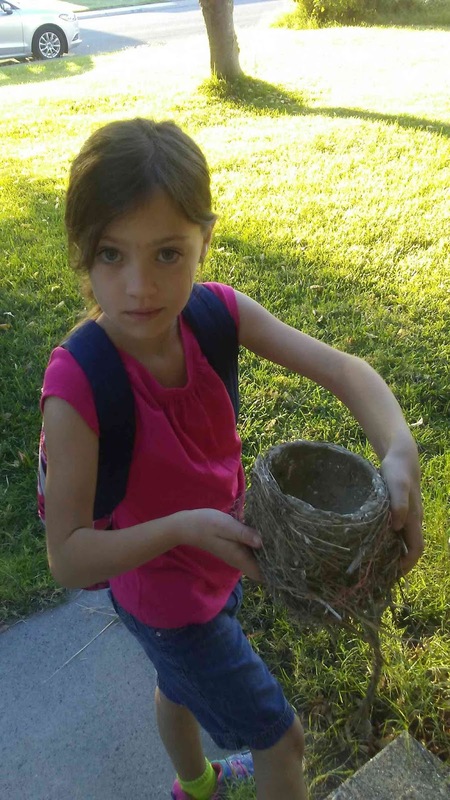 One day earlier in September she brought an abandoned bird nest she found in an orchard at work. (Another day she asked if her son could ride with us to the school Elizabeth goes to and we came home to a giant box of apples). SO nice! 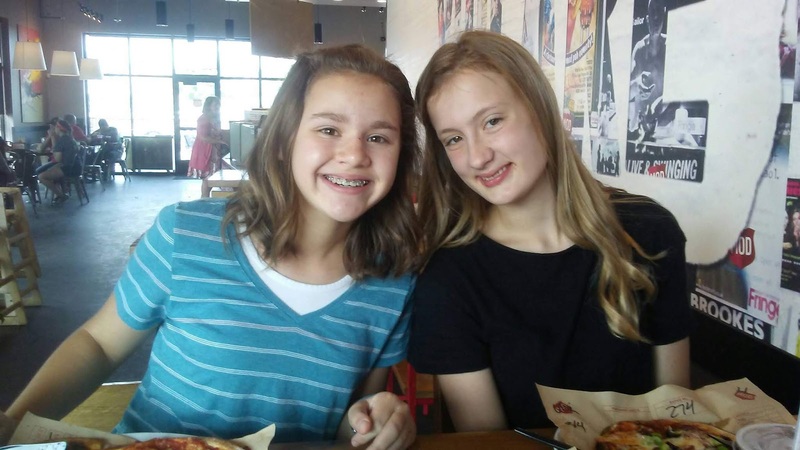 She really likes Abby’s energy and personality and they have a fun time hanging out. I get random texts from her that she misses her during the winter, so I send her over. Abby watered her plants over the summer and weeded her flowerbed too. Very nice. We got a baby niece (or two) this summer! Paige is Andy’s sister’s baby. 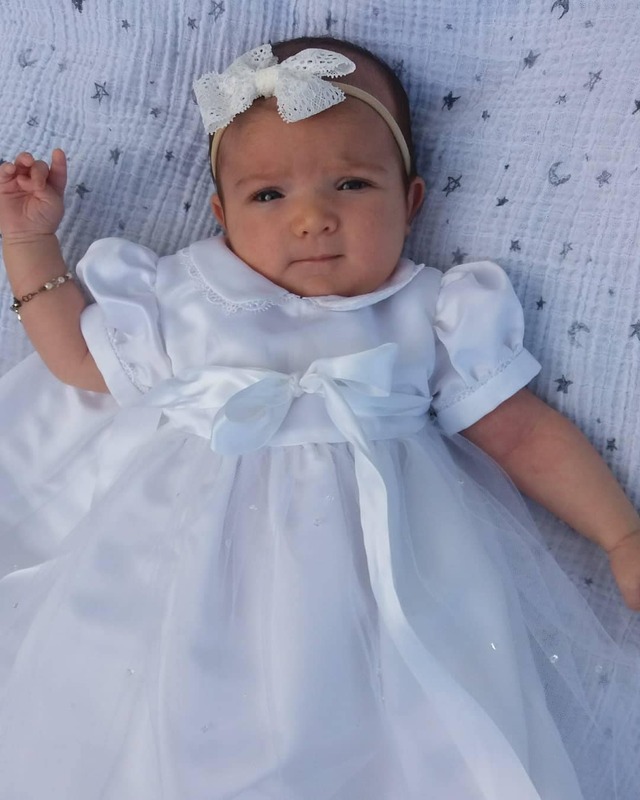 Her blessing was the last week in September. She is their third girl and is so cute! Andy and Elizabeth had to go back to our ward as soon as the blessing was done so Elizabeth’s not in this cousin picture. 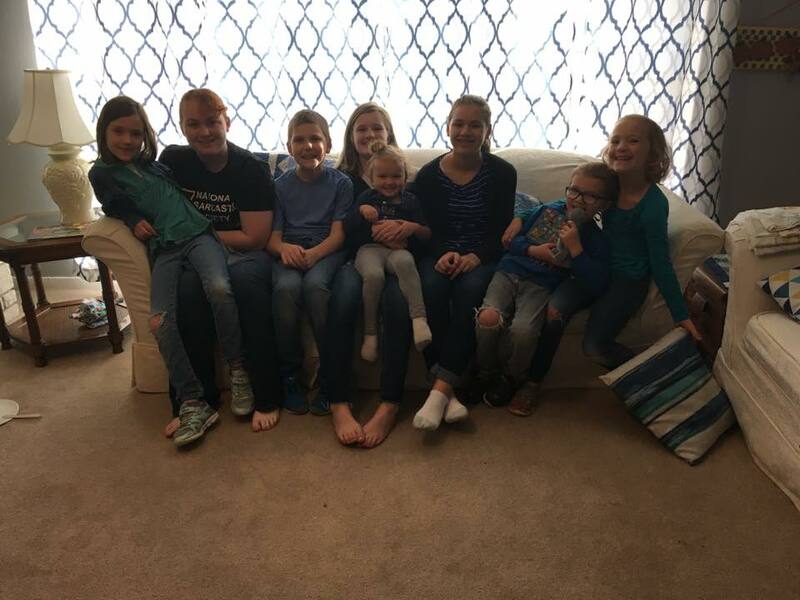 Plenty of other cousins aren’t in it either, but I was testing out the spot for the parent/grandparent photos just after this. My brother and his wife had a baby girl just a few weeks after Paige was born. 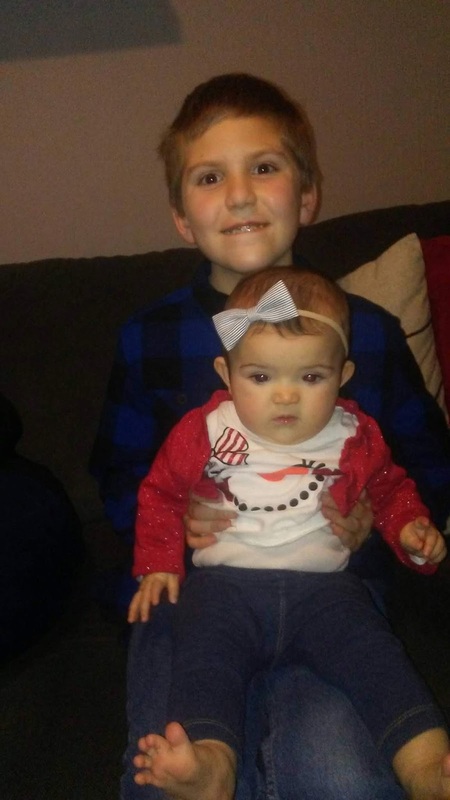 She is their seventh baby and her name is Reagan. We are excited to meet her in a few months (date not determined). She’s beautiful too and I love seeing pictures of their family. Andy was out of town several times in September, but it all worked out with my work and all the kid stuff. Oh, and I think the etiquette night for the youth went well. I was supposed to be a 20 minute lesson on etiquette before the dinner and talk about dating for the youth in our ward. I decided no one wanted to listen to me talk for 20 minutes, so I decided to have them do some skits/charades instead. We did a little ice-breaker first. 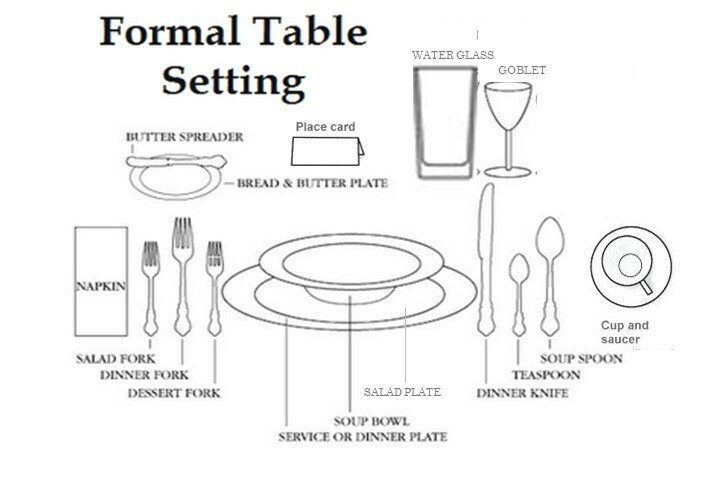 Table setting challenge: Two Teams of two (one with map on each team and one follows directions without seeing map). I had a team of girls and a team of boys and it was funny to see them react to so much silverware. Then Handed out skits/charades to groups of two or three and gave a few minutes for them to discuss a plan for a 30 second skit. I let them choose whether to show the correct way or the wrong way (several groups wanted to show both and did a two-part skit). They told what the manner/etiquette was at the end or had everyone else guess. Show us how to (or how NOT to) give up your seat in a bus or crowded room to elderly, women, or children. Show us how to (or how NOT to) behave with cell phones during a meal or during conversations. Show us how to (or how NOT to) introduce people in a group. Show us how to (or how NOT to) put your napkin when you sit down to eat. Show us how to (or how NOT to) properly cut food and eat politely. Show us how to (or how NOT to) tell someone they have food in their teeth. Show us how to (or how NOT to) display table manners (elbows/sitting). Show us how to (or how NOT to) respond when you have food in your mouth. Show us how to (or how NOT to) break into conversation (interrupt). Show us how to (or how NOT to) pass food across/around the table. Note: I’m not awesome at plenty of these, but it was fun to watch them take a few minutes and come up with a plan for their skits. Two of the groups were the adult leaders, so that was extra fun. And I even got to stay for dinner and the dating talk. Elizabeth finished her driver’s ed drives with the driving school and just needs to practice more and do her written and official driving test between now and when she turns 16 in February. Started her sophomore year of high school! She was busy babysitting for a friend of a friend the end of summer and drawing and reading and helping me move a bookstore. She was a huge help with the registers taking them apart and putting them back together (they worked!) She was our tech girl. 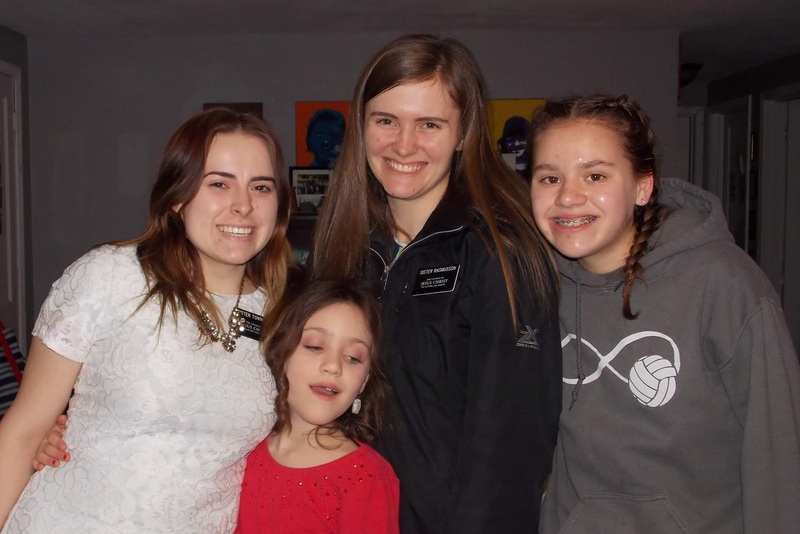 Olivia completed her Young Women’s Personal Progress Recognition in just under a year and received it the Sunday before she turned 13. She worked on it a lot this summer. So proud of her ambition and determination! Olivia turned 13 just before school started. 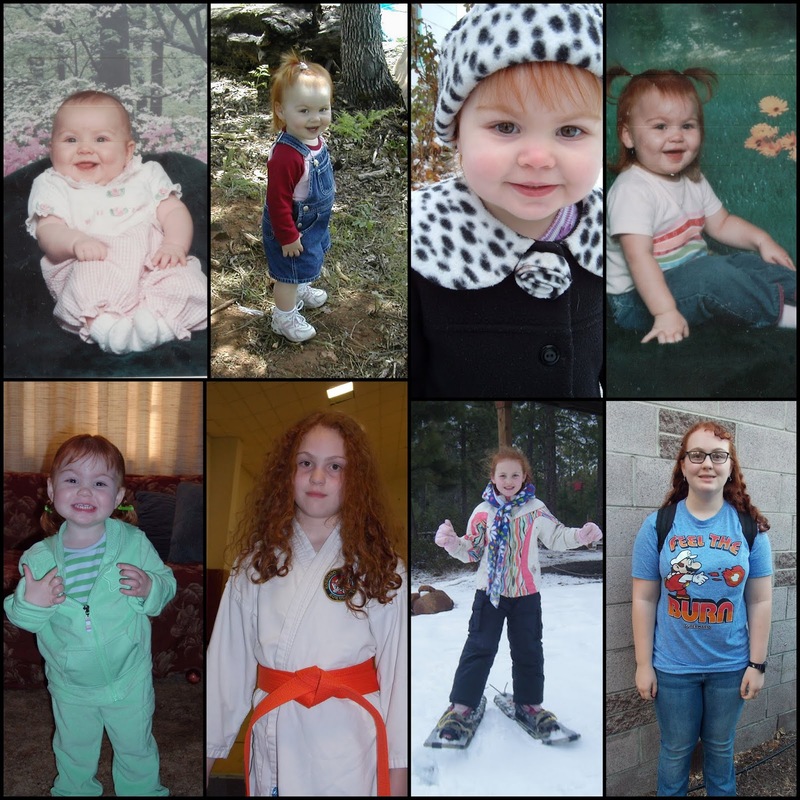 I can hardly believe it’s been that long, but also feel like she was a baby just yesterday. Time is funny like that. Love these pictures of her! She spent the day at the middle school picking up her schedule (and hanging out at the middle school PTA table with me because I’m the PTA president this year and was helping with memberships.) 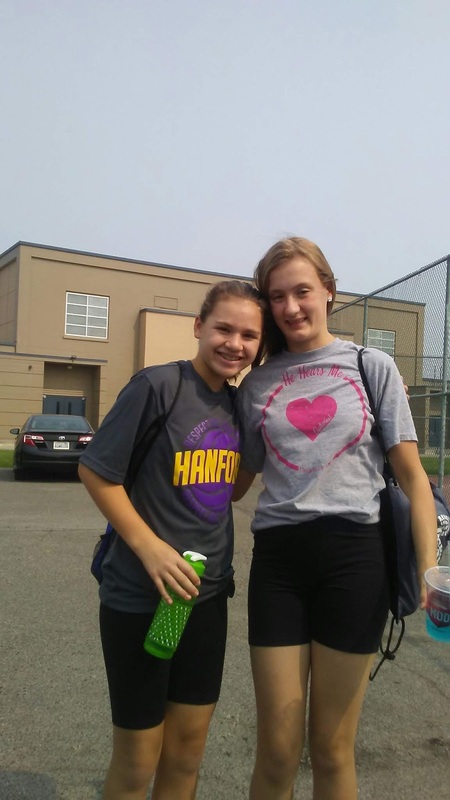 Then we went to lunch with her friend Cambria before I dropped them off at volleyball open gym. 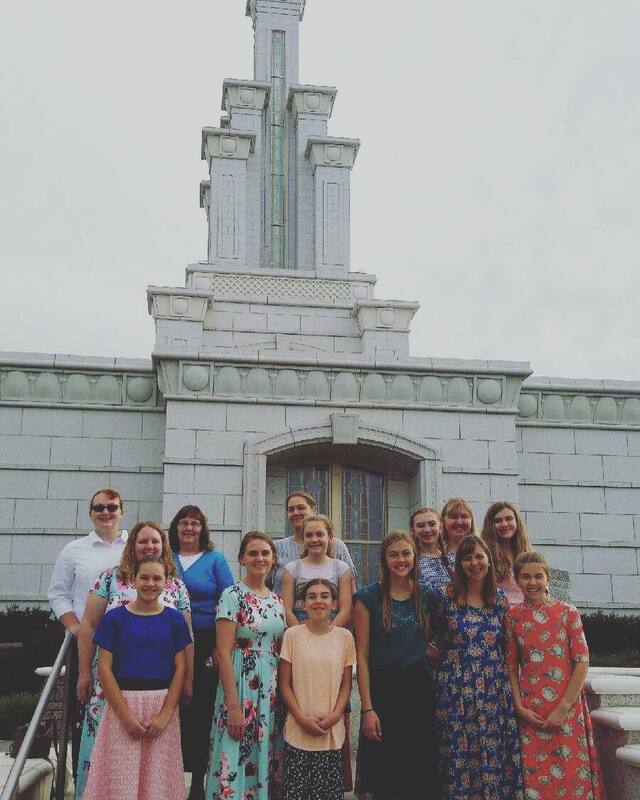 After volleyball our ward youth had a Temple Trip to do Baptisms. It was a birthday well spent! We celebrated a few days later with a few friends and some cheesecake. 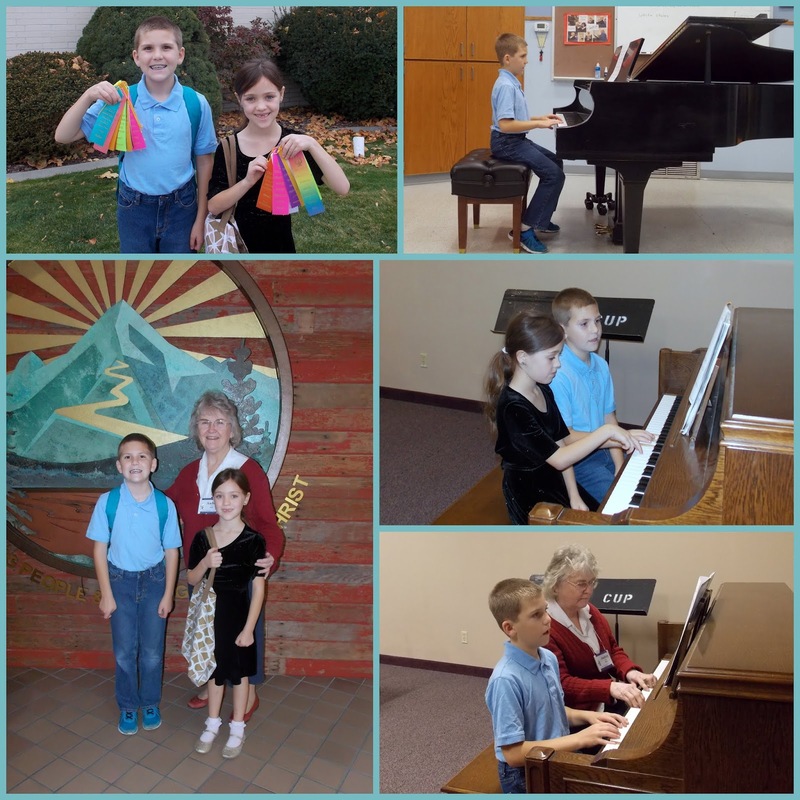 Vincent took the summer off for piano lessons, but is excited to start again with school starting. He’s spent most of summer reading or playing video games. Lamanite. She said that he was protected from arrows like we can be protected from distractions or sins. She is a deep thinker. 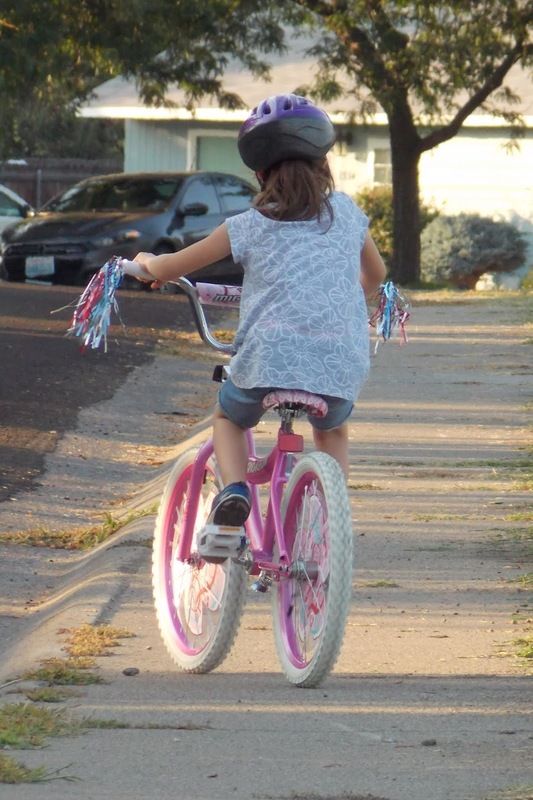 With all the smoke from fires stagnant in the air most of the month, kids were getting a little antsy to be outside. 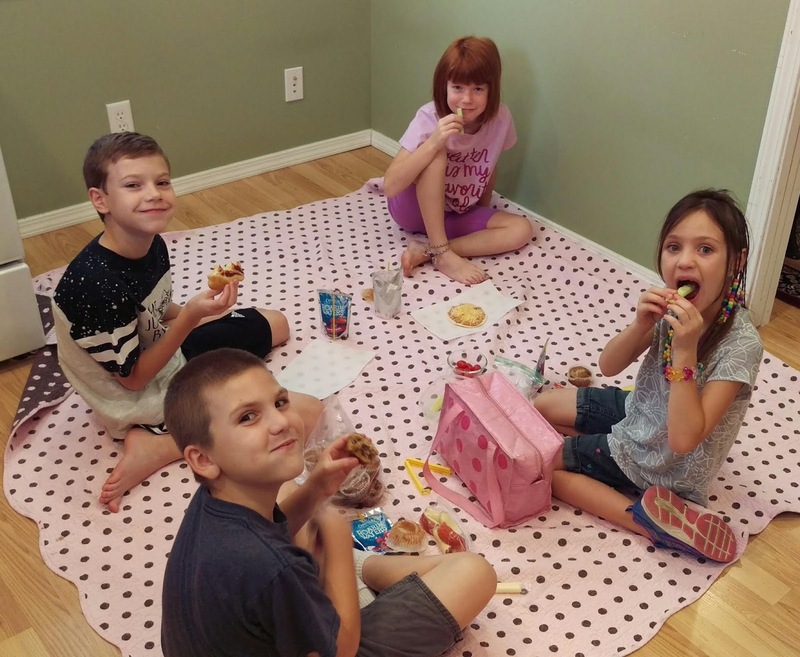 They went down to a neighbor’s house to invite their friends to a picnic. 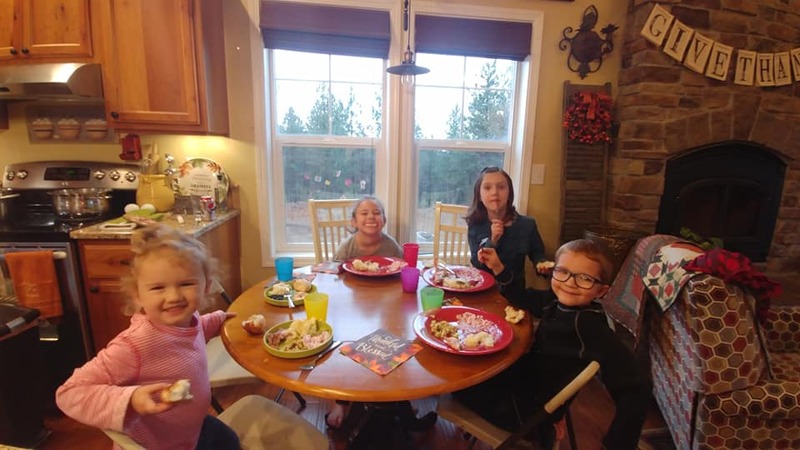 Their mom helped them have a picnic inside and sent me a picture while I was working. 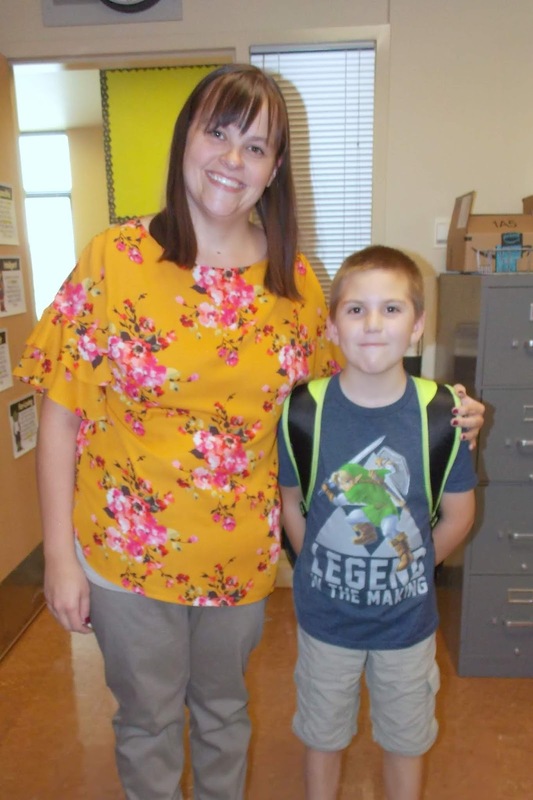 Abby and Vincent met their teachers the day before school started and then had a popsicle. They dropped off the few school supplies they needed to bring this year. Our school district provided everything for elementary schools in our whole district other than ziplock bags, backpacks, and earbuds/headphones. It was fantastic! We are loving our teachers this year and off to a great start! I (NaDell) am enjoying this no calling thing. I am still subbing in primary fairly often, but I’m enjoying regular classes anytime I get a chance to go. I get to help with an etiquette night later in September for the youth too. 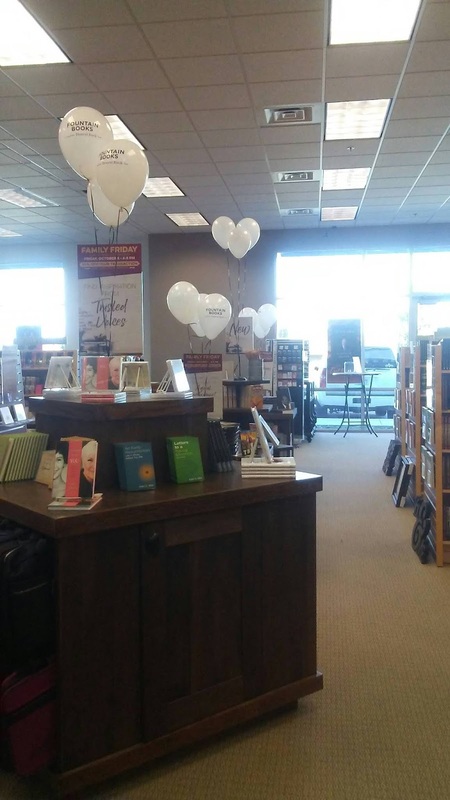 Biggest thing of the month for me was helping to move the bookstore I work at. That was a LOT of work! 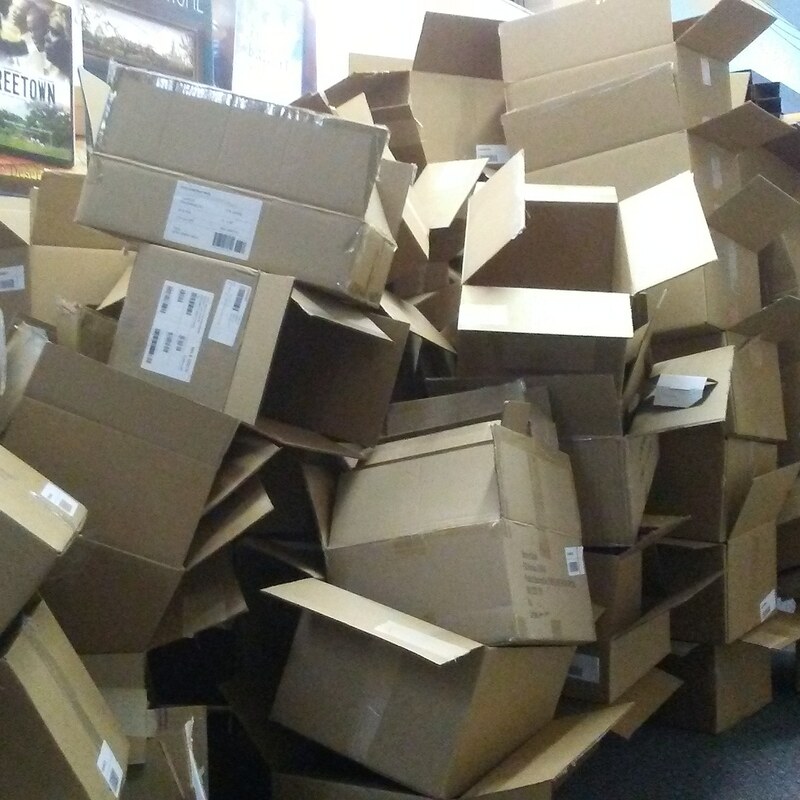 Started with a mountain of boxes on a Saturday night. Needed about six times this amount before we finished packing… at least. We kept running out of boxes and having to send the owner for more. We packed the statues and big artwork on Saturday night after closing, took Sunday off, packed all day Monday (brought Elizabeth with me), packed the rest and moved on Tuesday (brought BOTH Elizabeth and Olivia with me), and set up all day on Wednesday (Elizabeth and Olivia switched babysitting Vincent and Abby partway through the day so Andy could get work done.) Reopened our store on Thursday! We didn’t finish unpacking for another few weeks, but all of the important things were shoppable. New store with empty shelves as we moved in and tried to figure out where to put things. (I was up high on a ladder hanging pictures on the wall-I call it tetris-ing them because I was trying to fit the most pictures I could on the wall that were all different shapes.) Thank goodness the owner hired a moving company to do all the real lifting and moving of the shelves and boxes. Three moving trucks showed up that morning and just cleared it all out. Olivia and I spent a lot of the moving time setting up our new Sweet Salt Clothing store connected to the bookstore. The company sent a lady to help us go through the 51 boxes of clothes that were sent to get the store ready for Thursday. Aren’t they cute!? Meanwhile on the bookstore side… everyone else worked to get the never-ending boxes of books put onto shelves and looking good. Andy had a few trips in the last bit for work, but nowhere too far. He still likes his job. He is keeping busy with Elders Quorum and we still do our weekly game night with friends too. We stopped by Andy’s sister’s house the day we got there to say hi and visited with her and her family for a little bit before heading back to the hotel to swim. 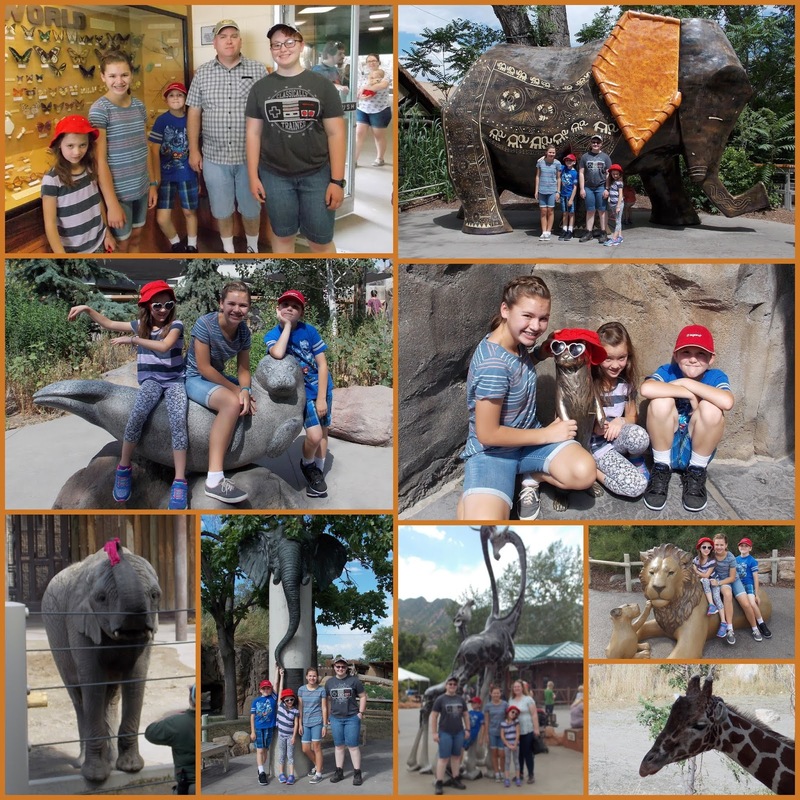 The next day we got up and headed to the Hogle Zoo while it was still a little cool. The kids liked the animals and the ‘monuments’ and Olivia, Vincent, and Abby wanted a picture next to all of them. 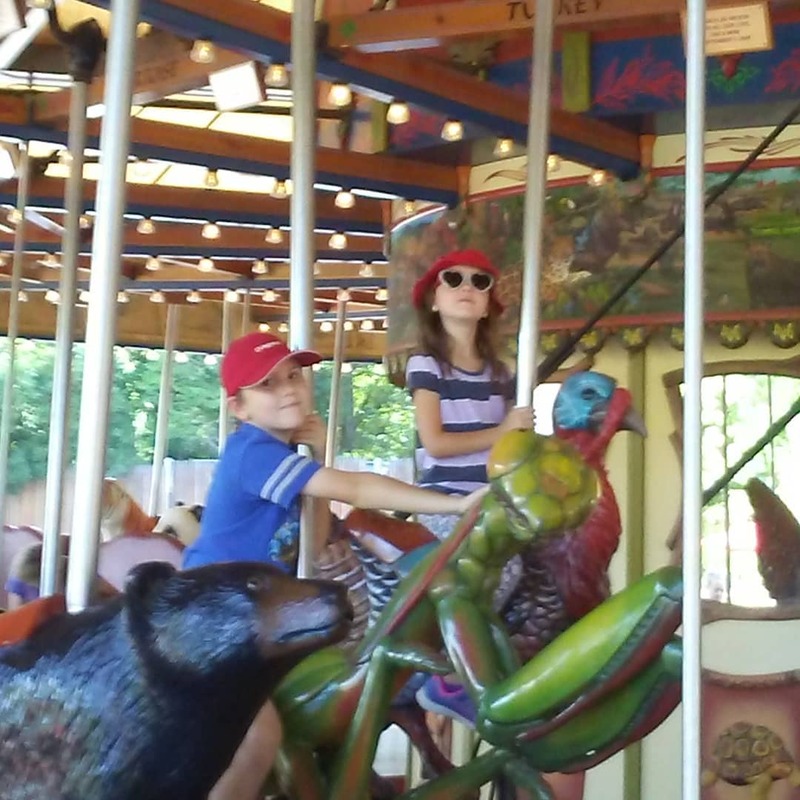 We paid a little extra for Vincent and Abby to ride the carousel. Vincent picked a praying mantis and Abby picked a rooster. 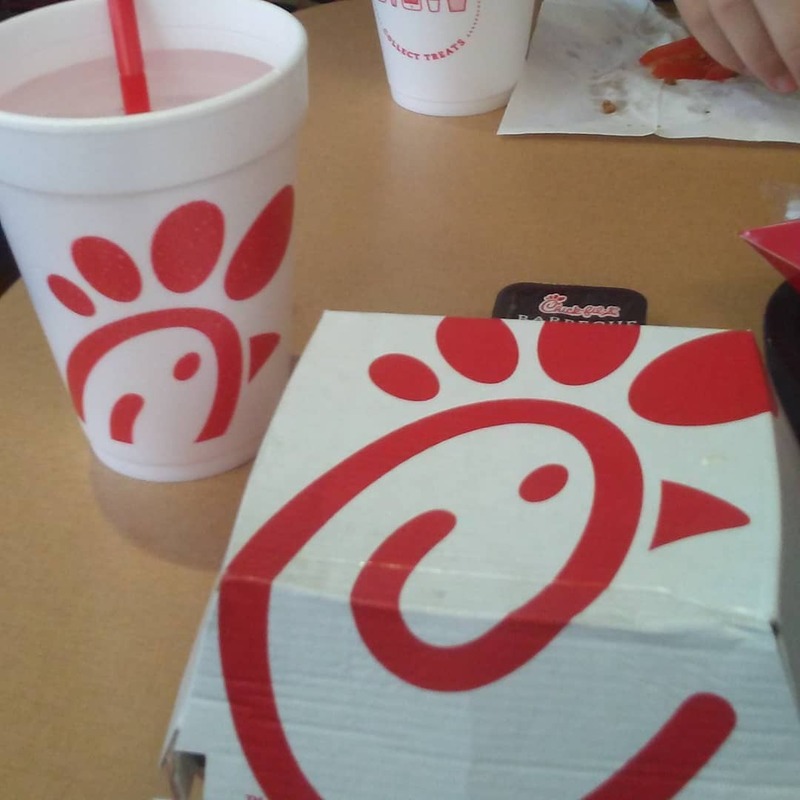 We went to Chick-fil-A for lunch. SO good! But apparently we didn’t order enough food for our hungry kids, so we had to stop and get something else a little later. 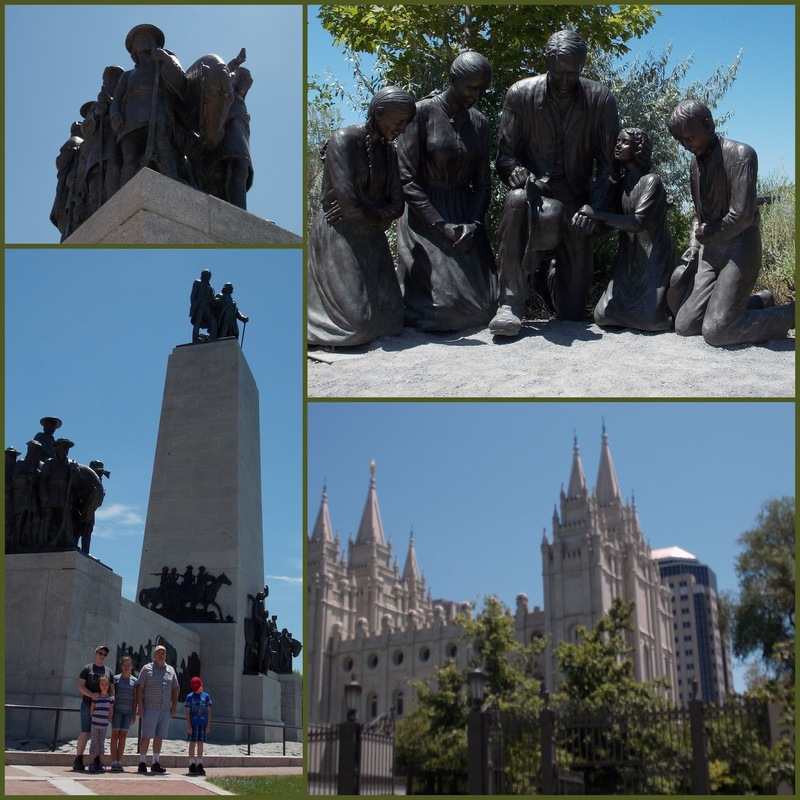 We headed back towards the zoo to go to the This is the Place Monument to the pioneers. 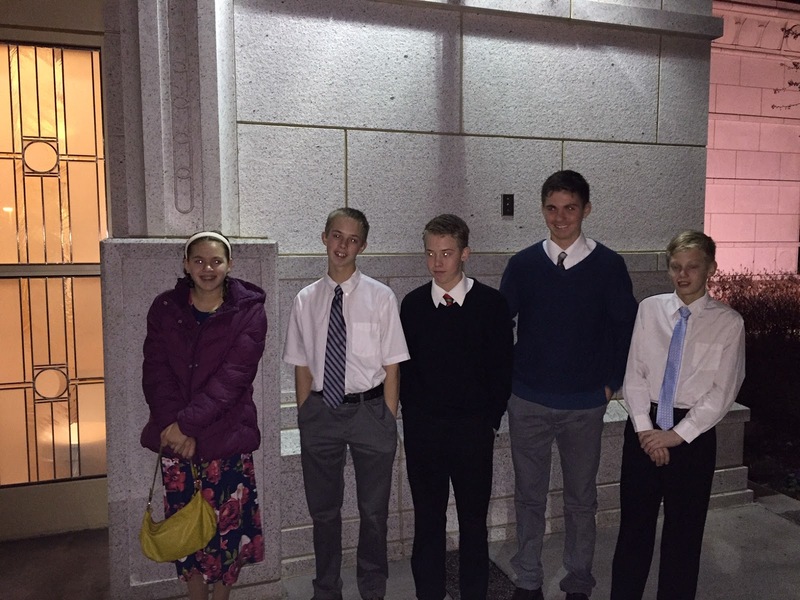 We also did a little drive by to see the Salt Lake Temple, but didn’t stop to visit there. Our hotel was awesome. We had the middle room on the top floor and we didn’t have neighbors underneath us, just a housekeeping room and then the lobby. We had two queens and a pull out hide-a-bed. 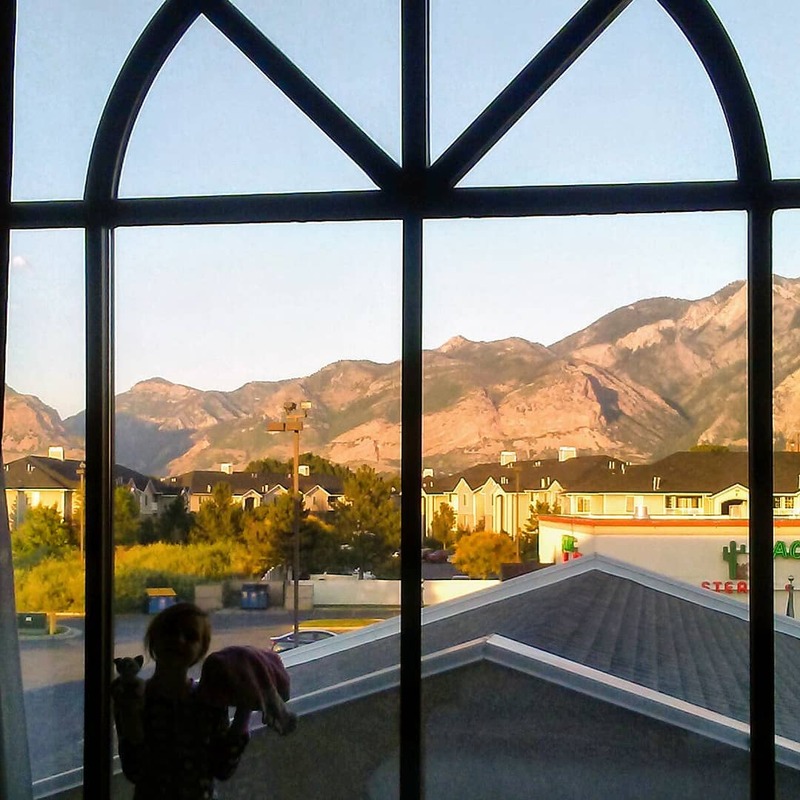 The view of the Utah mountains was very nice too! The next day we visited a friend who lived in Washington in our ward for a summer when Vincent was a baby ten years ago. It was fun to catch up with her and see her kids. We stopped for lunch at a sketchy McDonald’s and made a Walmart trip to get snacks for our trip home on Sunday and a few toiletries we needed too. 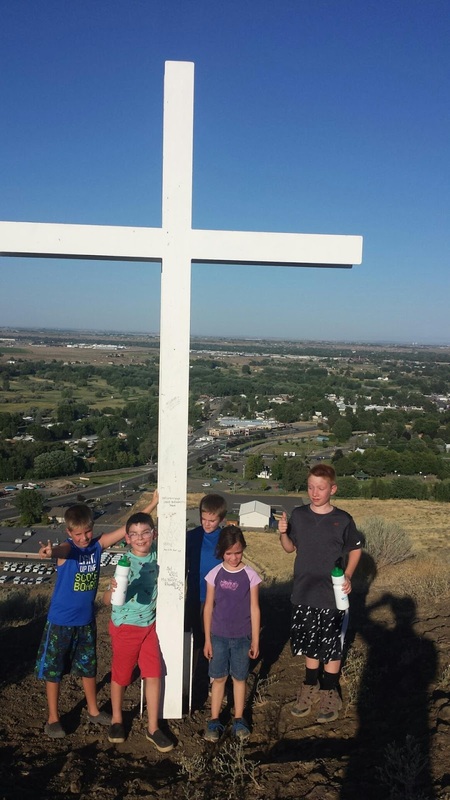 We drove around a highway that is near where the Saints first saw the Salt Lake Valley and went back to the hotel to rest and swim before heading back out to have dinner with Torrie and her girls and Andy’s parents. 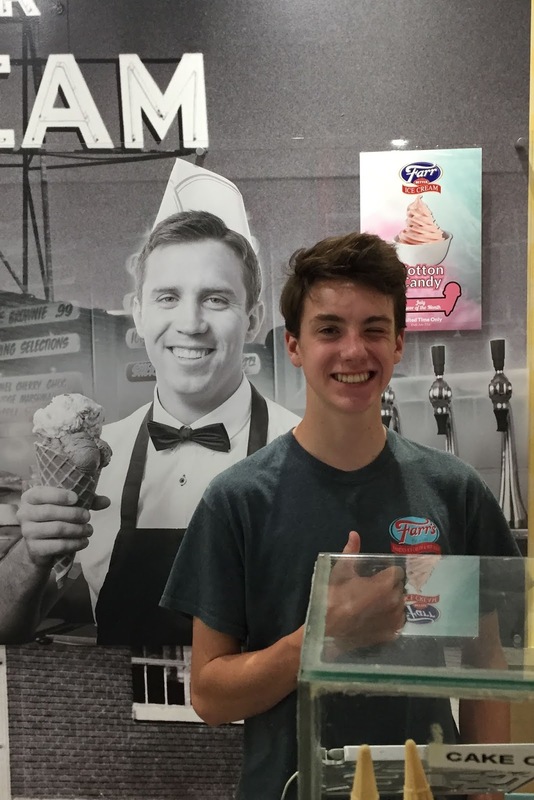 After that we headed to Farr’s Ice Cream to see cousin Jack at work and have some ice cream cones. They were delicious and so big! Thanks, Jack! 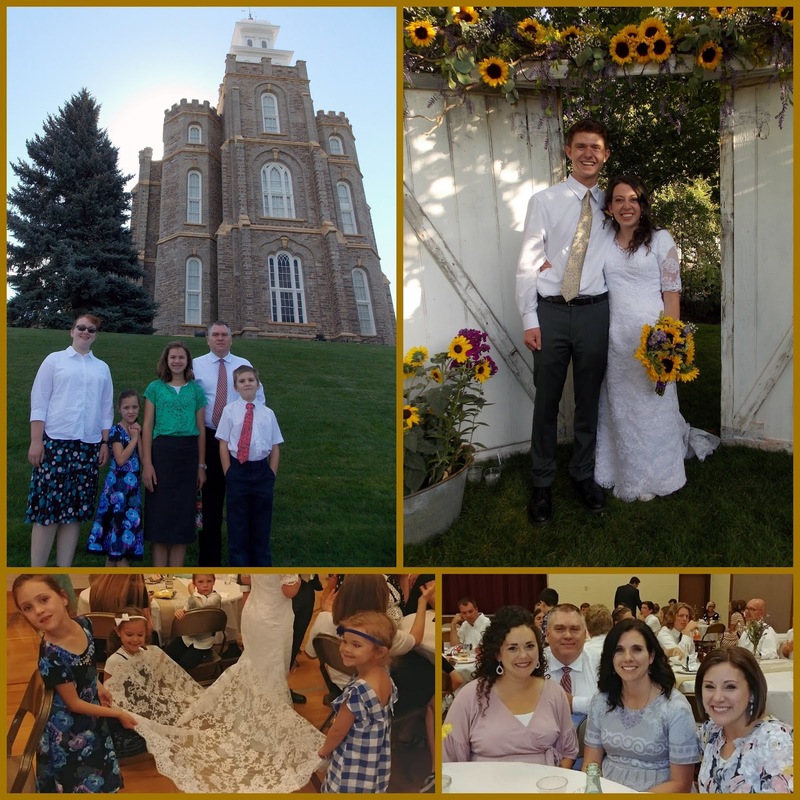 The next day was the wedding in Logan. It was beautiful and such a nice day. Blake picked a really sweet girl named Megan and they are both awesome. The luncheon was great and the reception was beautiful in Megan’s backyard. The only real downer of the wedding day was that Olivia sat in someone’s GUM they left on the concrete surrounding a flowerbed and we had to borrow a skirt from a cousin for the luncheon and reception so we could work on her skirt. And it was HOT too. 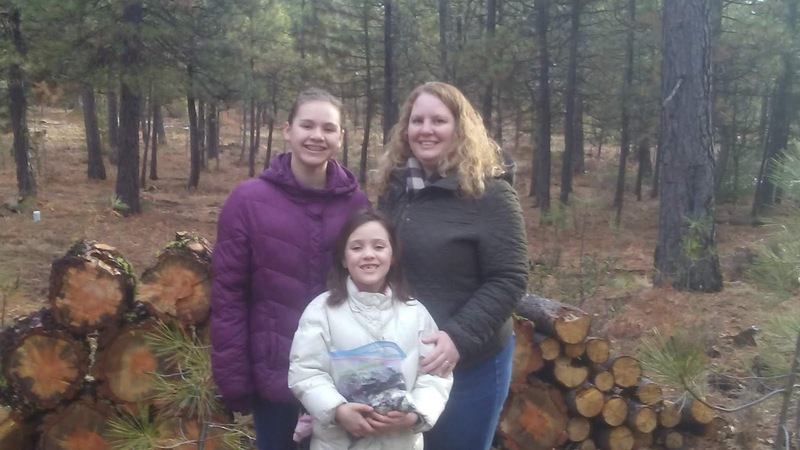 We drove home on Sunday and got home with enough time to get started on laundry so Elizabeth and Olivia could pack up to go to Walla Walla on Monday for Grandma Mary Quilt Camp. Normally they do it during Spring Break, but there was extra family in town then, so we delayed it until summer instead. It was perfect. They were joined this time by my brother’s daughter, Lydia and had a really wonderful time doing things with Grandma Mary and all together. See more details here, here, and here on my mom’s blog. They each made a quilt top and my mom is working on quilting them and then they will sew on their own binding. 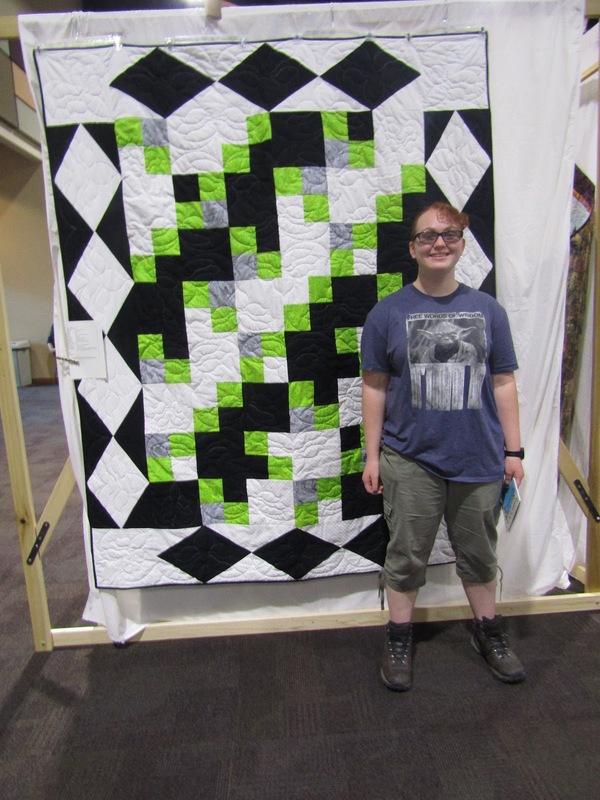 Elizabeth’s and Olivia’s quilts are both basic four-square patterns, but Elizabeth’s are larger blocks and they are set up differently. I love Lydia’s blocks mixed with the strips and the flower. Very cute! 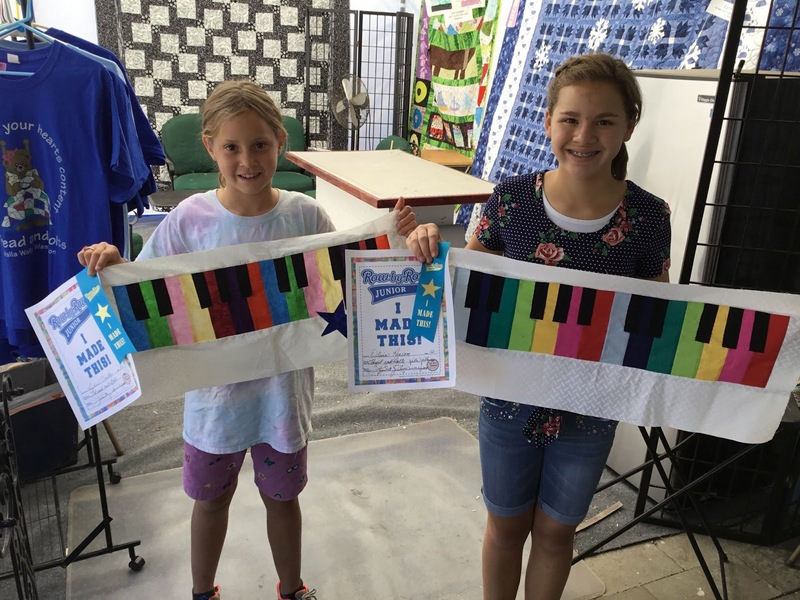 Lydia and Olivia did the Jr. Row by Row and won a prize at a local quilt shop for being the first kids to finish. I really like this rainbow piano block! 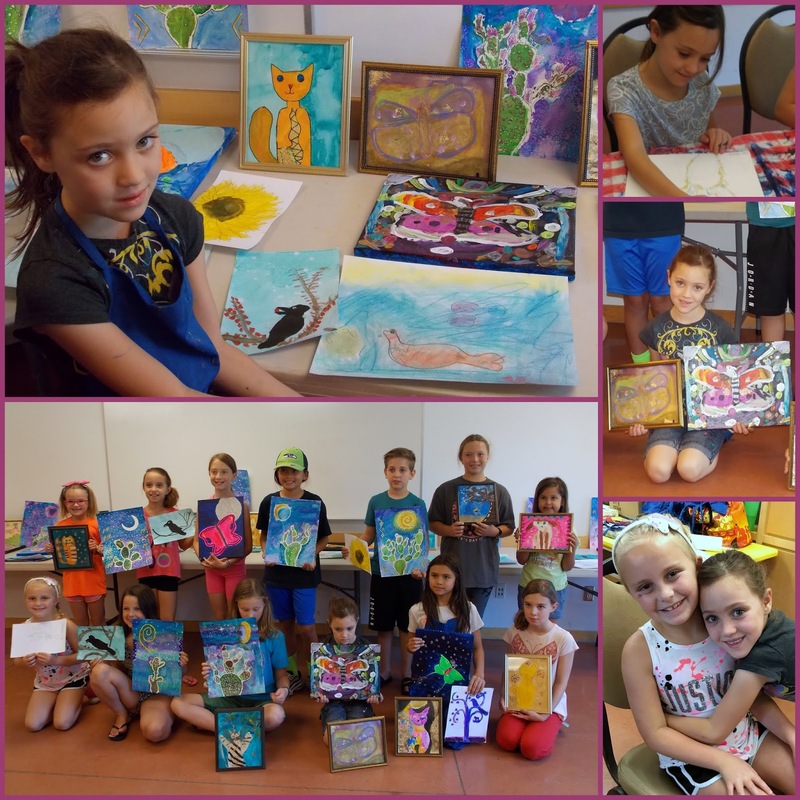 While the older girls were at Quilt Camp, Abby had a four-day Art Camp at the community center with a friend. They made several different paintings using a variety of techniques and styles. They even had a little gallery at the end of the last class. 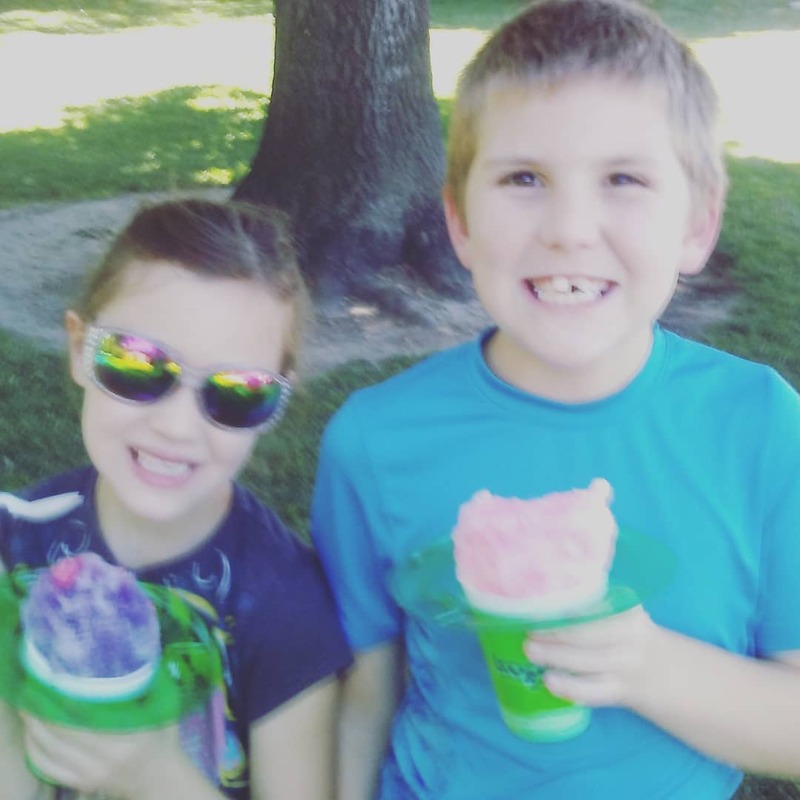 Also after the last class I took Vincent and Abby for snow cones close by. They loved that. MONUMENTAL CHANGE! I was released after three years serving as our ward’s Primary President. My first counselor was called as the new President and my second counselor had her fourth baby soon after the release. I don’t have a new calling yet, but I’ve been helping sub for classes over the last few weeks. I love the relief of all of the pressure and burden of a president calling being removed. 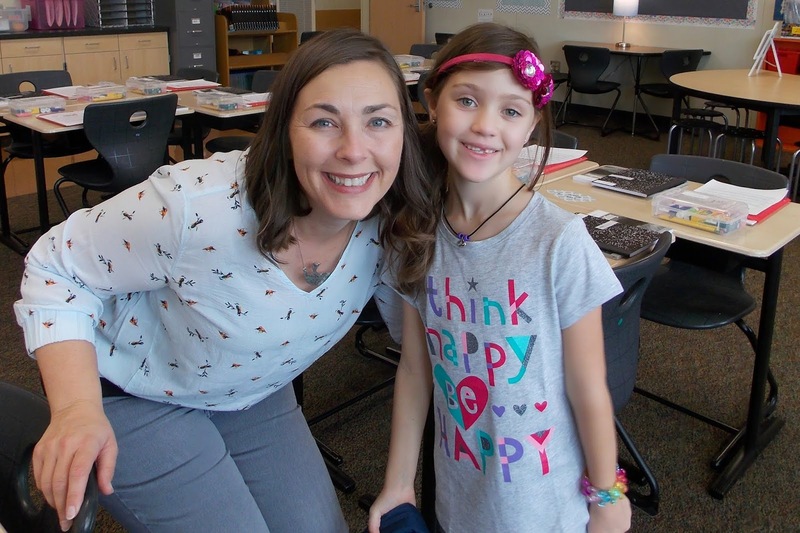 I loved the three years I served although it was really hard, especially the first year while I was also the PTA President at the elementary school AND working just about evening night 6-11pm AND had Abby home for one last year before kindergarten. That was a really rough year full of to-do lists and stress. I’ve enjoyed it a little more over the last few years. The kids are wonderful and it’s so nice to go back to teaching the basics of the gospel of Jesus Christ. The teachers in our ward are phenomenal and care so much about their classes and the kids and show up the majority of the time and find subs when they aren’t. I love that especially knowing how many other wards aren’t that way and have such a hard time getting people to serve in primary. I ordered a personalized pendant from my cousin’s husband who does wire wrapping. 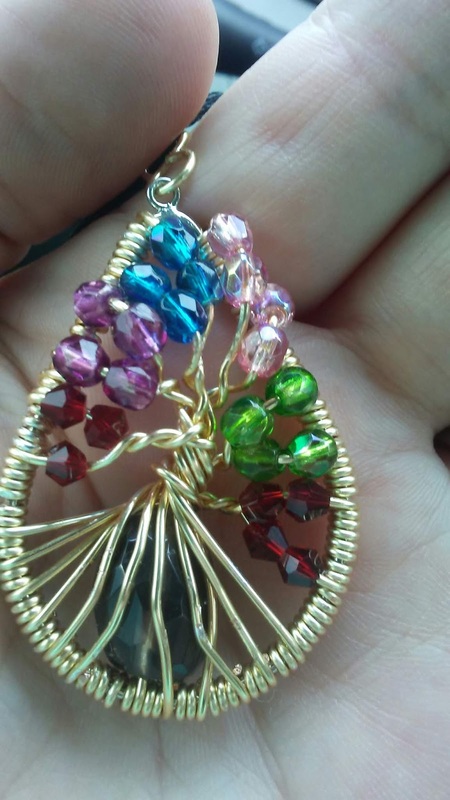 It has all the birthstone colors for each of the six of us in my family on a tree around a bead. I love it! 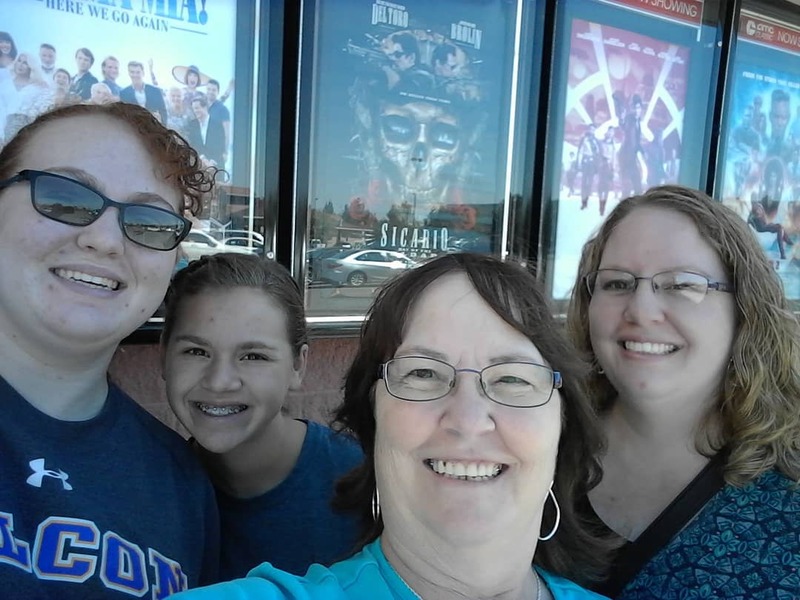 My mom watched Mamma Mia with the girls in Walla Walla in preparation for watching it in the theater the following week. So fun. I’m always a little worried about taking my kids to PG-13 movies because they always try to squeeze in as much garbage as they can, but this one was pretty well done and fun to watch and didn’t have anything in it that made me wish I hadn’t brought my teenager daughters. 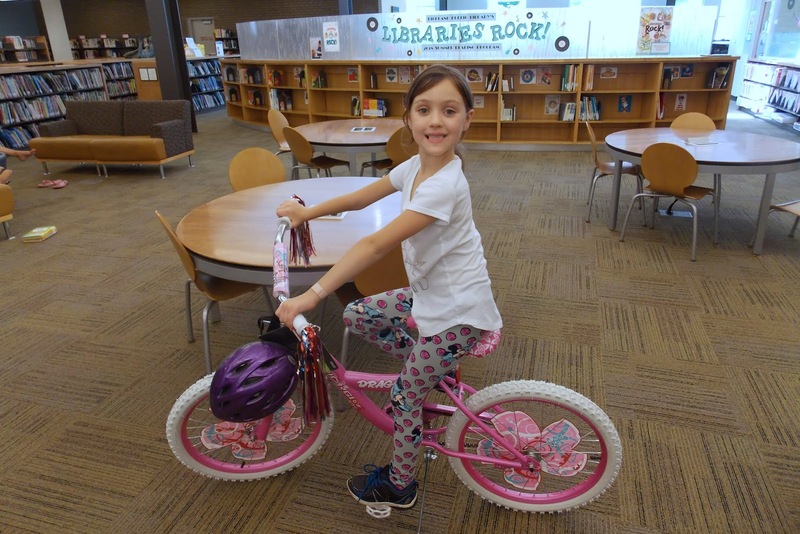 While Elizabeth and Olivia were at Grandma Quilt Camp, we got an email from the public library that Abby won a bike in the bike raffle. To enter kids write a little book review on a third of a piece of paper and put it in a box with the box with the size and color of bike they need. Abby filled out two of them and won. So very cool. She also got a new helmet and a bike lock. She worked on learning how to ride it herself for a few weeks and then Vincent WON ONE TOO!!! He had three turned in when Abby won and then turned three more in. 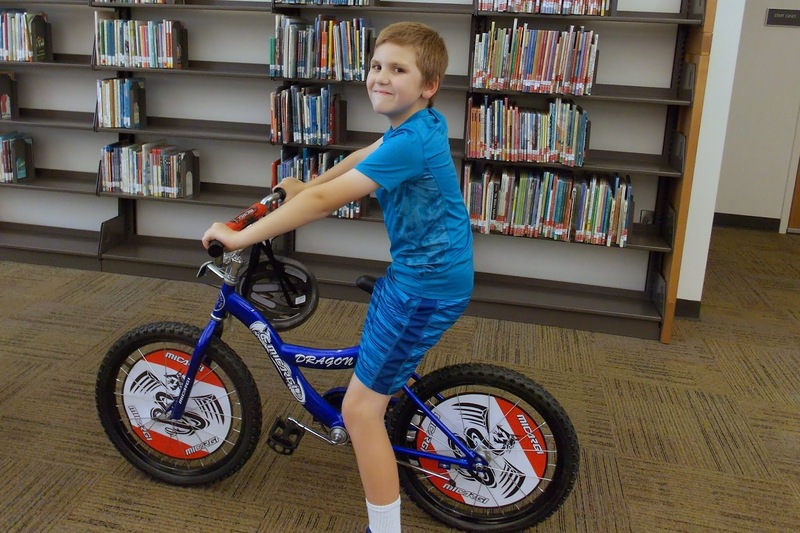 They had probably 30 bikes donated to the library to give to kids, but that was really cool and the time and effort the reviews took were totally worth it. 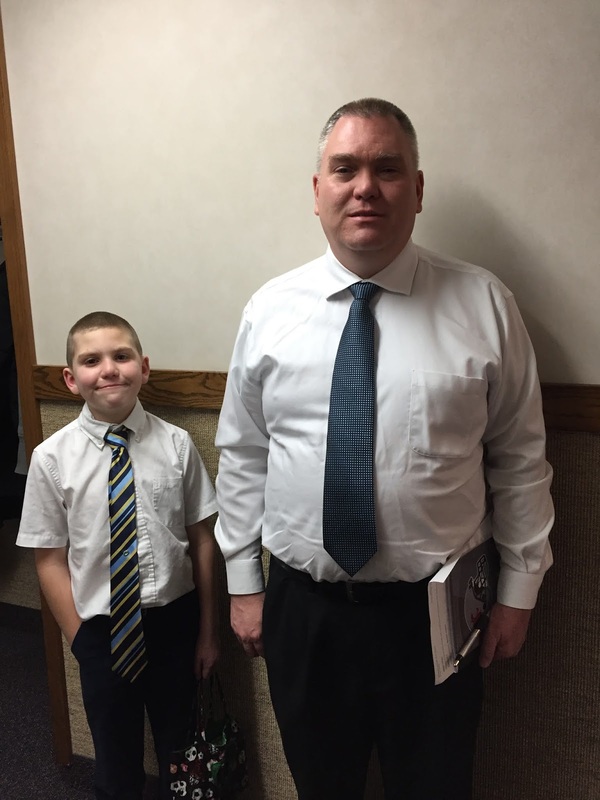 After Vincent’s bike was picked up, I took them to the school close by to work on riding them while Andy had a meeting at our house with his Elder’s Quorum Presidency. Vincent took a few laps around the school while I helped Abby figure out how to start on her own and take off. She figured it out! She had some good practice sessions with both Olivia and Andy before I helped, but I’ve never been the one to helps kids learn and it work. Yea! She was so excited! 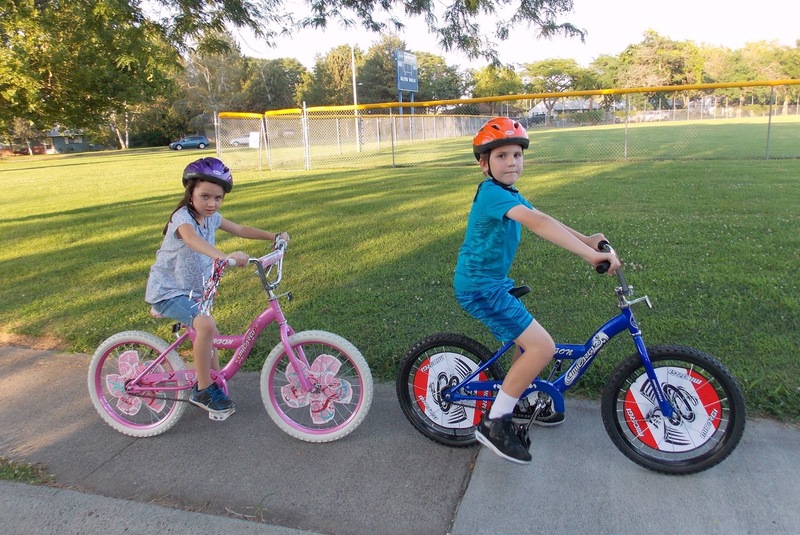 They still don’t get to ride them to school because there’s just too much traffic and I’d rather not worry about the bikes getting stolen or them getting run over by cars or them running over other kids walking, so they can ride at home in our neighborhood. Big news for my job is that our store is moving about a mile away in August. 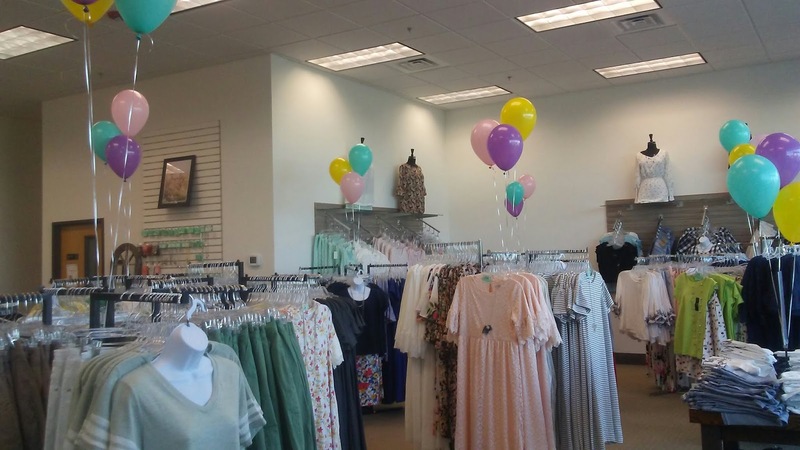 It means a lot of work to pack everything up for the movers to move and then set everything back up again at the new location, but the location is SO much better and easier to find and we will have a Sweet Salt Clothing store attached to our store (connected, but with a dividing wall). We are excited. I’ll let you know how that goes. I am scheduling my chiropractor adjustment and massage for the following day. Vincent had his braces put on the last day of July. He is SO excited to show them to everyone and to have a smile he can show more and not be so self-conscious about. 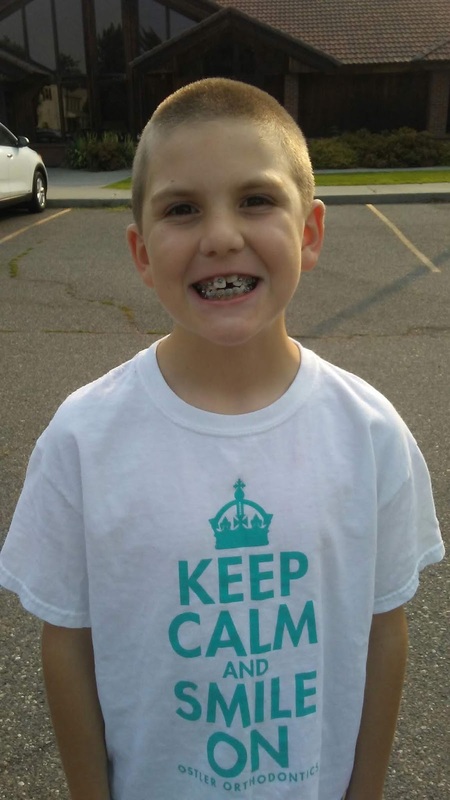 He doesn’t have all his permanent teeth yet, but needed braces before they all come in to make room for them.